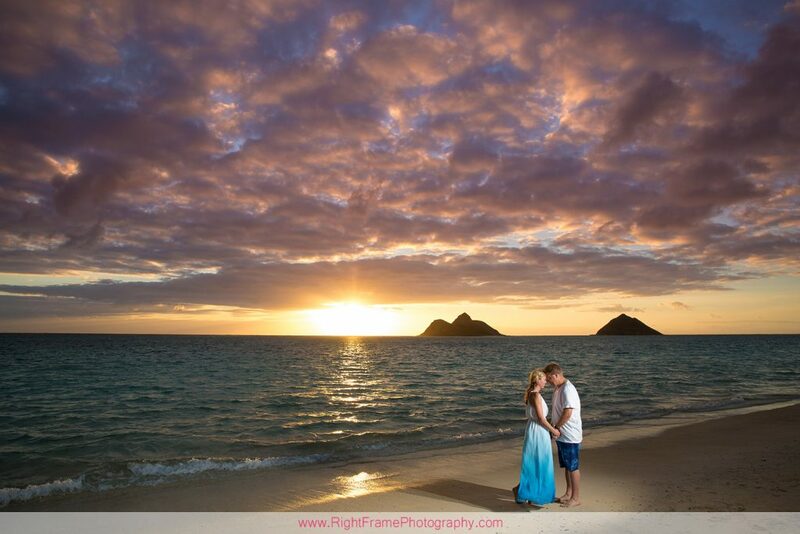 Sunrise at Lanikai Beach, Kailua Oahu. 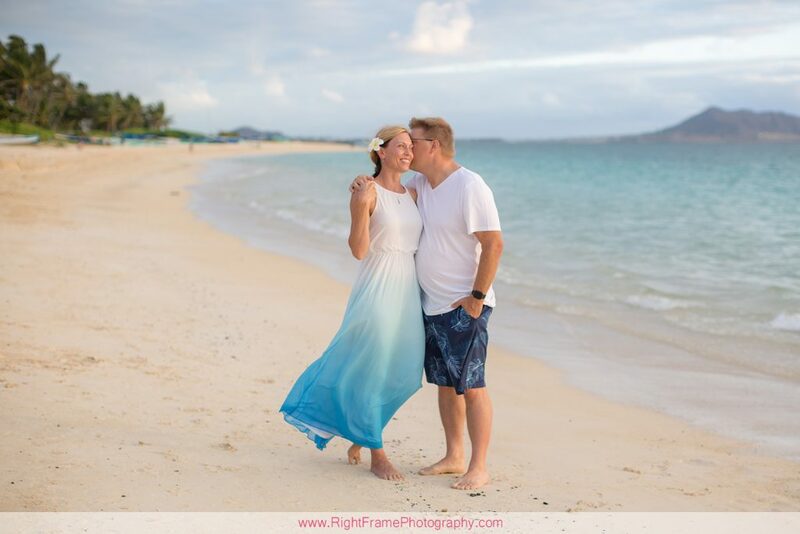 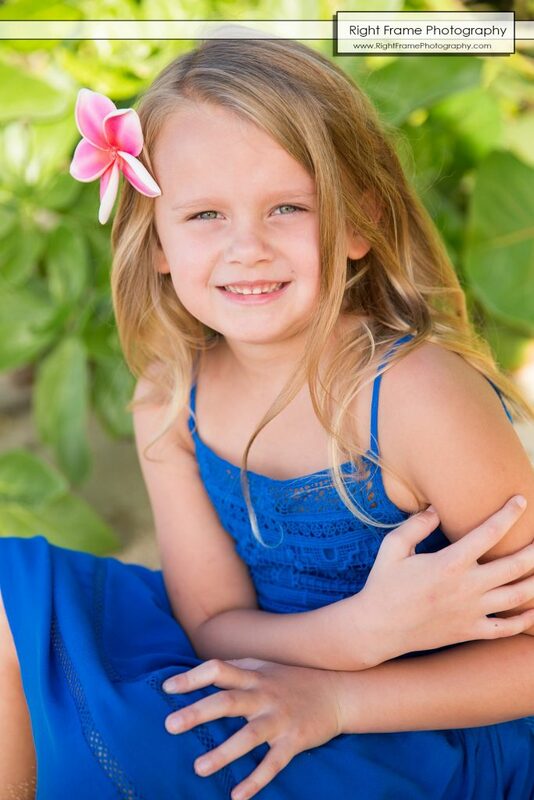 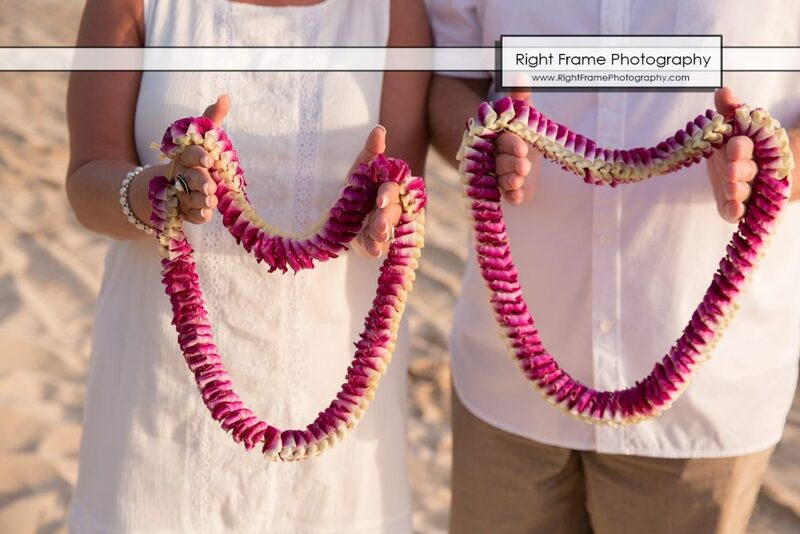 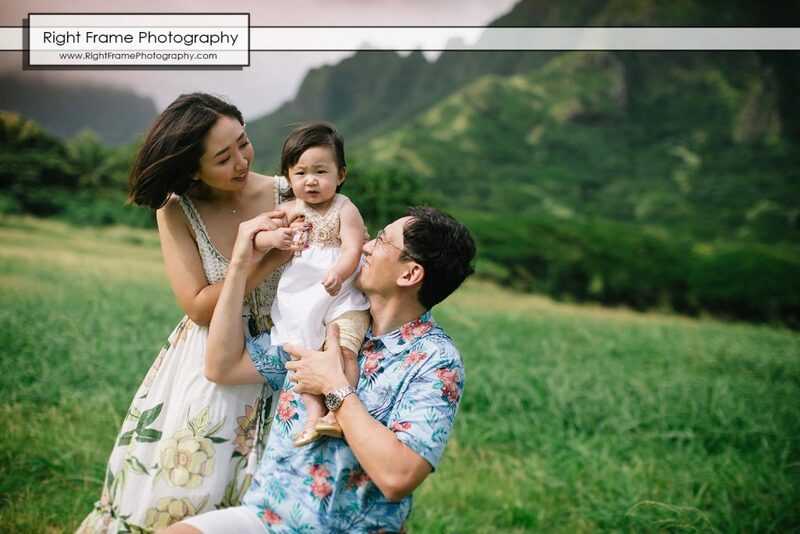 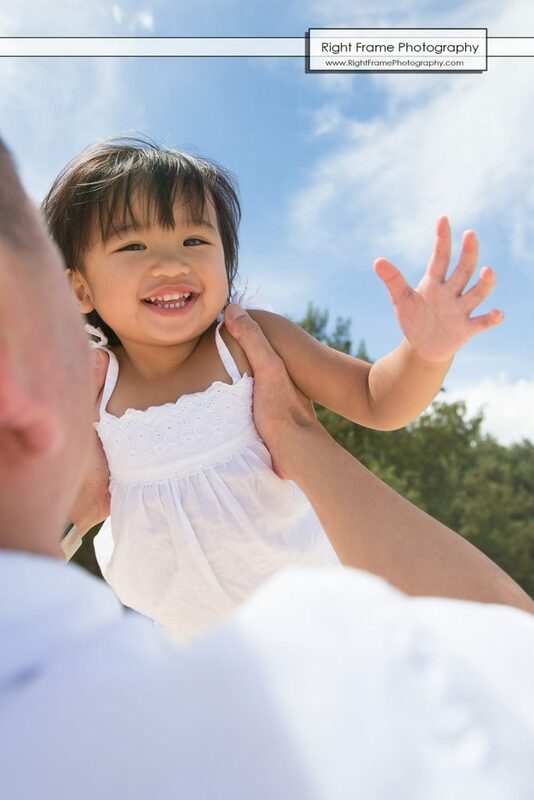 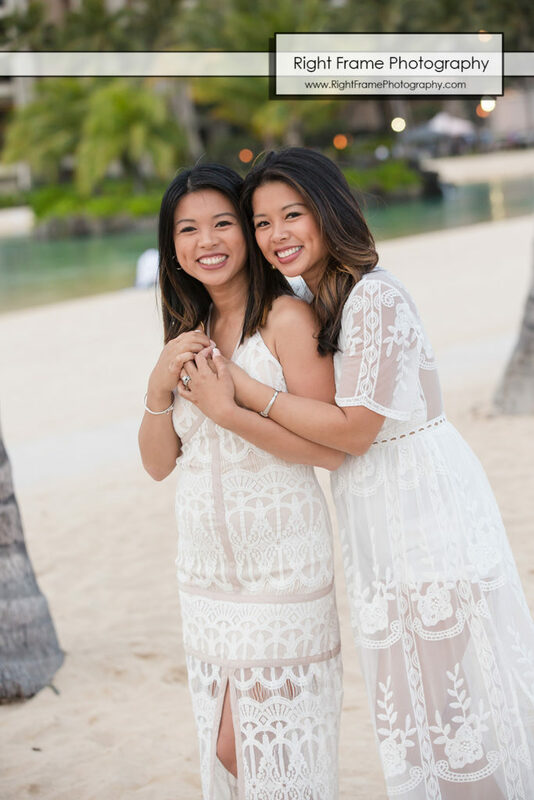 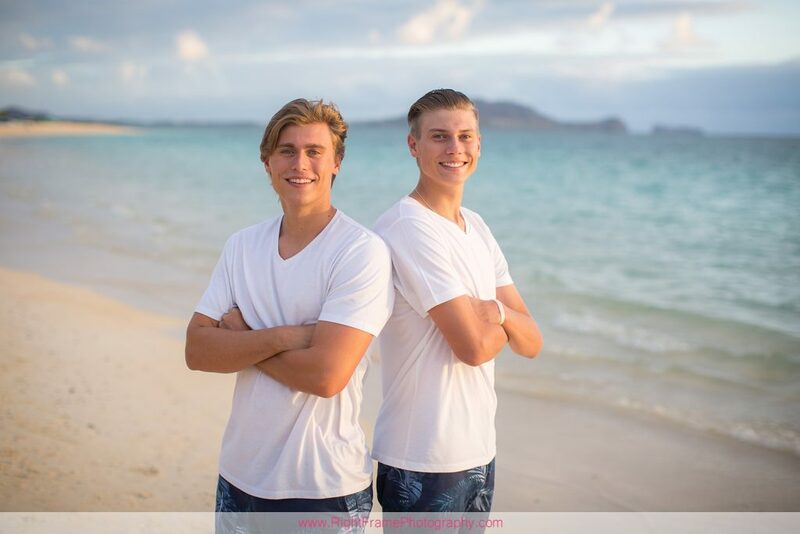 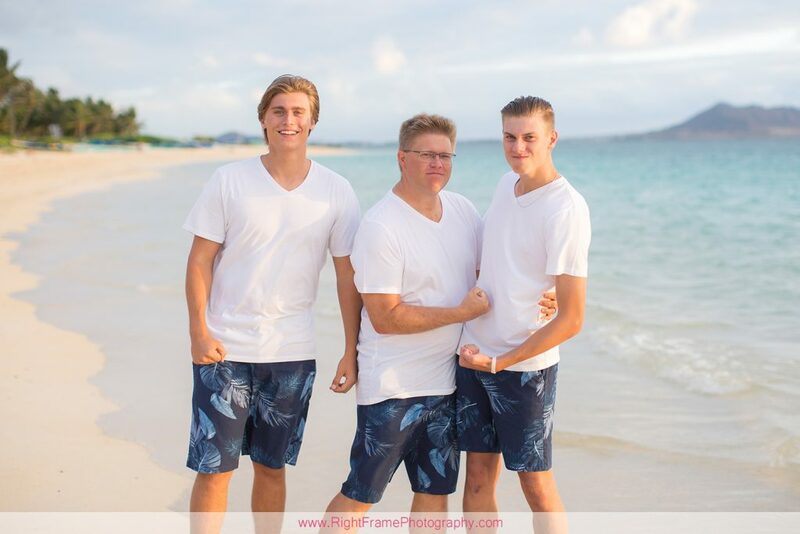 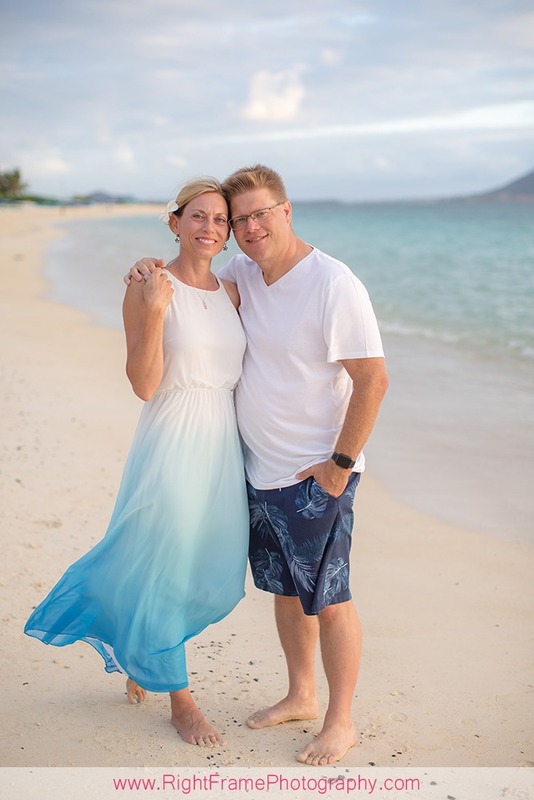 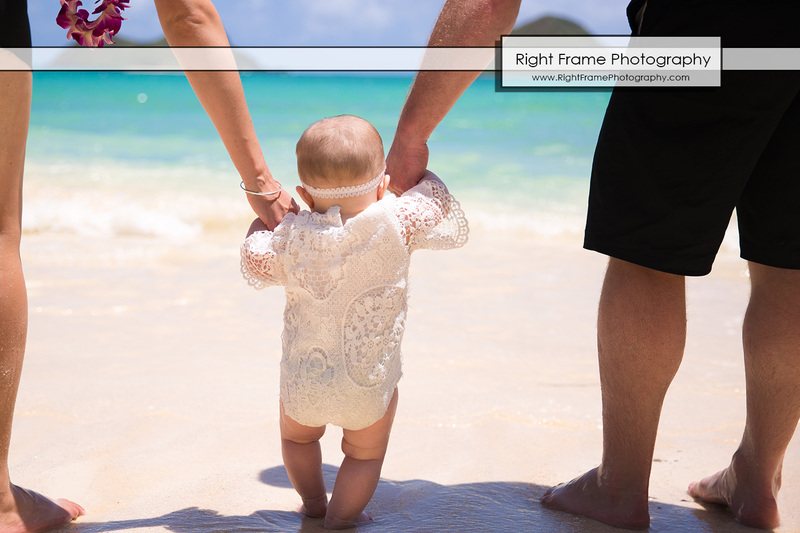 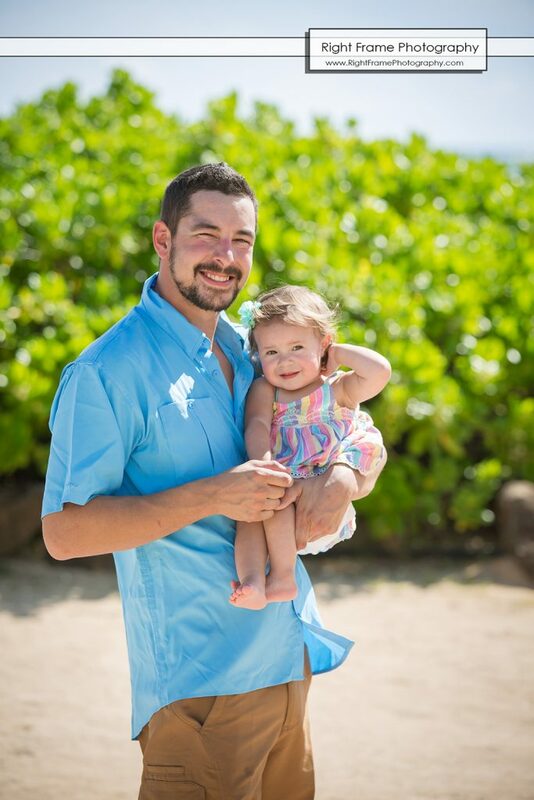 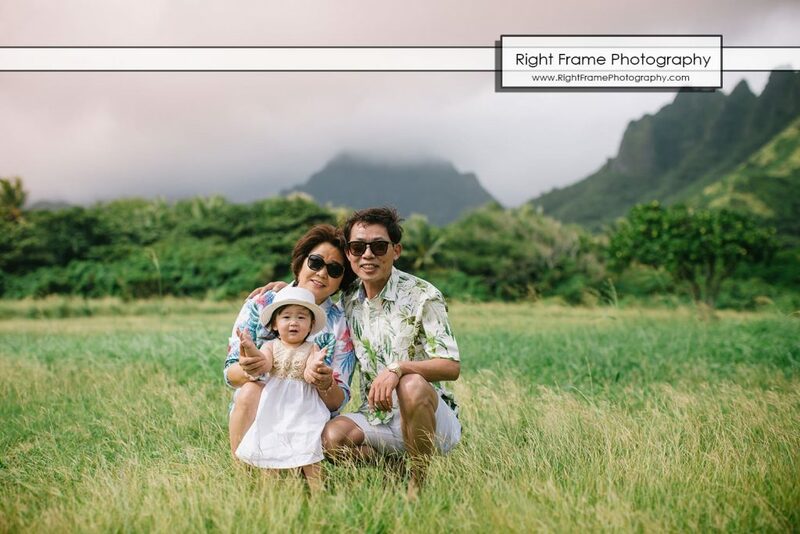 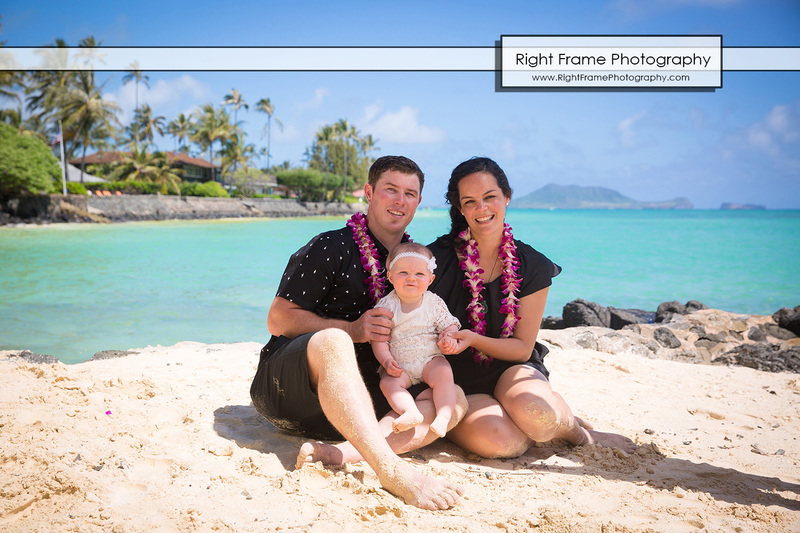 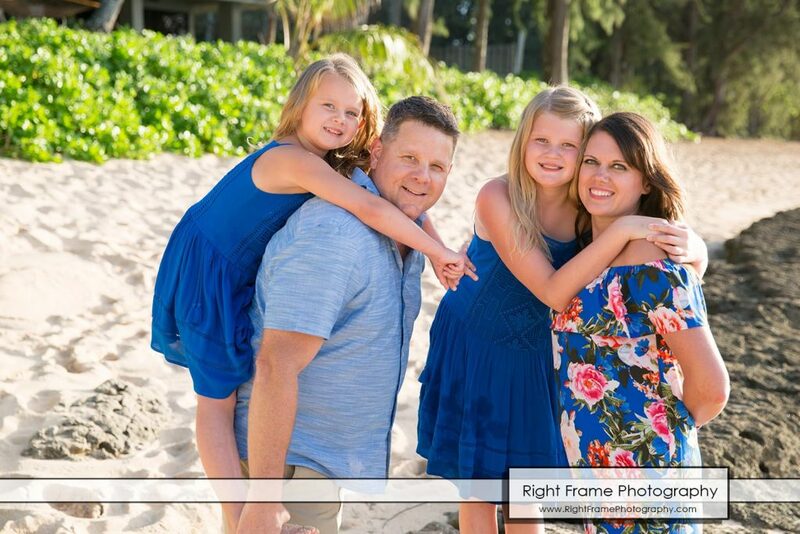 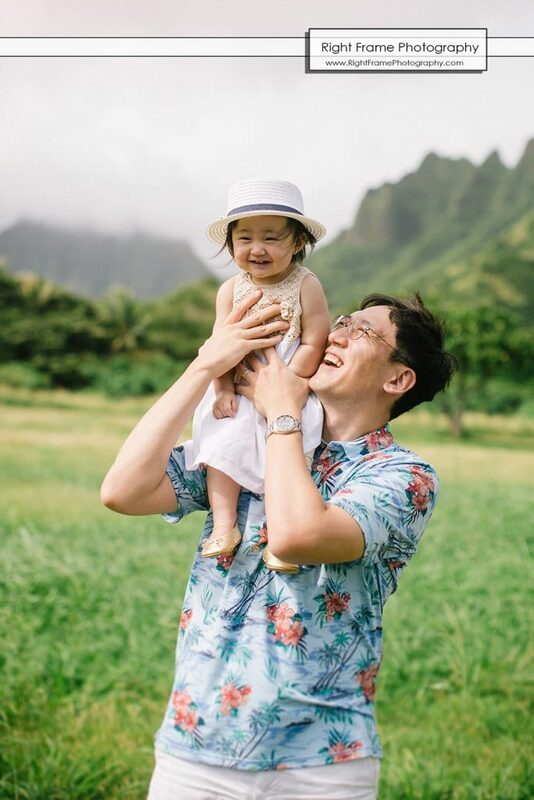 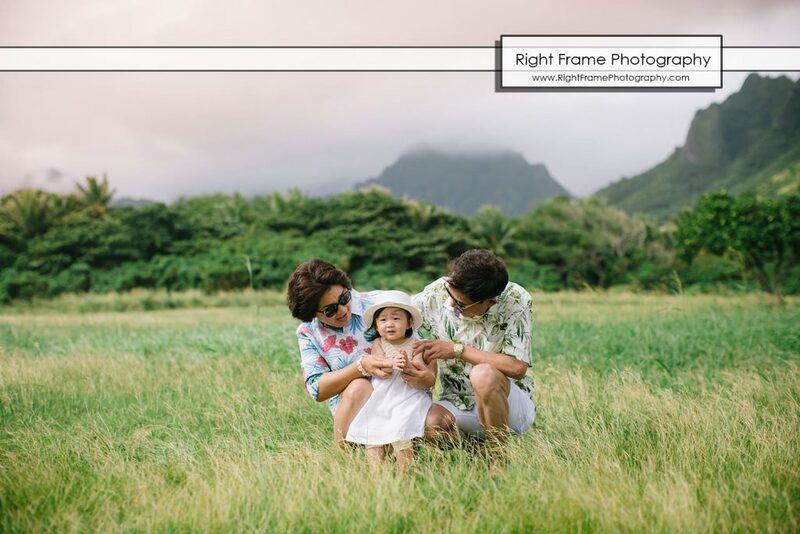 Photographed by Kailua Family Photographer – Right Frame Photography. 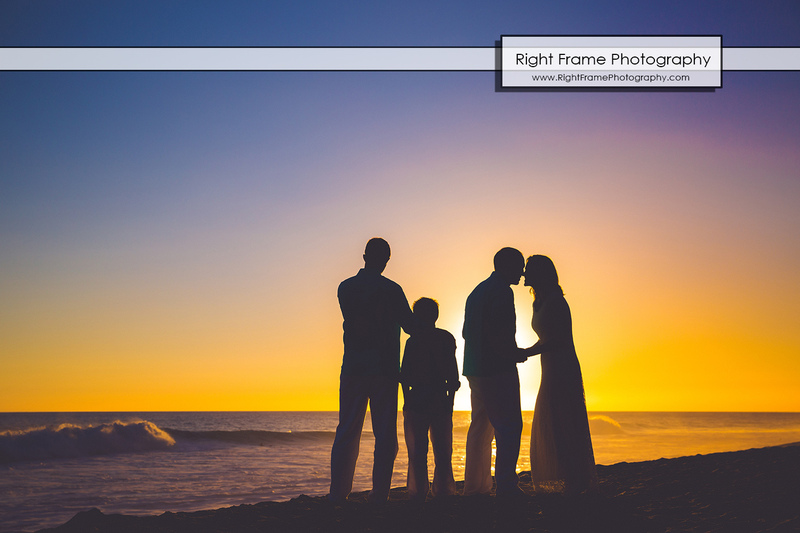 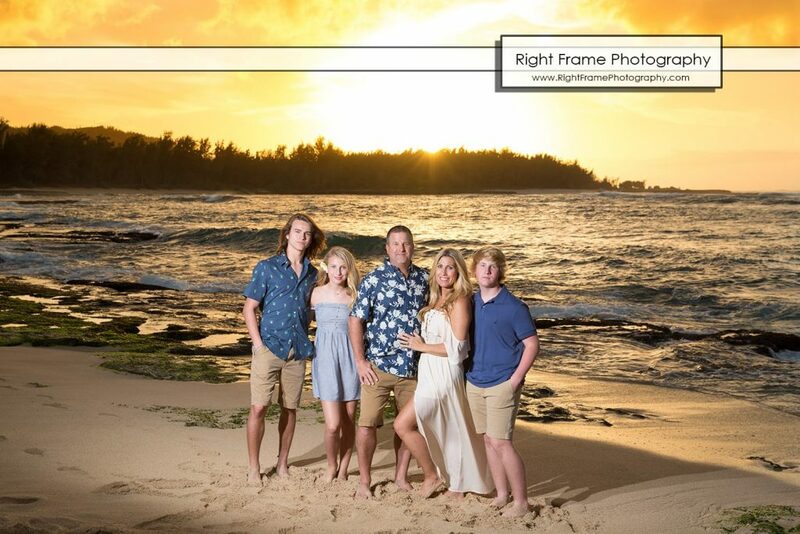 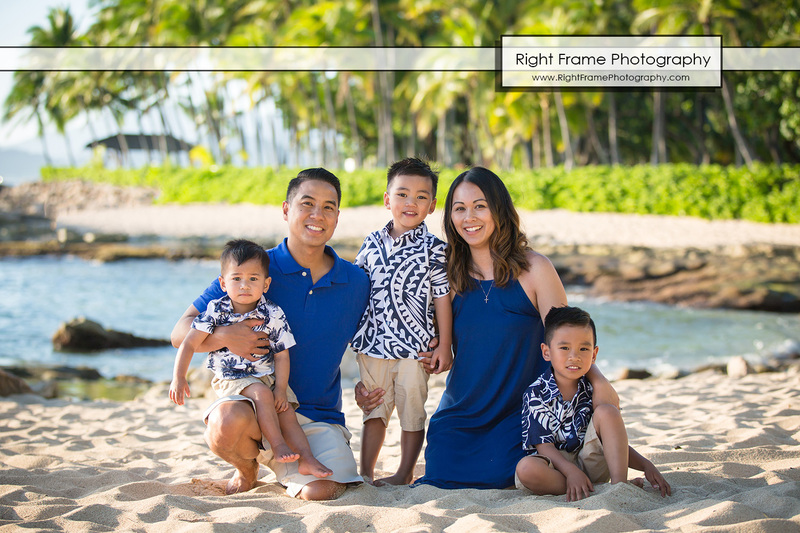 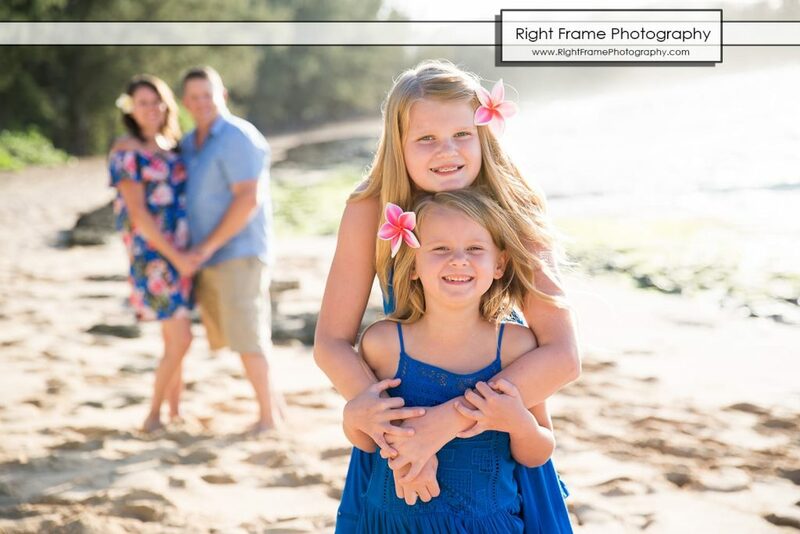 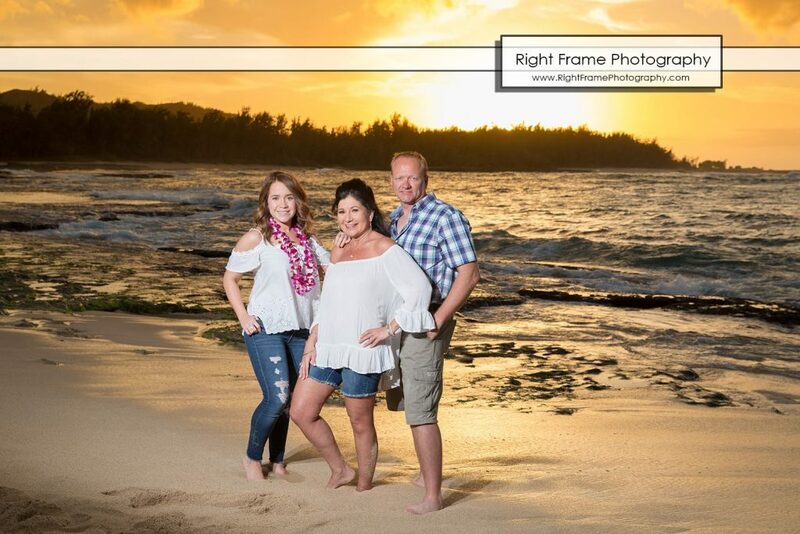 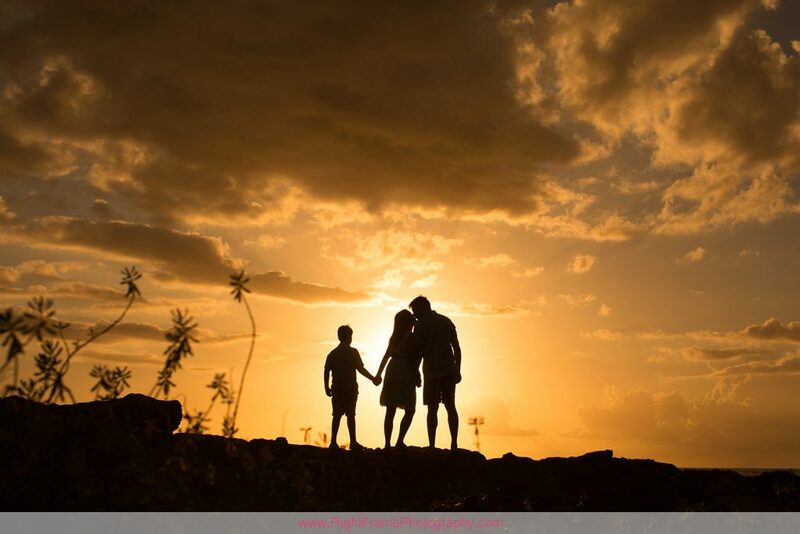 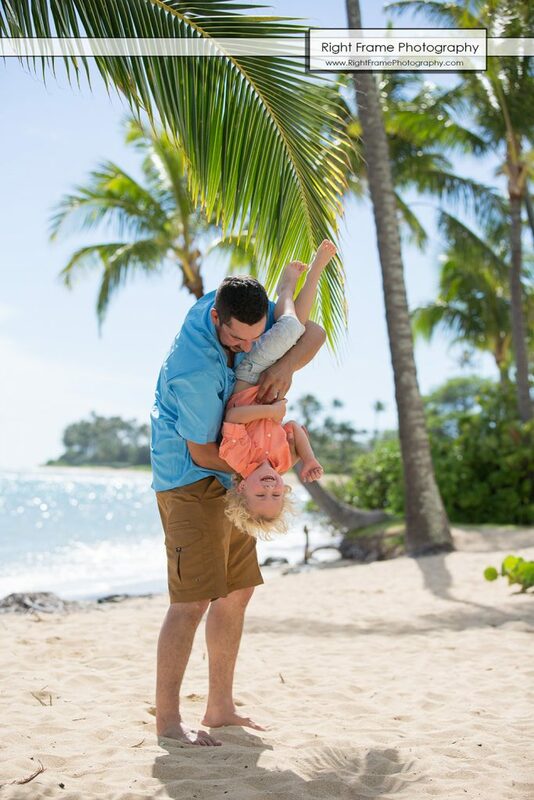 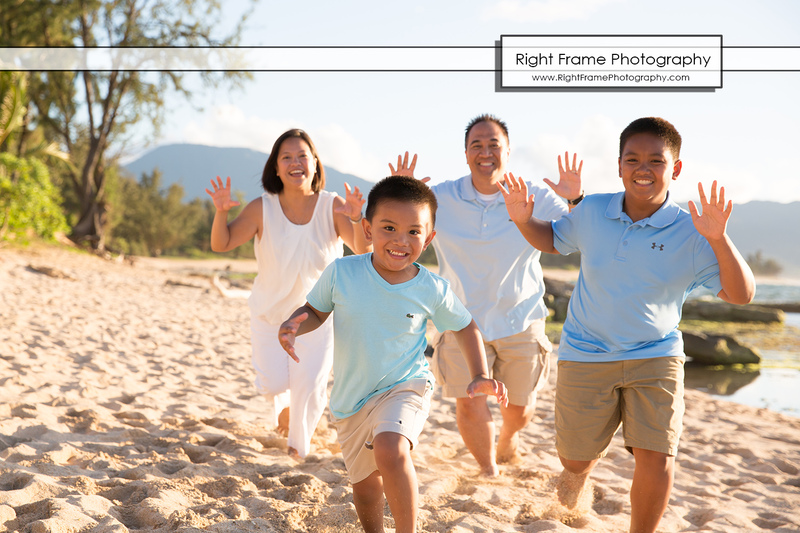 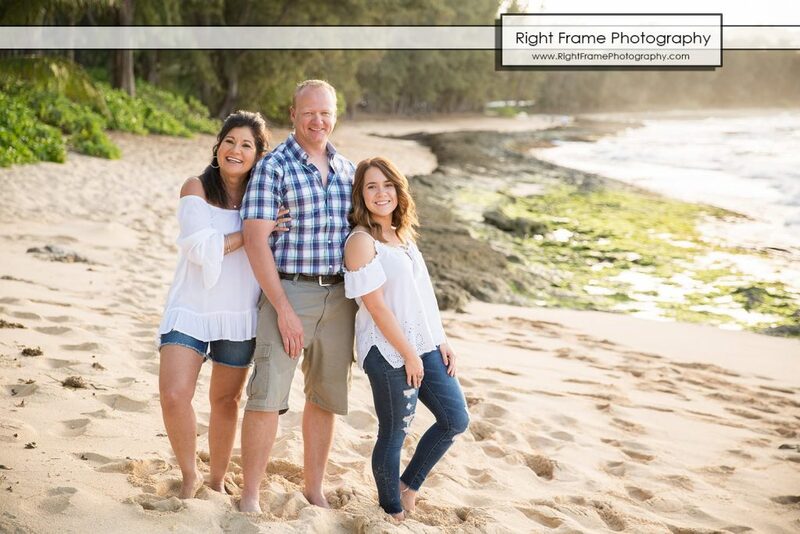 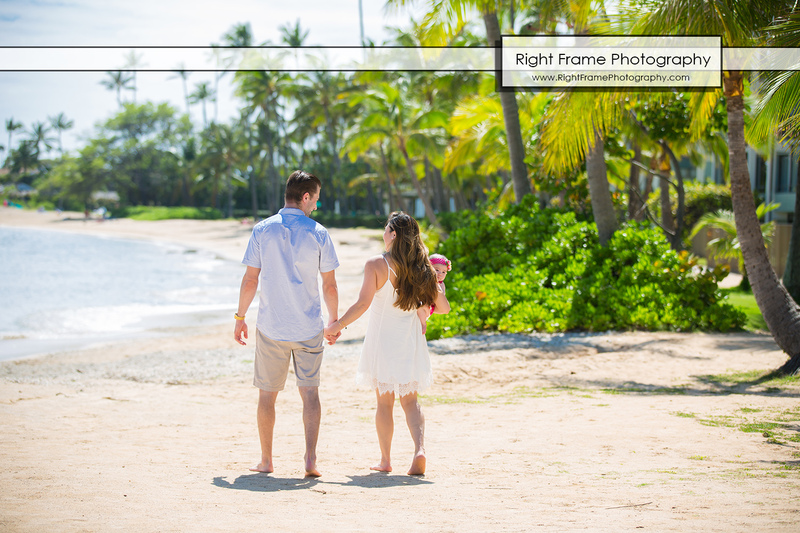 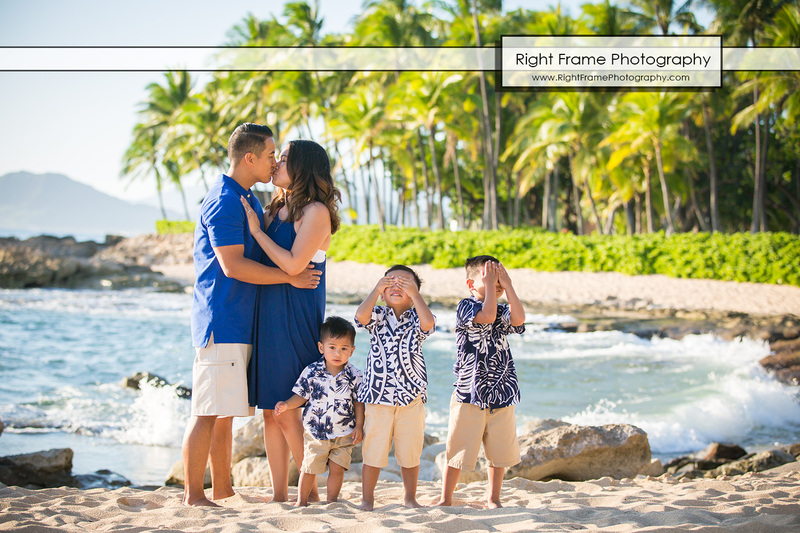 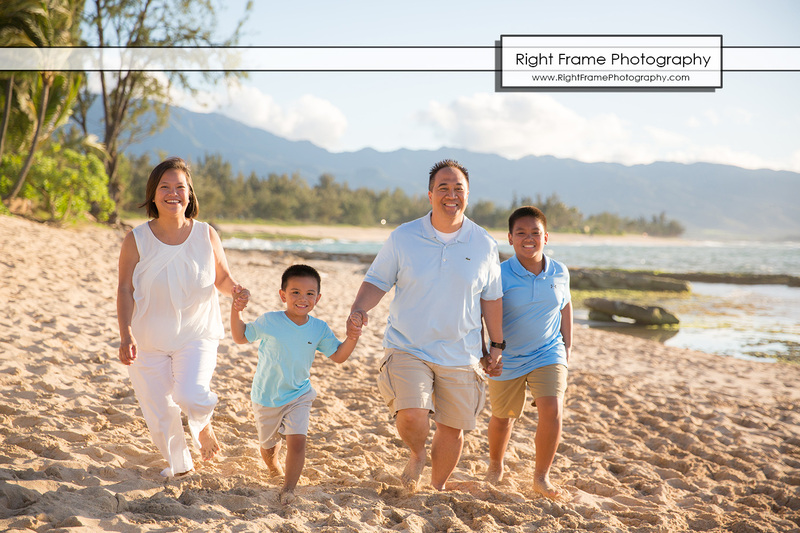 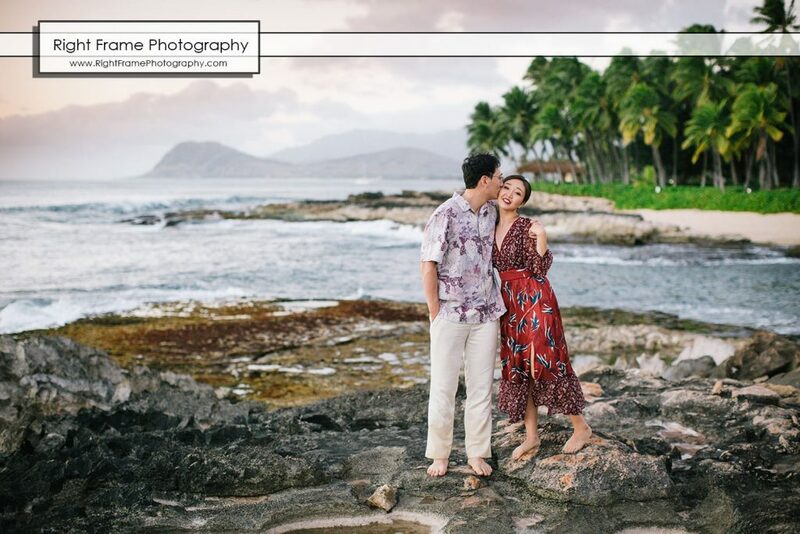 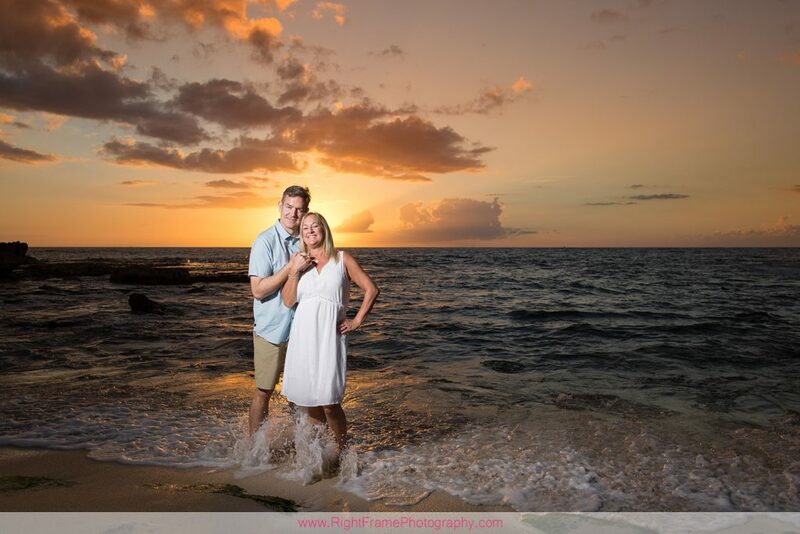 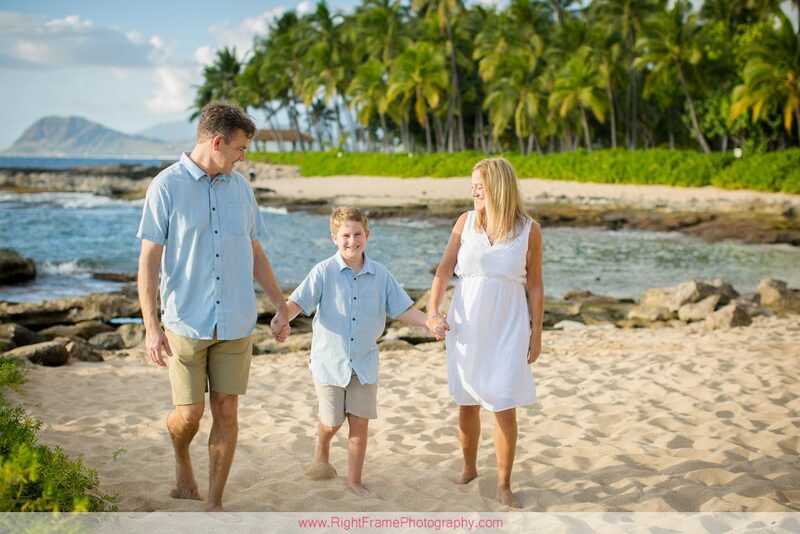 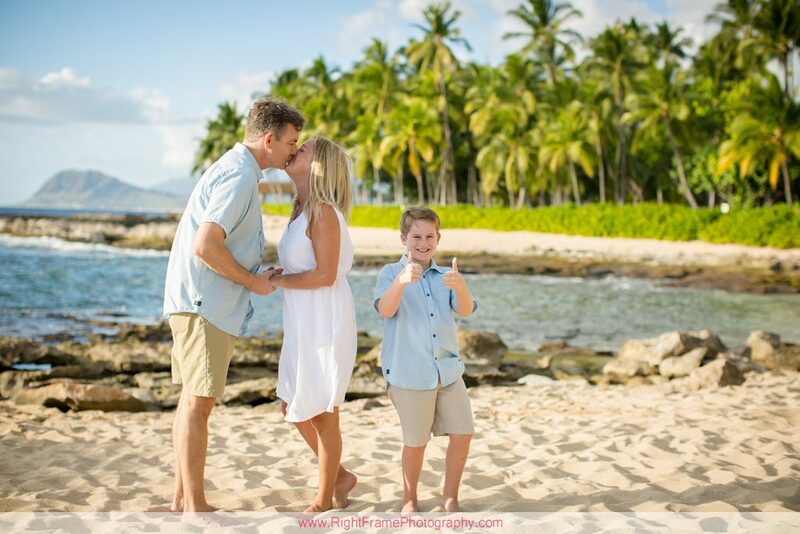 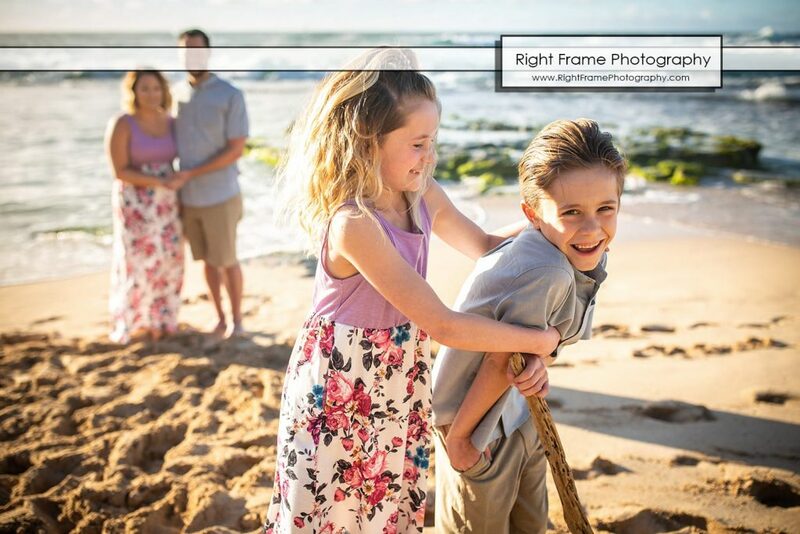 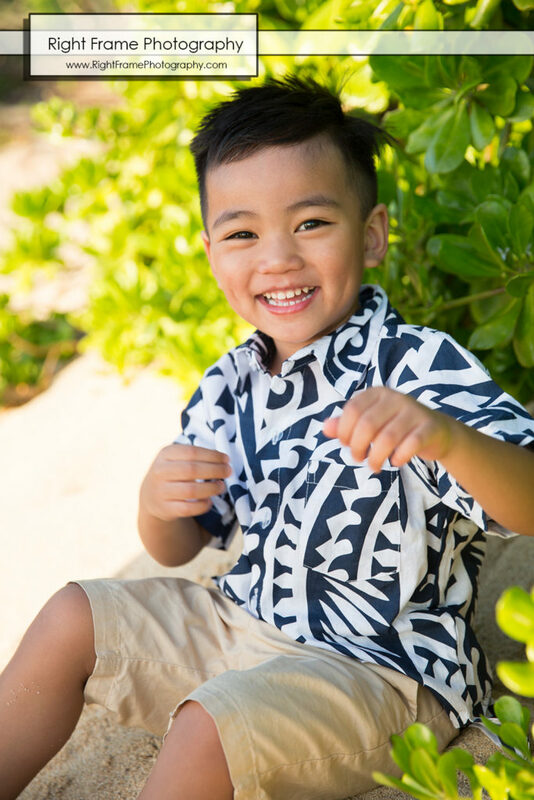 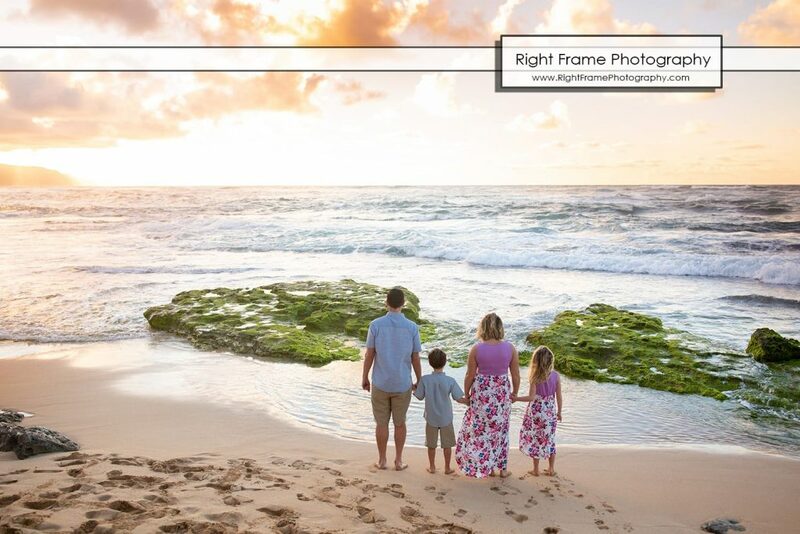 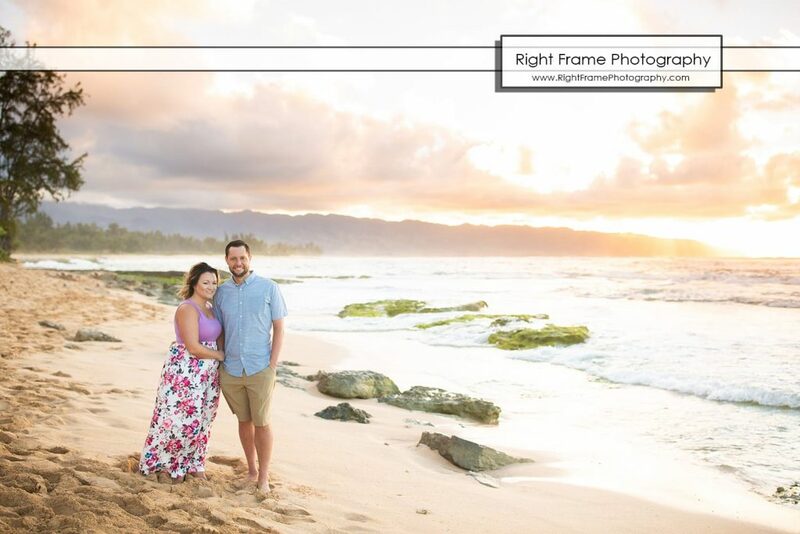 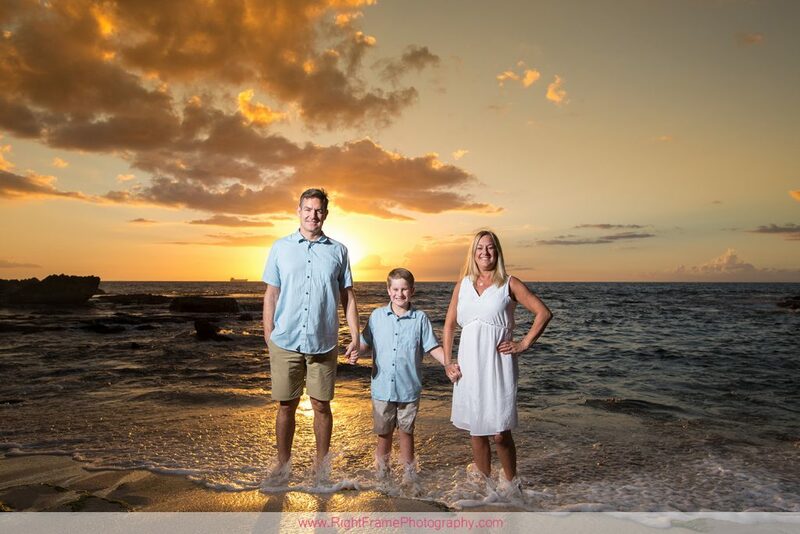 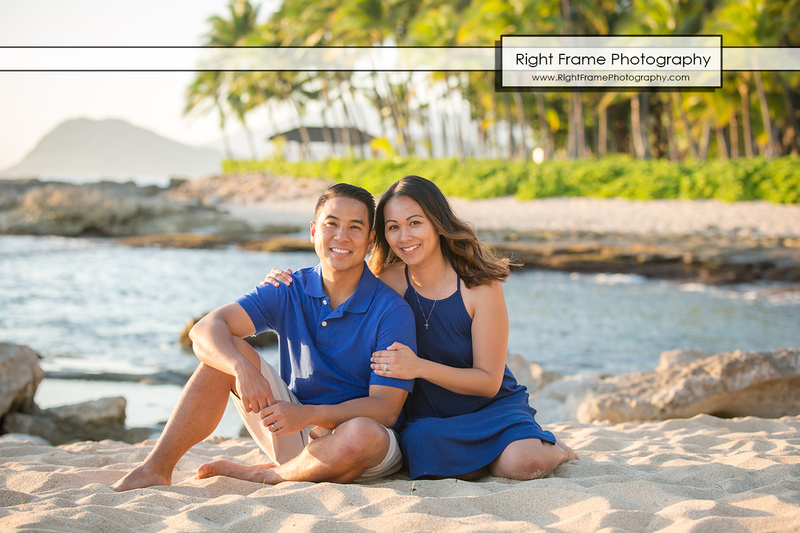 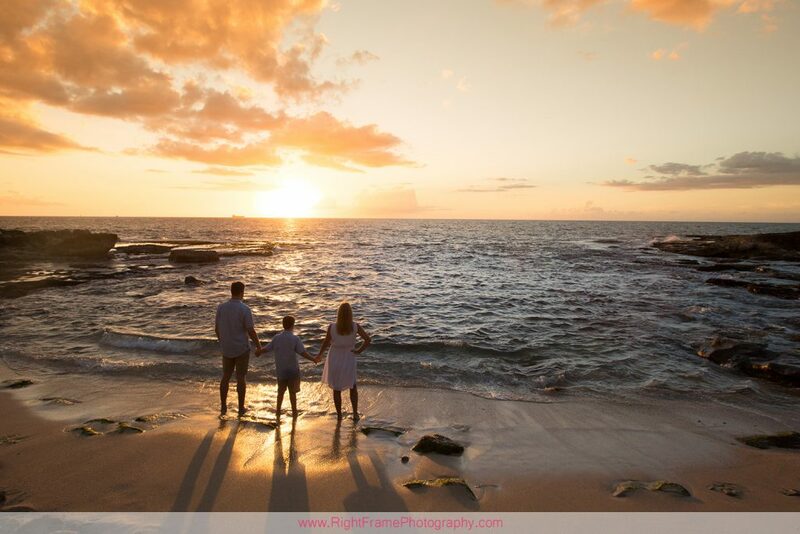 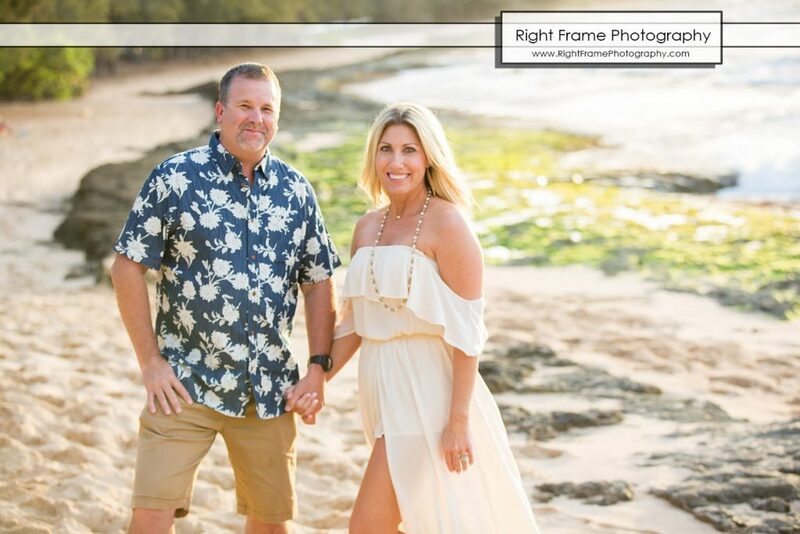 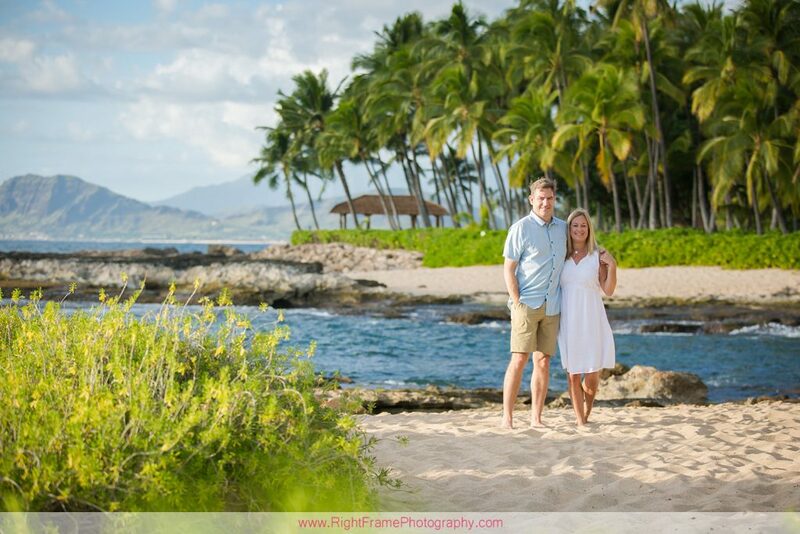 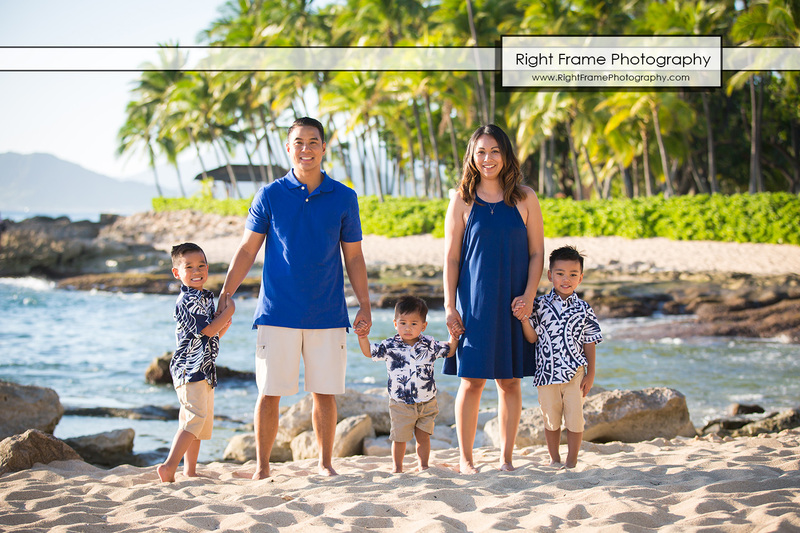 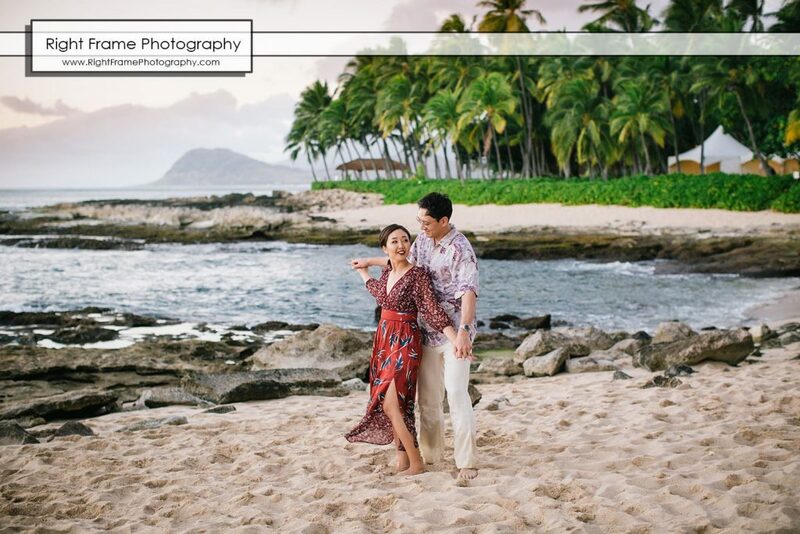 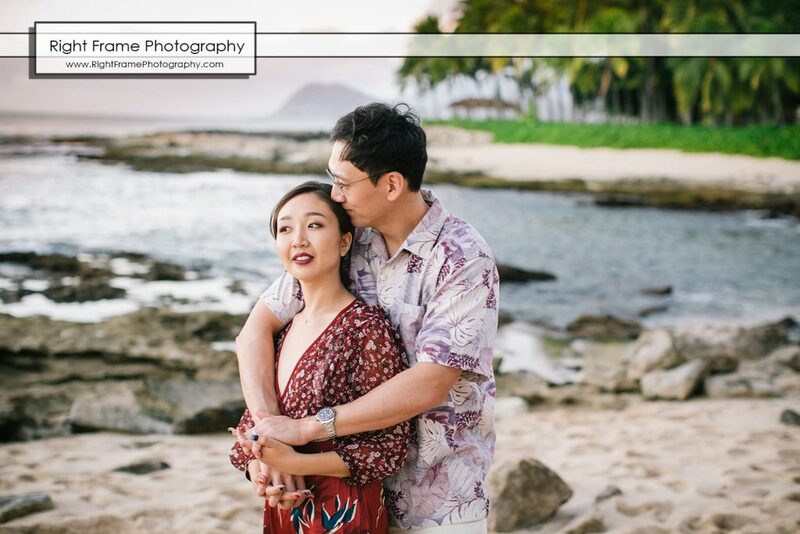 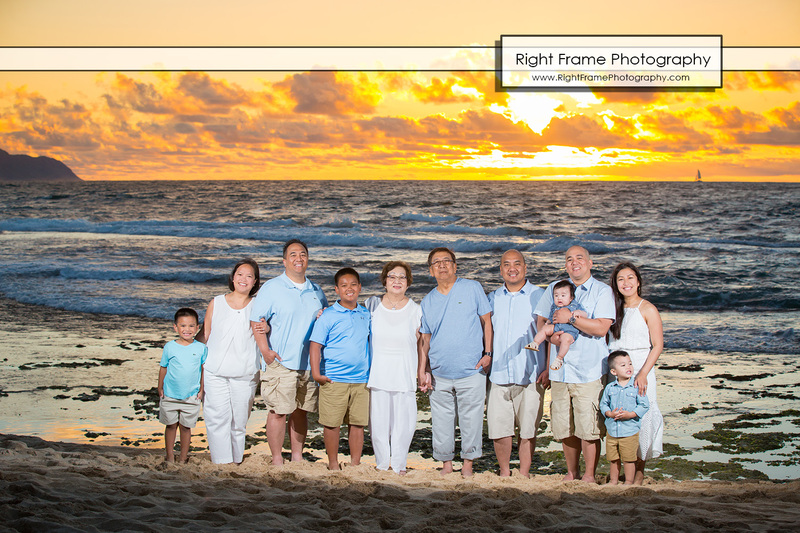 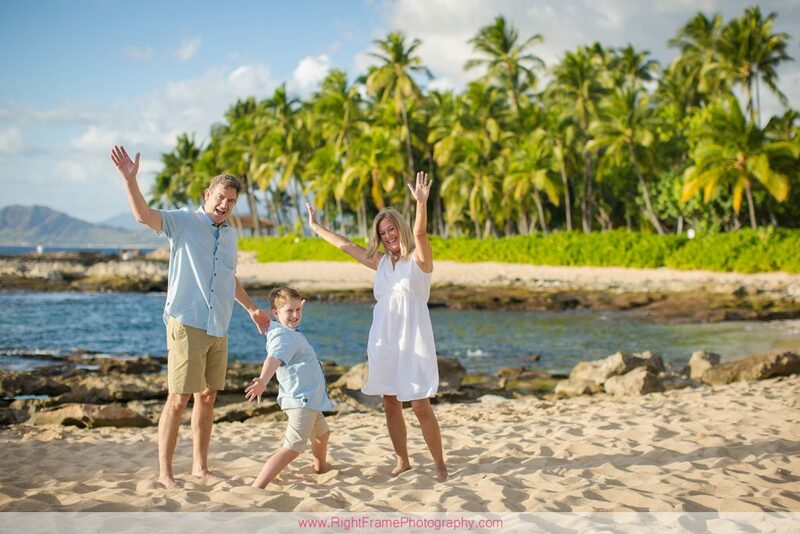 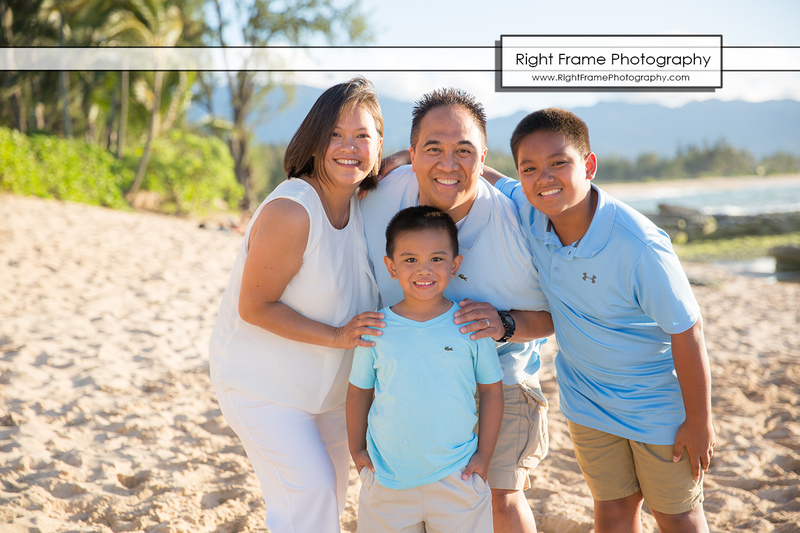 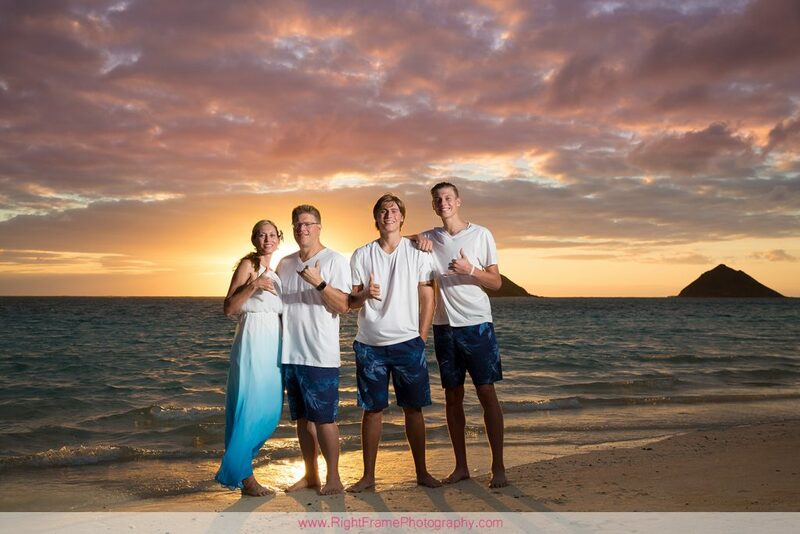 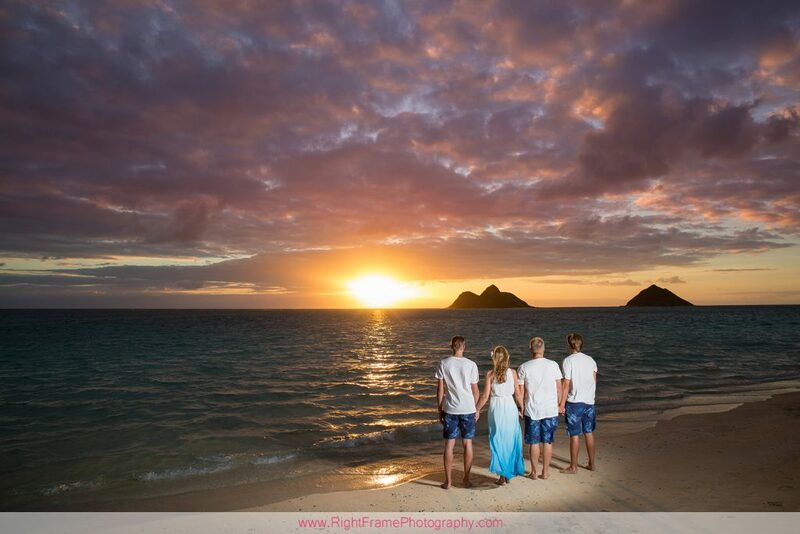 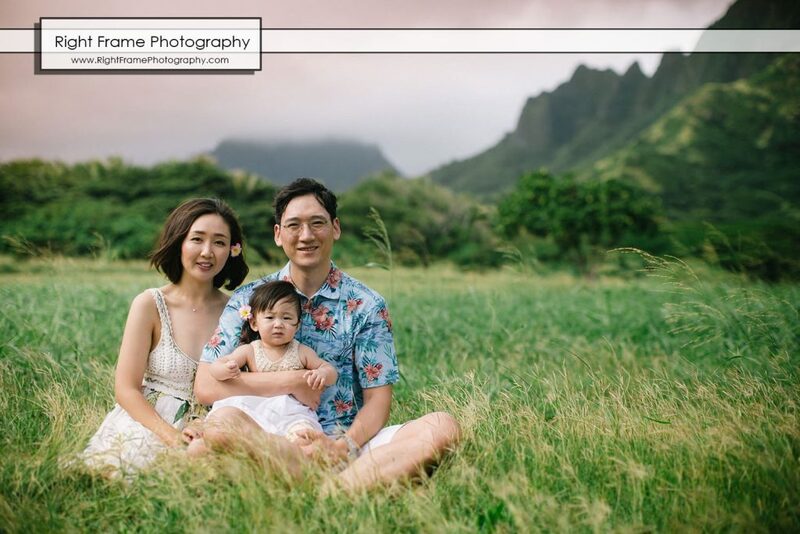 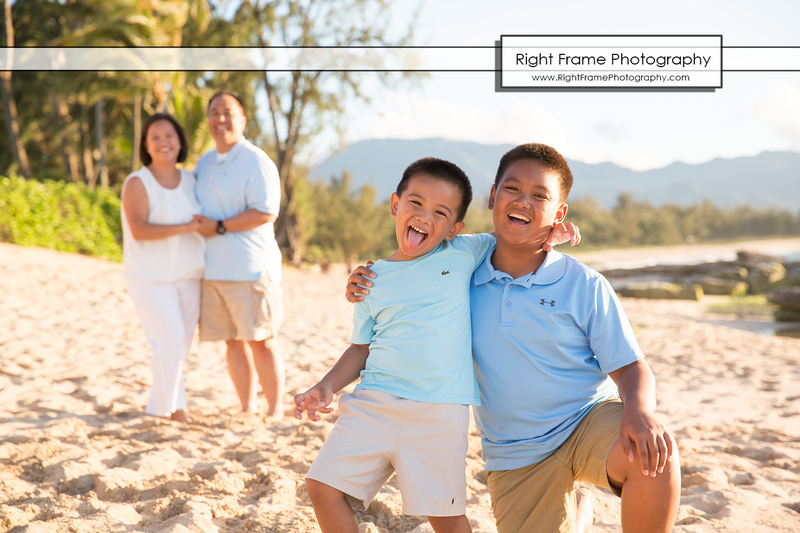 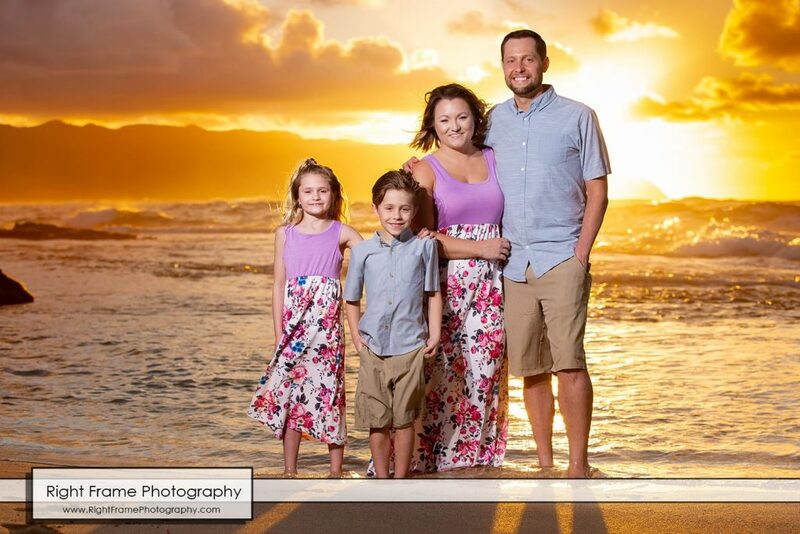 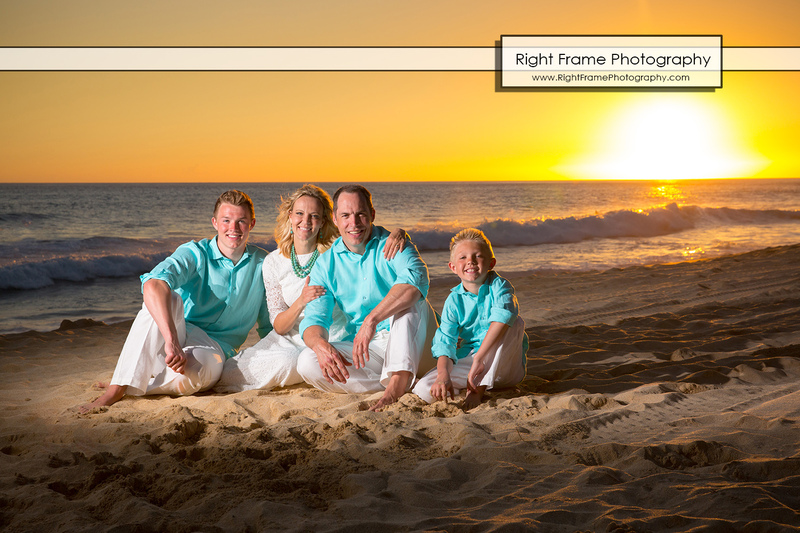 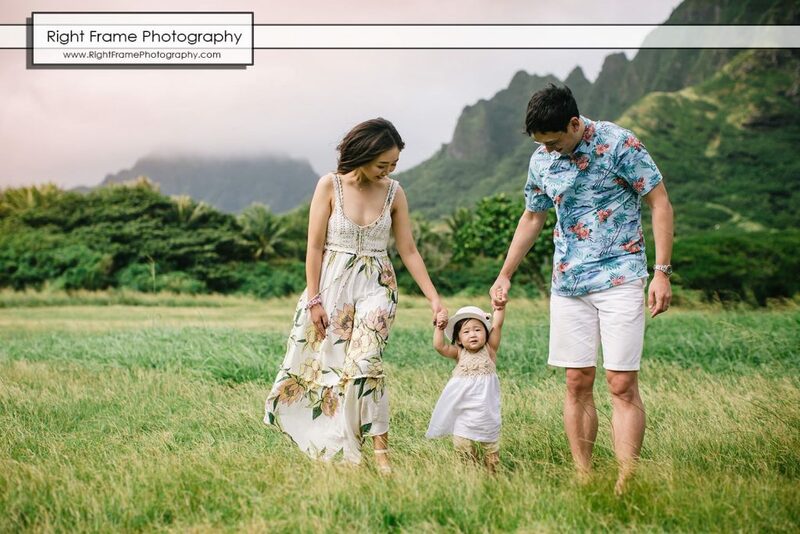 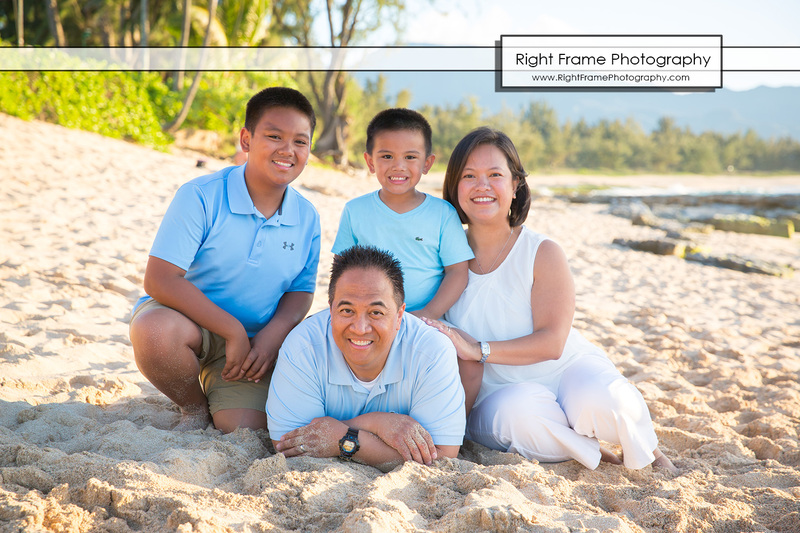 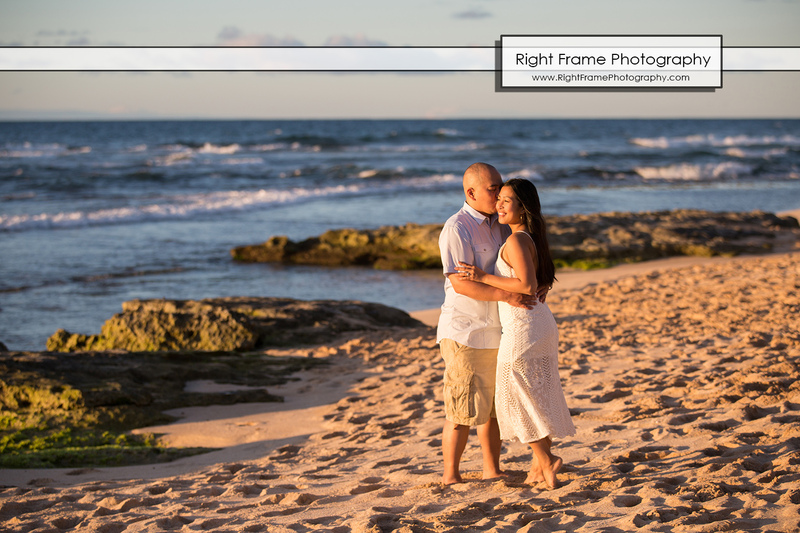 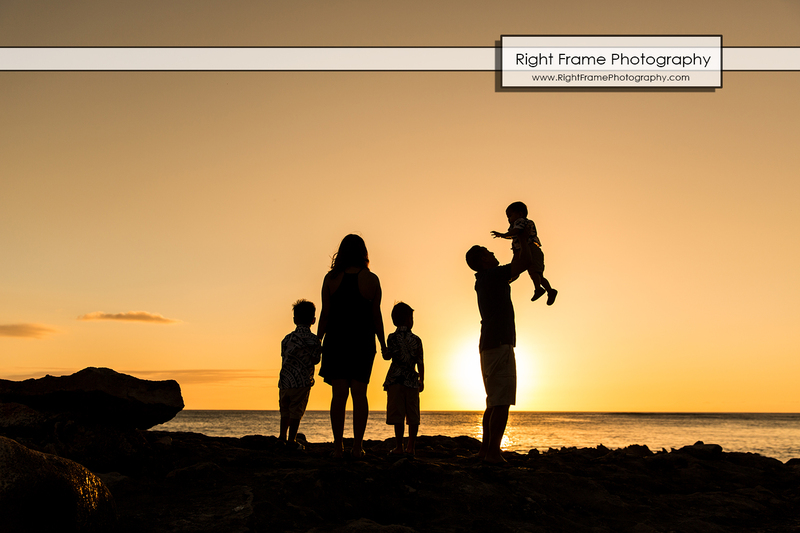 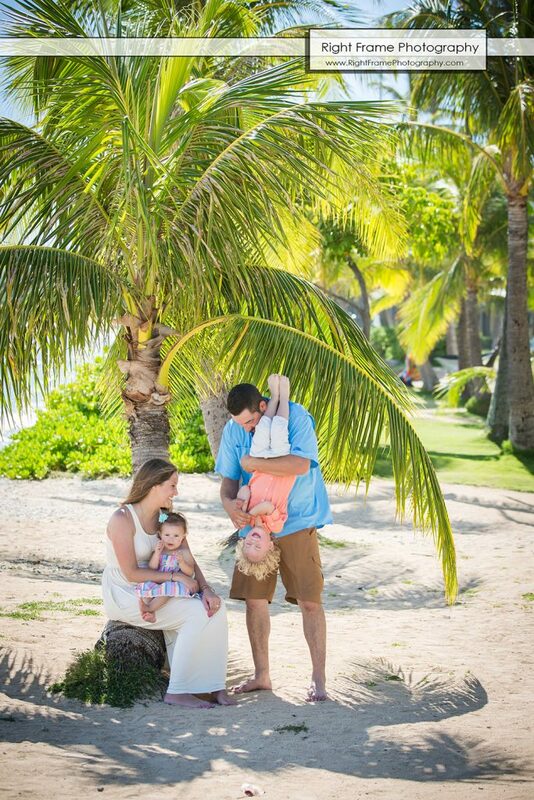 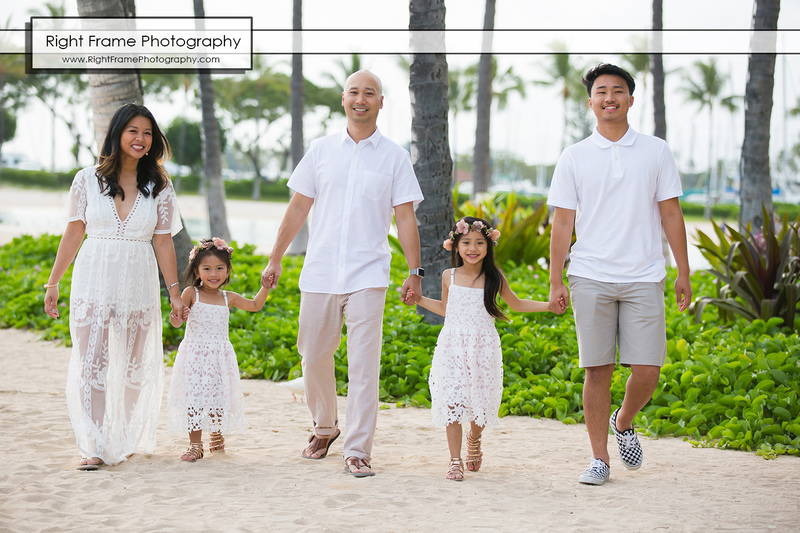 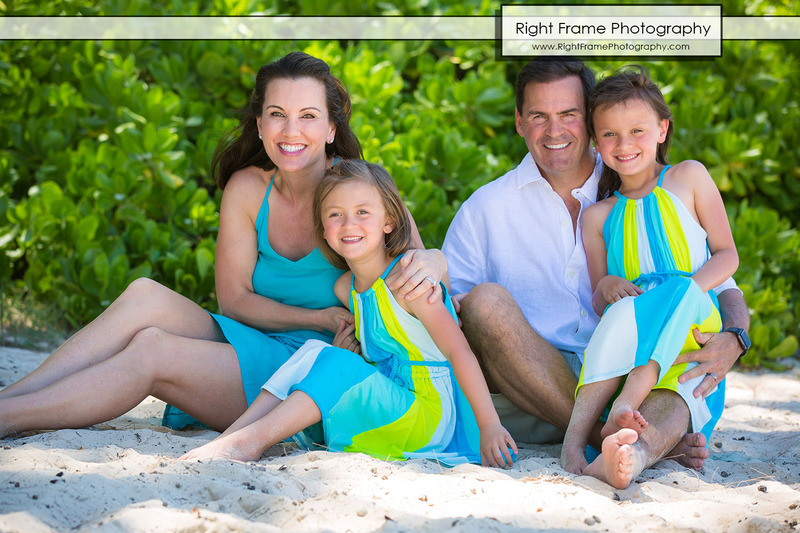 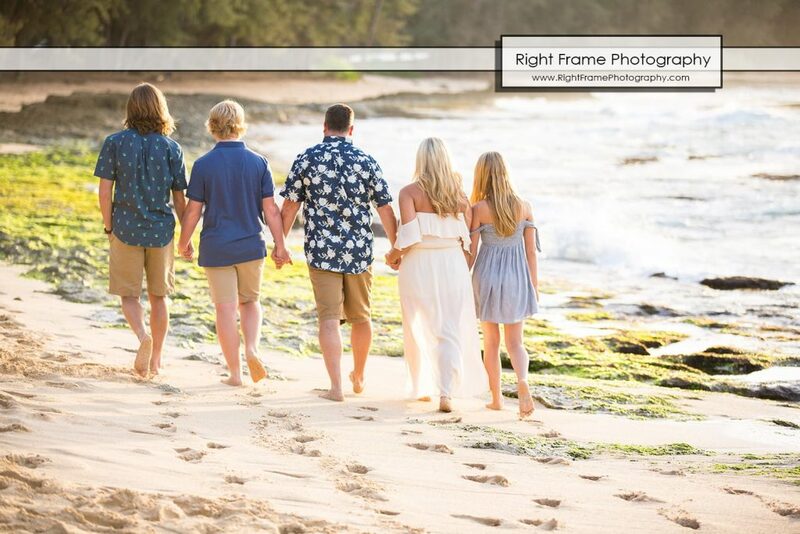 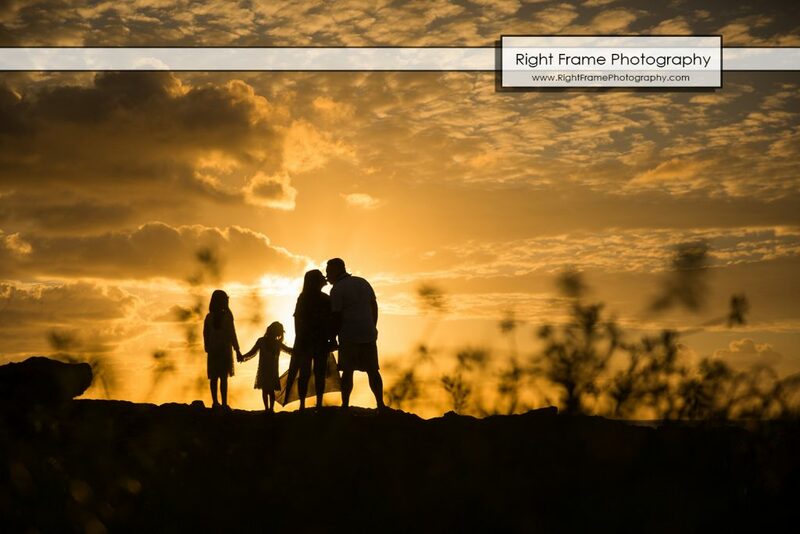 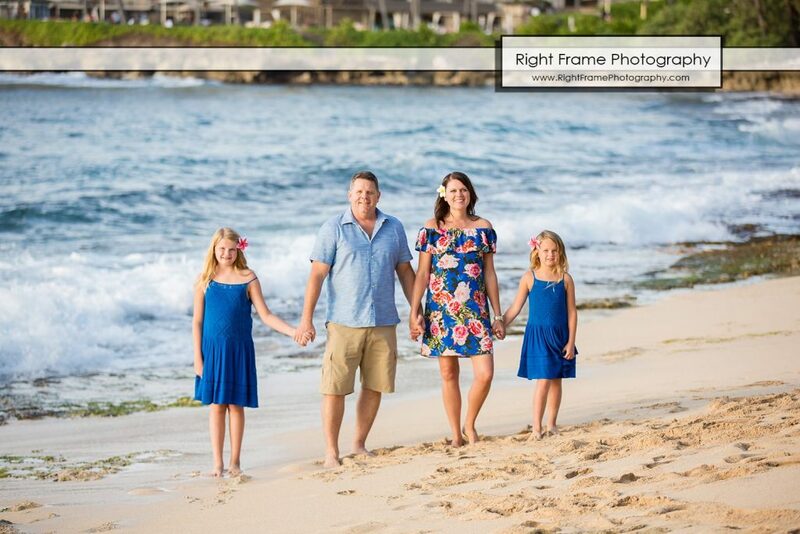 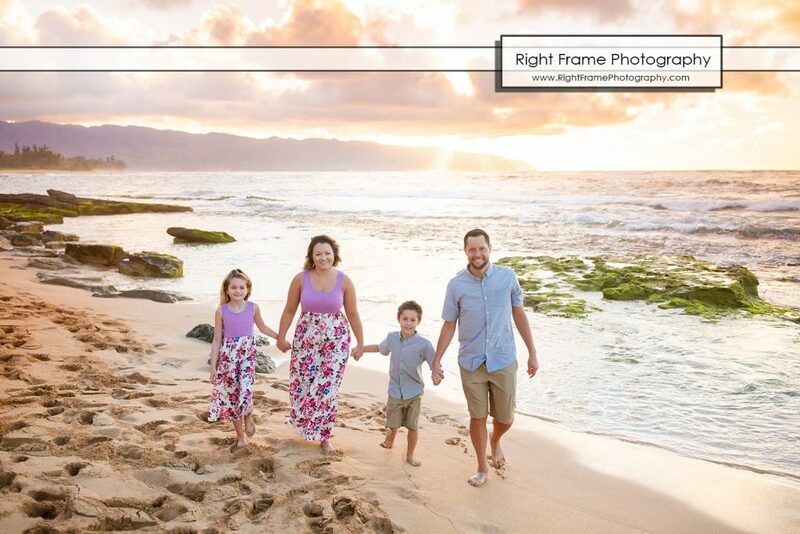 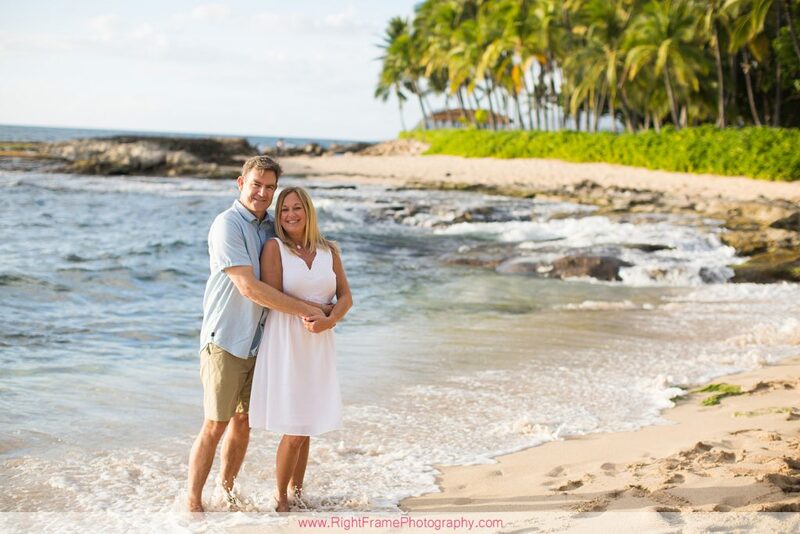 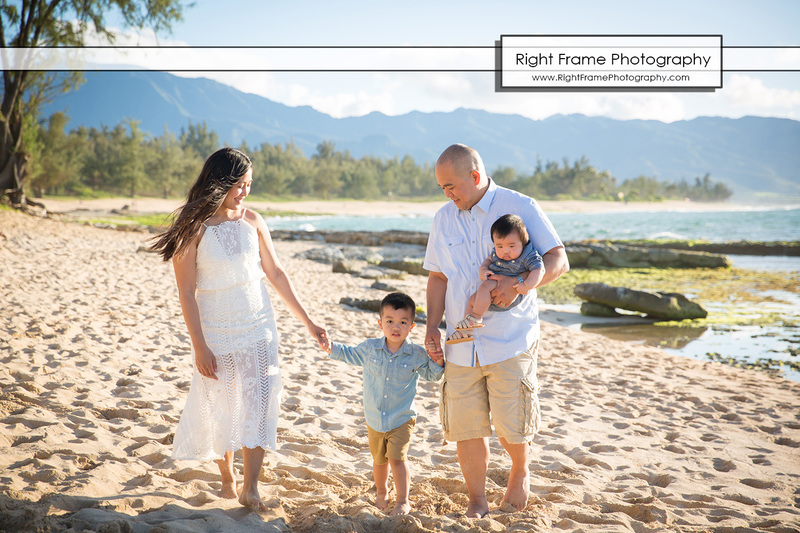 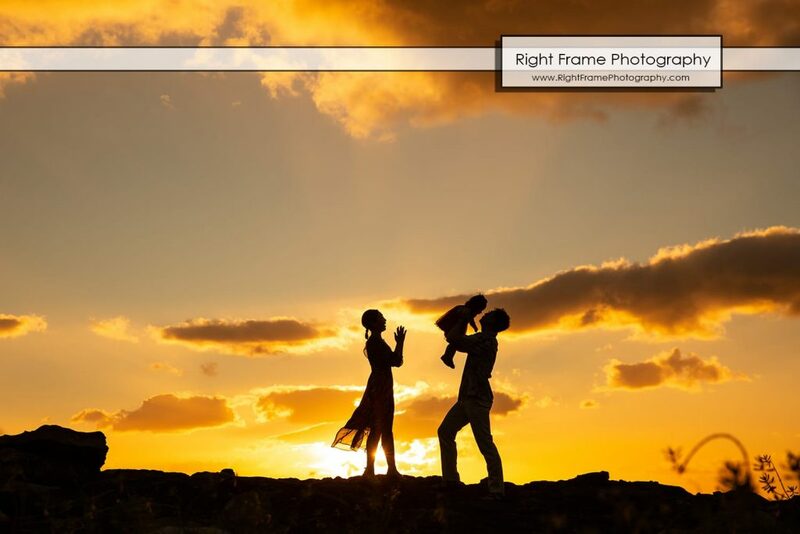 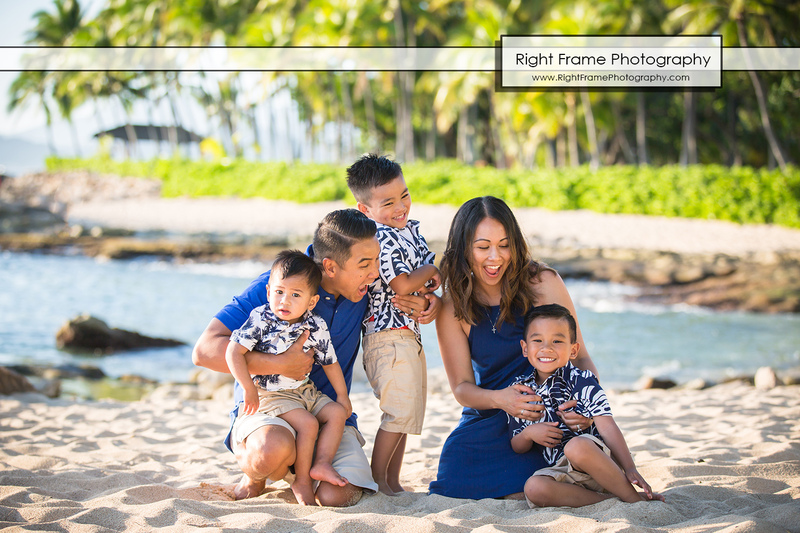 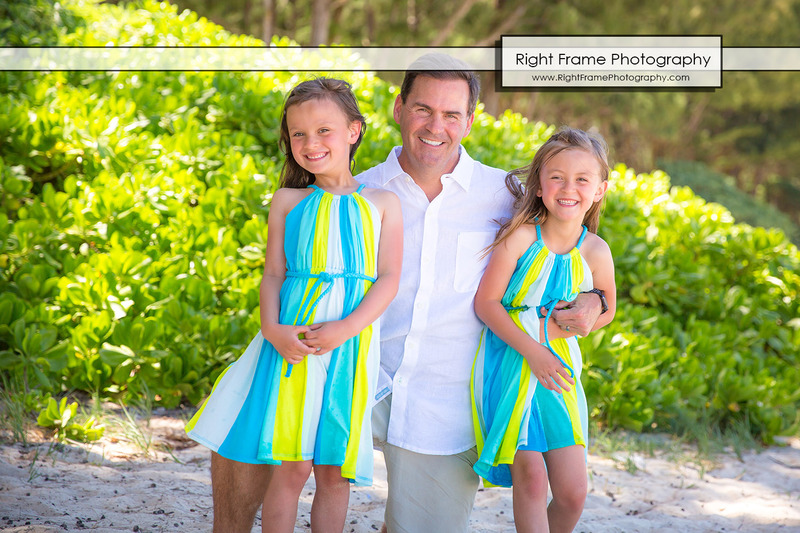 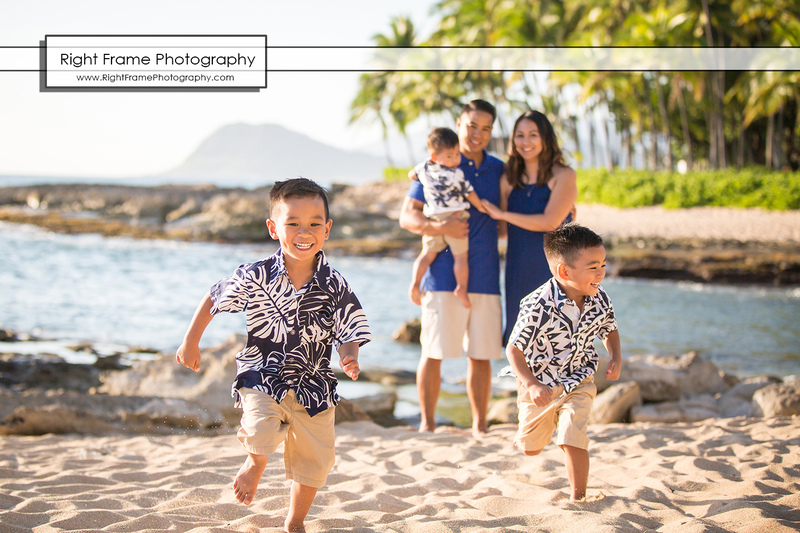 Sunset Family Photography near Ko Olina Beach at Secret Beach (walking distance from Disney Aulani Resort and Four Seasons Resort Ko’Olina Oahu). 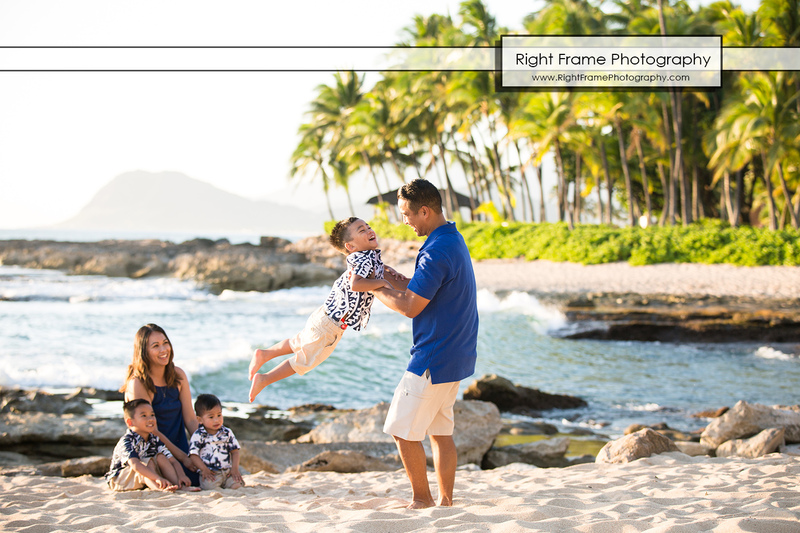 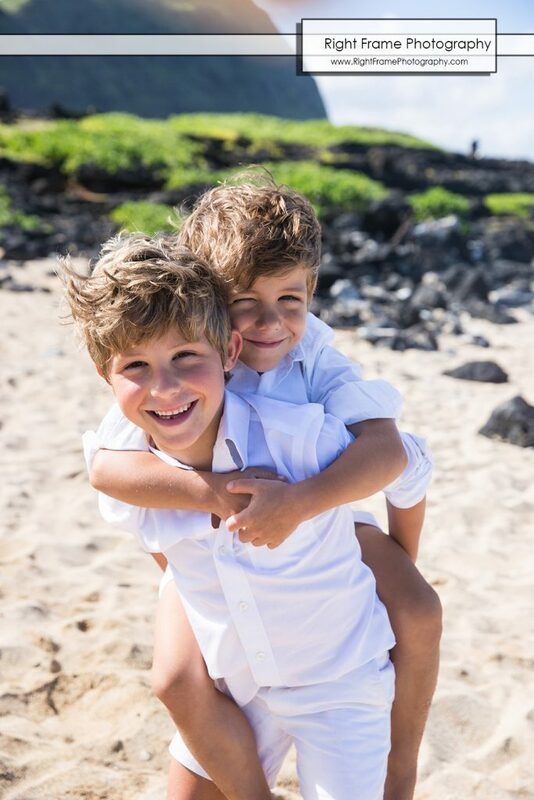 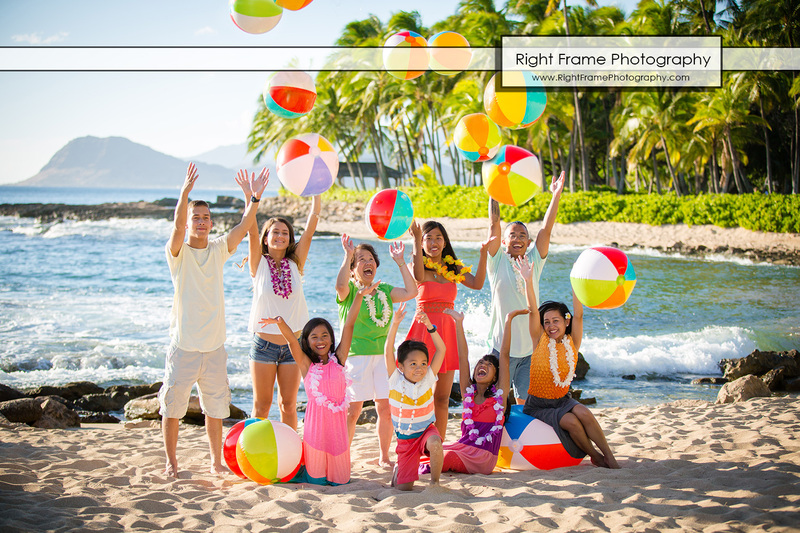 Photographed by Hawaii Family Professional Photographer – Right Frame Photography. 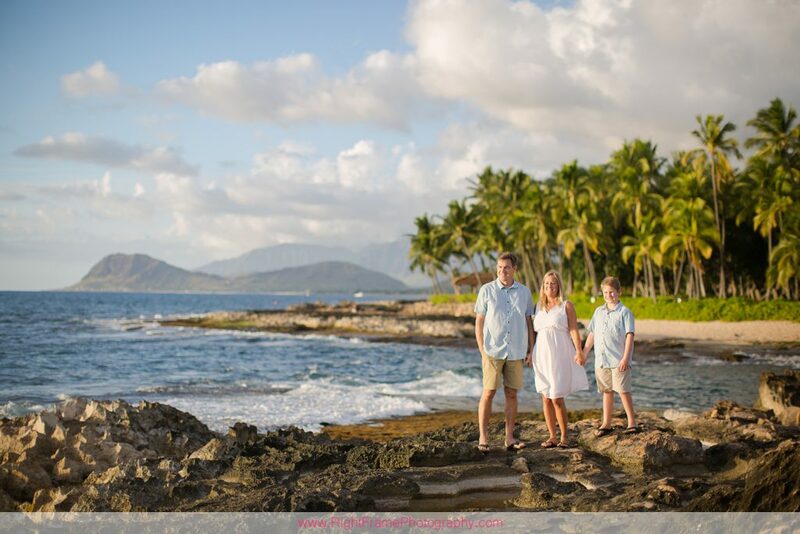 “We chose this fantastic duo for our very first family photo session based on ALL of the wonderful reviews I read! 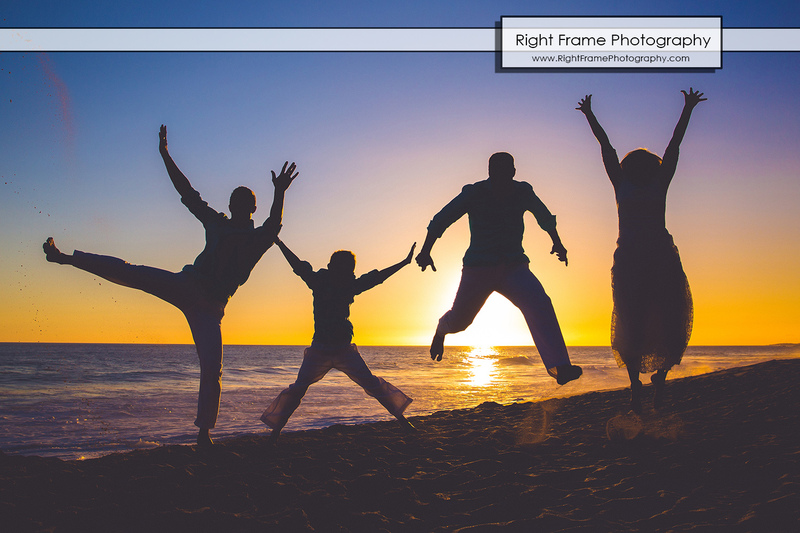 Right Frame lived up to all of them! 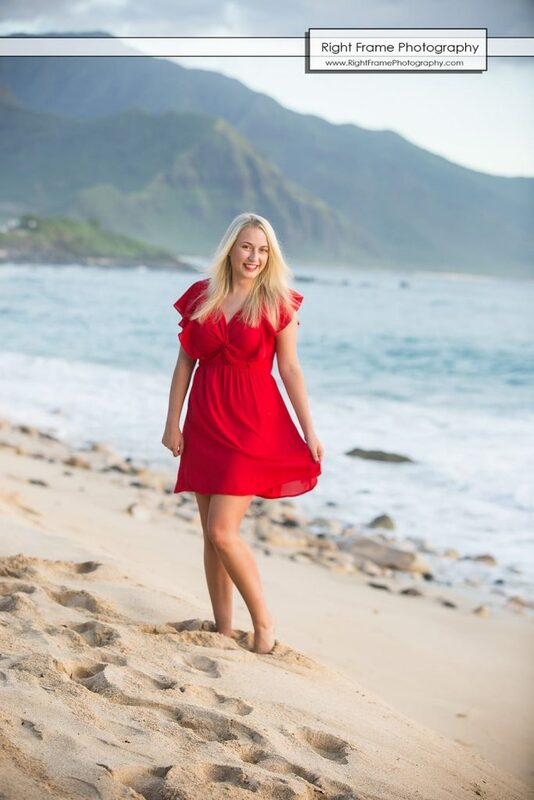 I contacted Ania by email and she responded within hours. 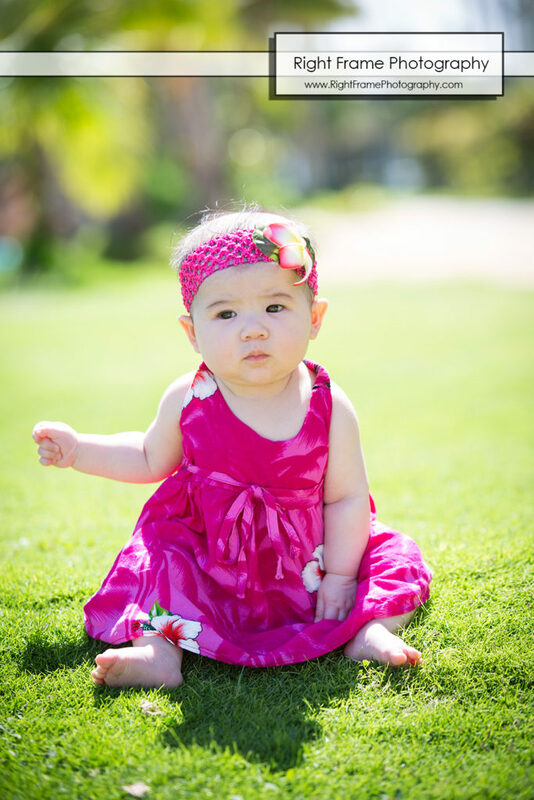 She answered all of my questions in a friendly and thorough manner. 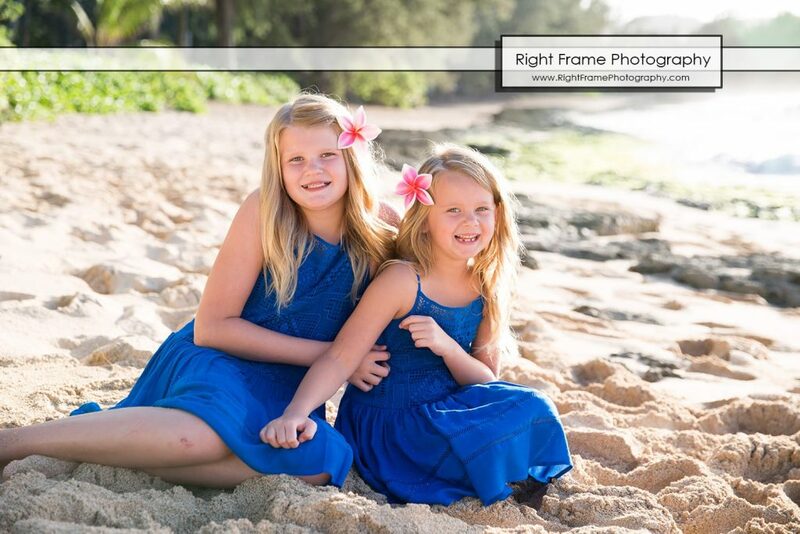 They were able to accommodate us during the busy Thanksgiving holiday! 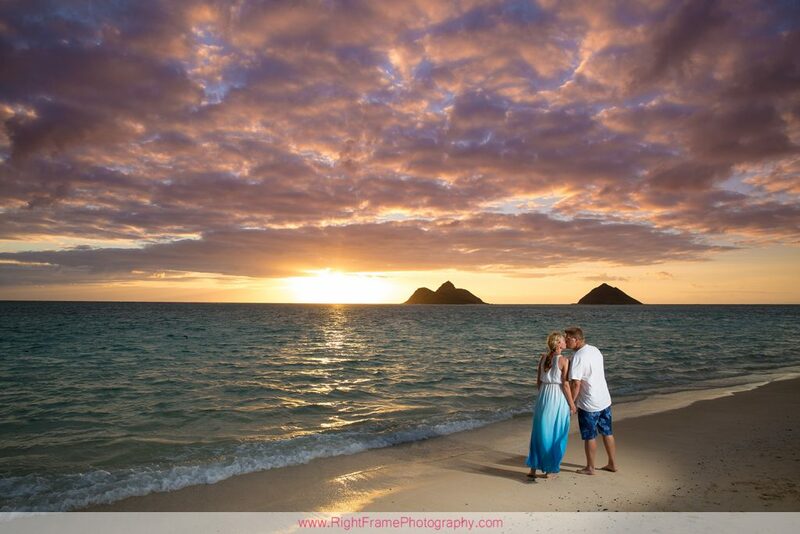 I was given the choice of several gorgeous locations, as well as times of day, to choose from for our photo shoot! 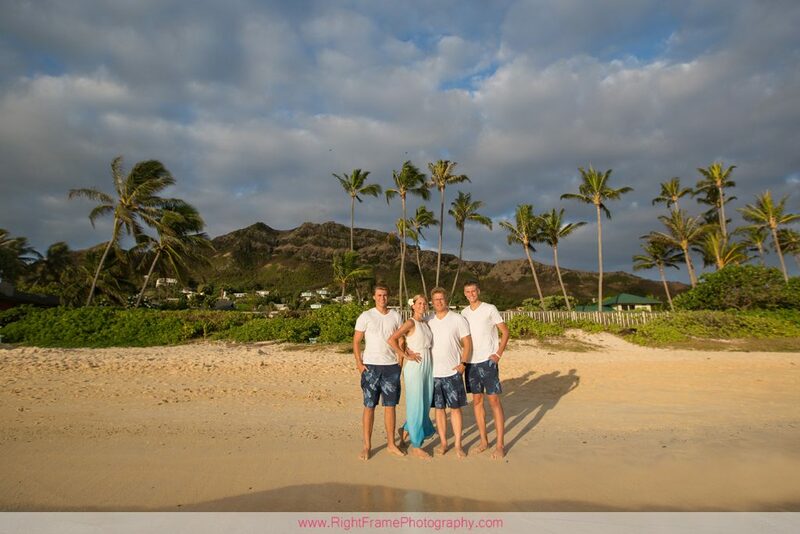 Radek met us promptly at our time and place! 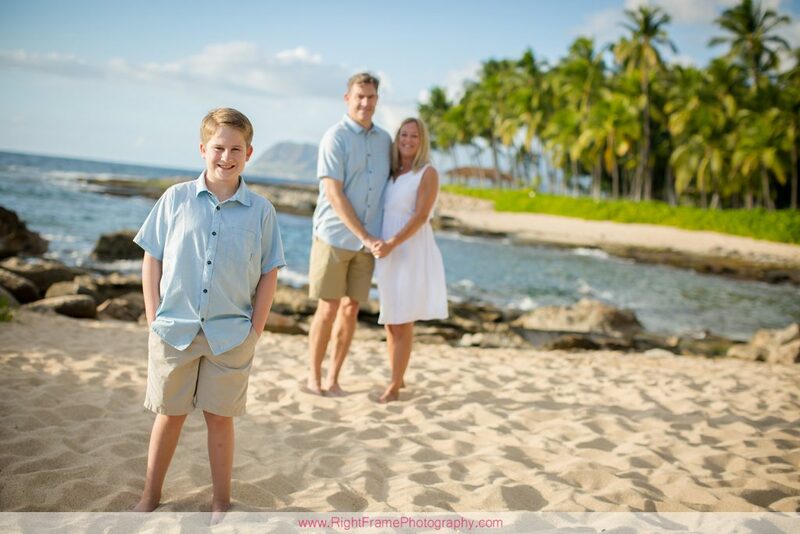 He was friendly and knew just how to pose us, as we were definitely not experts in this area! 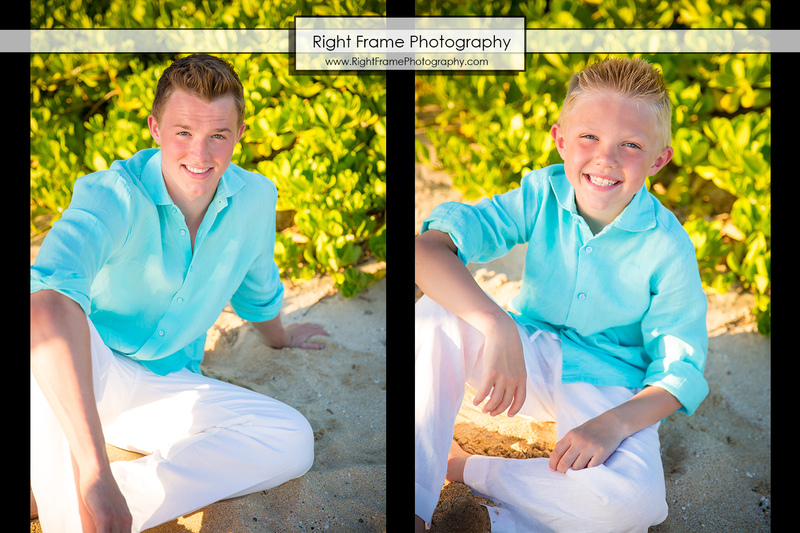 He spent more than the agreed time with us and shot us with lots of different backgrounds! 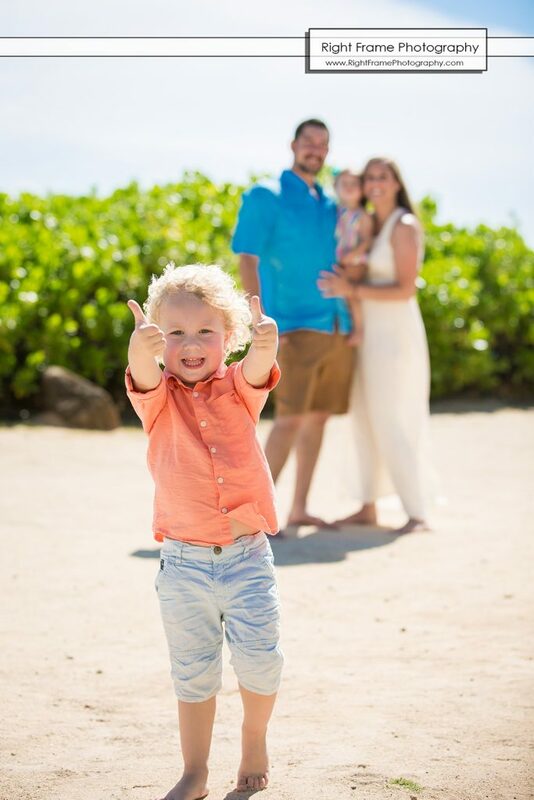 He made it a fun experience that our family will always remember! 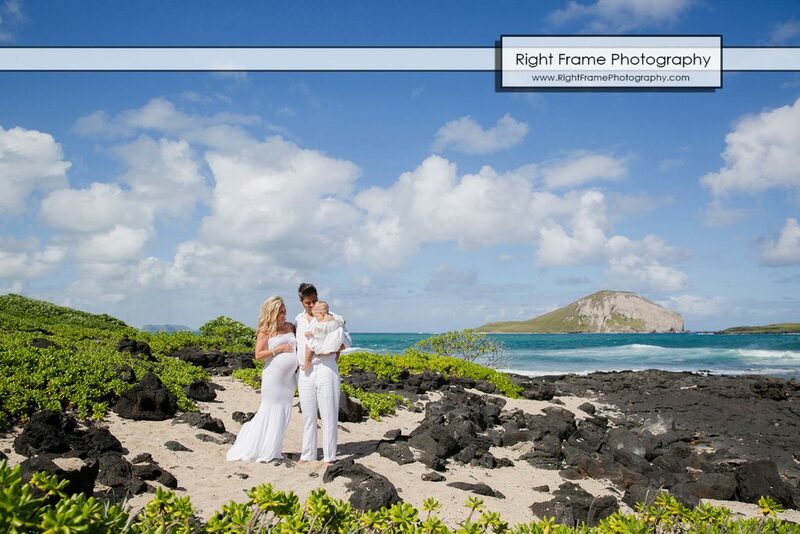 We were thrilled when we received our gorgeous photos!!! 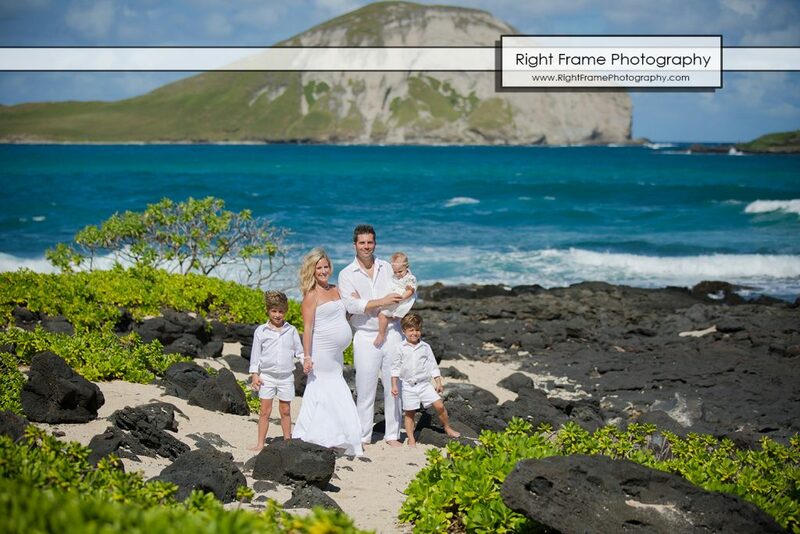 Radek sent us more photos than we had expected! 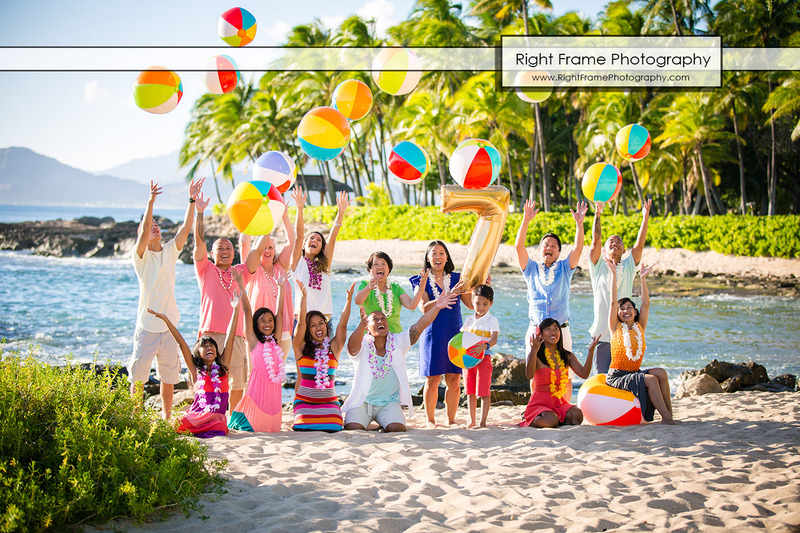 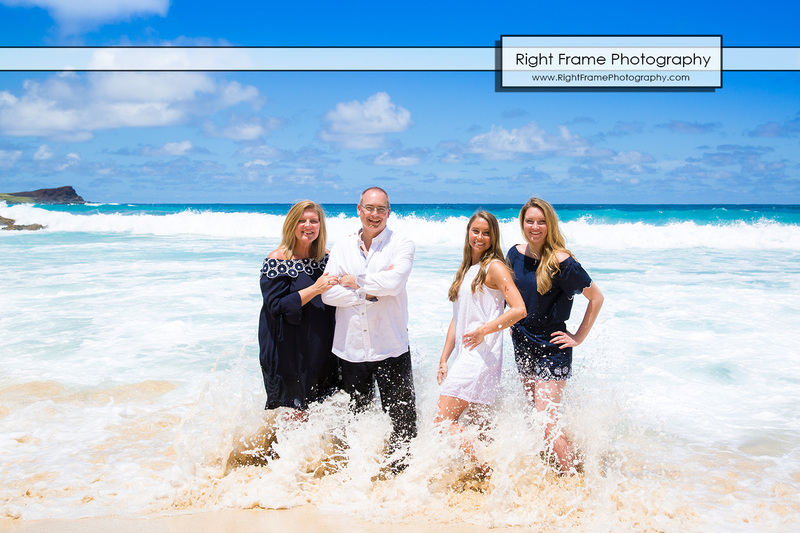 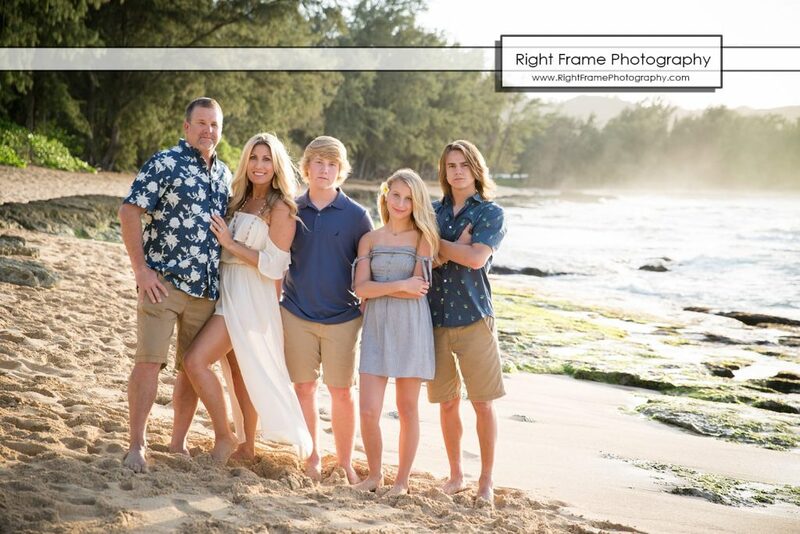 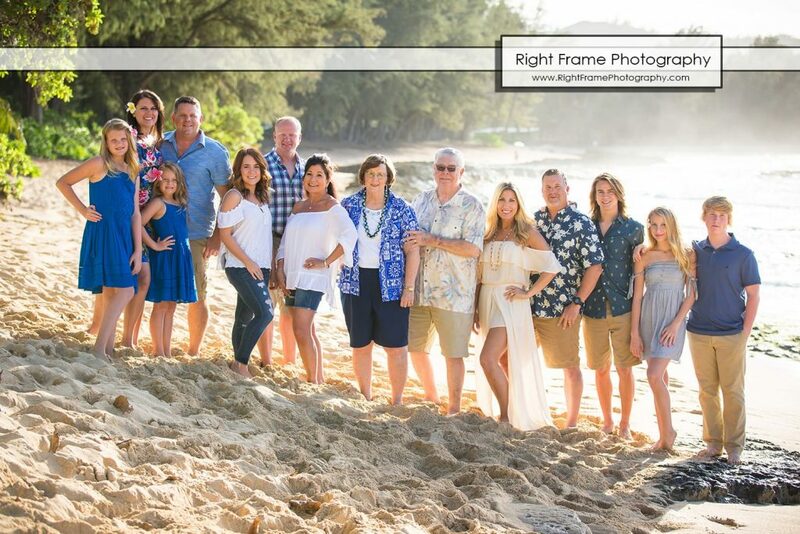 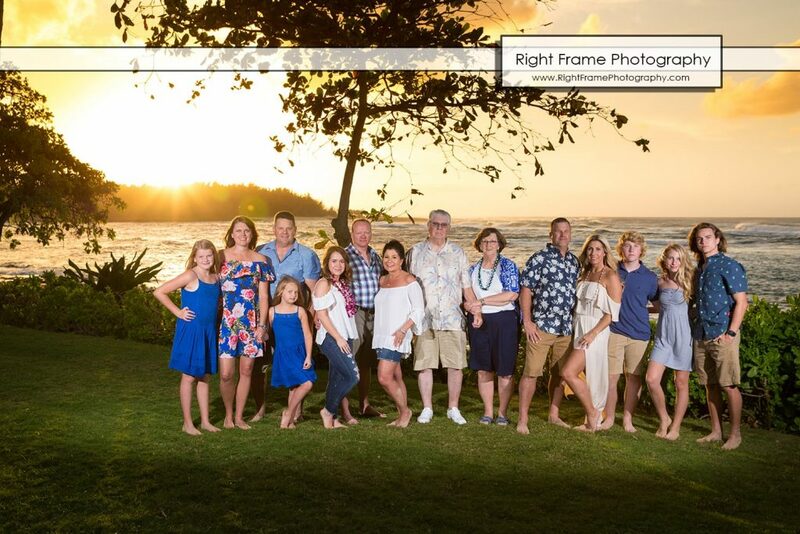 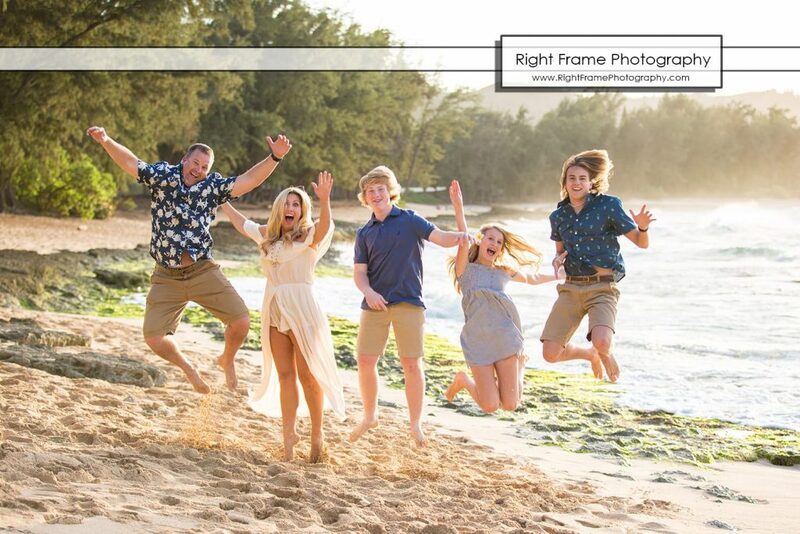 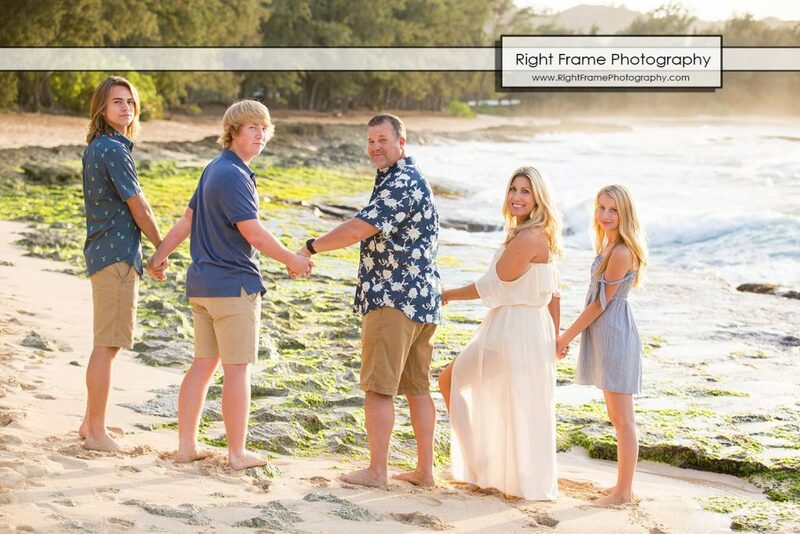 Tiffany’s large group family portraits at Stables Beach, near Turtle Bay Resort, North Shore, Oahu Hawaii. 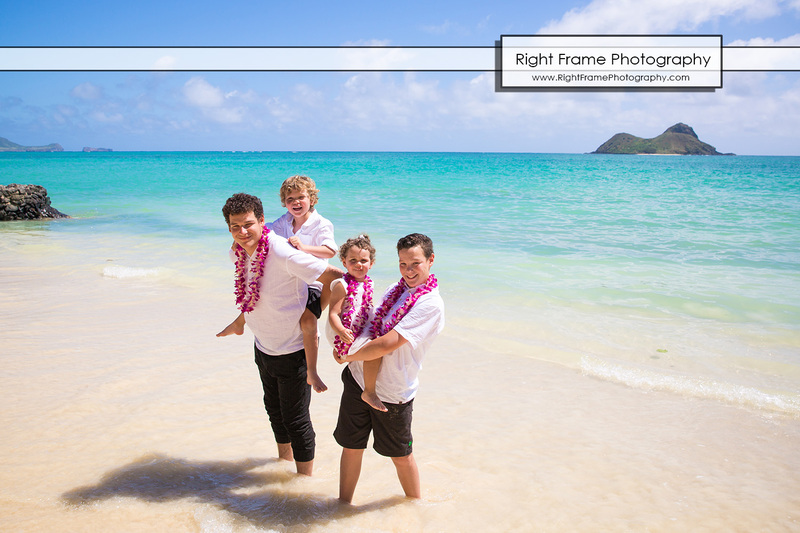 Lana’s Oahu Family Beach Photos was shoot at Keawaula Beach (aka Yokohama Beach Bay), Oahu Hawaii. 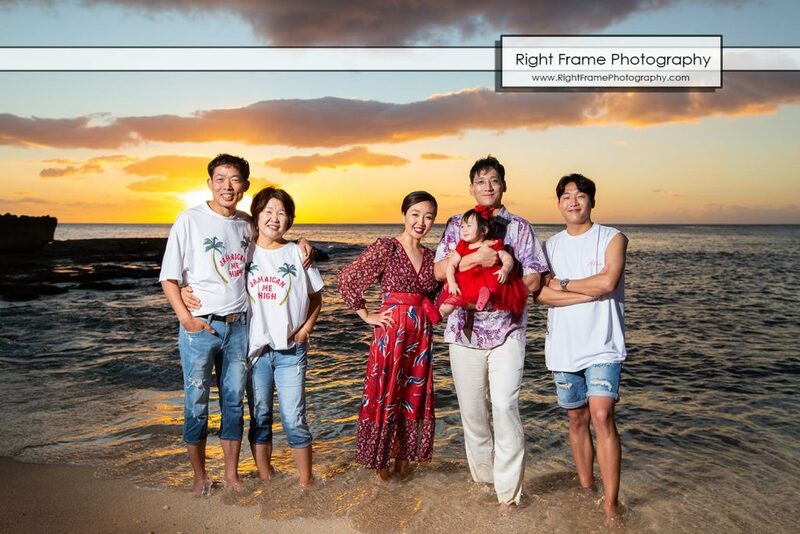 Hwee’s Sunset Family Portrait was shoot at Secret Beach Near Disney Aulani Resort Ko’Olina and Kualoa Regional Park (Chinaman’s Hat), Oahu Hawaii. 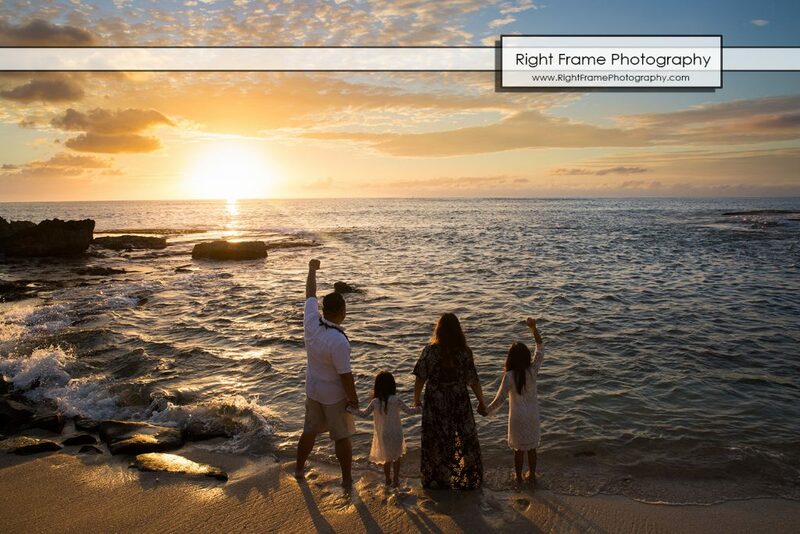 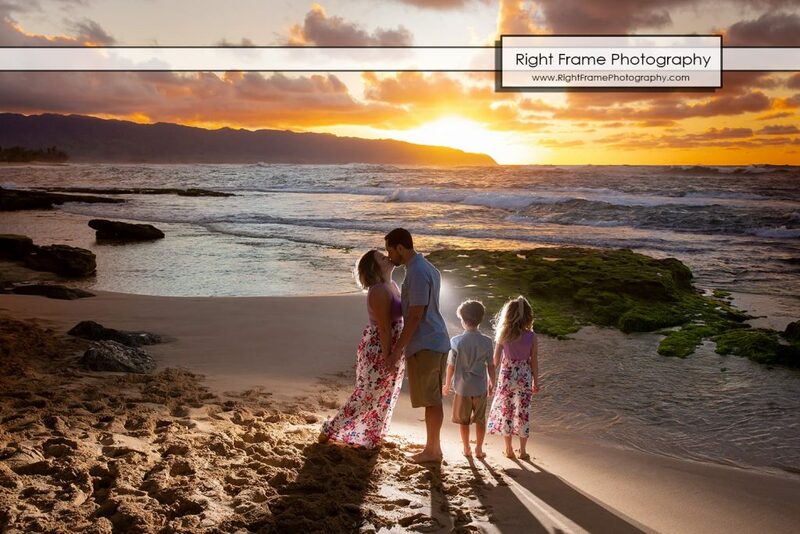 Joshua’s Sunset Family Portraits was shoot at Papailoa Beach (North Shore) , Oahu Hawaii. 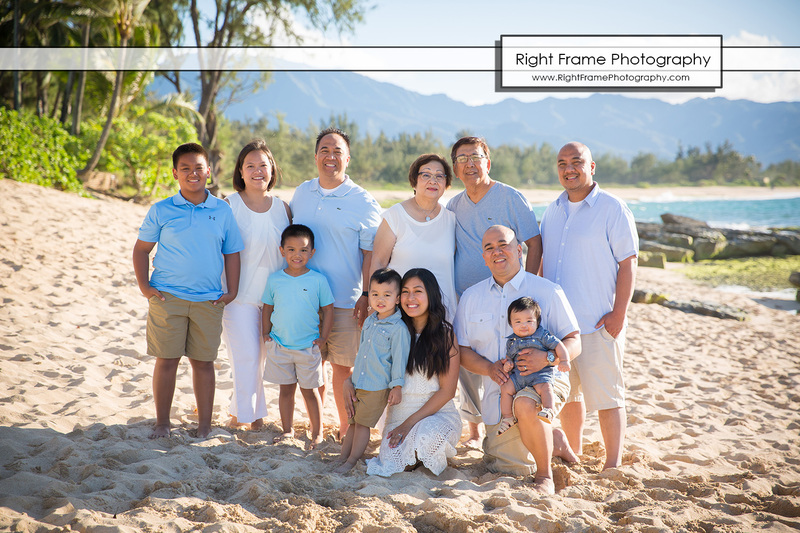 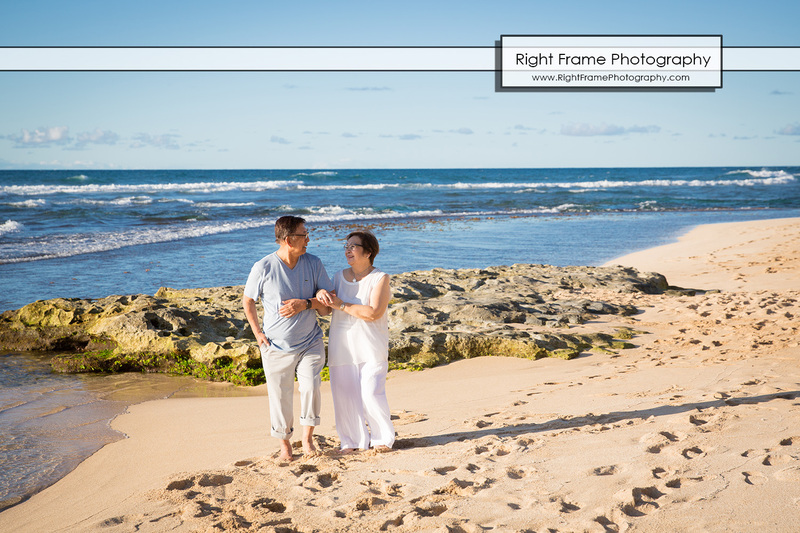 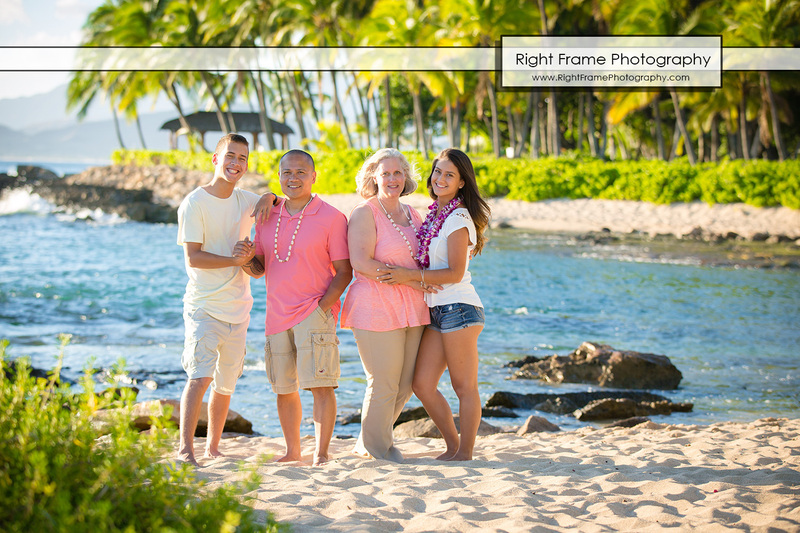 Brenda’s Family Portraits was shoot at Kahala Beach (Waialae Beach Park) , Oahu Hawaii. 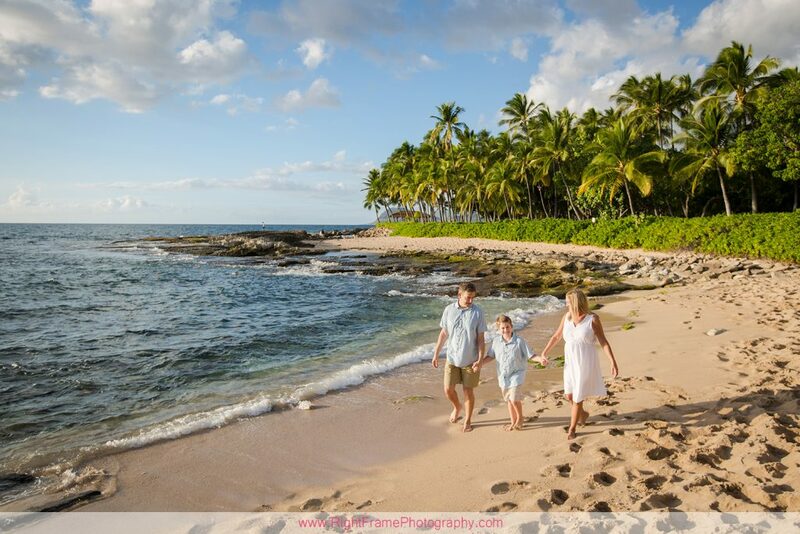 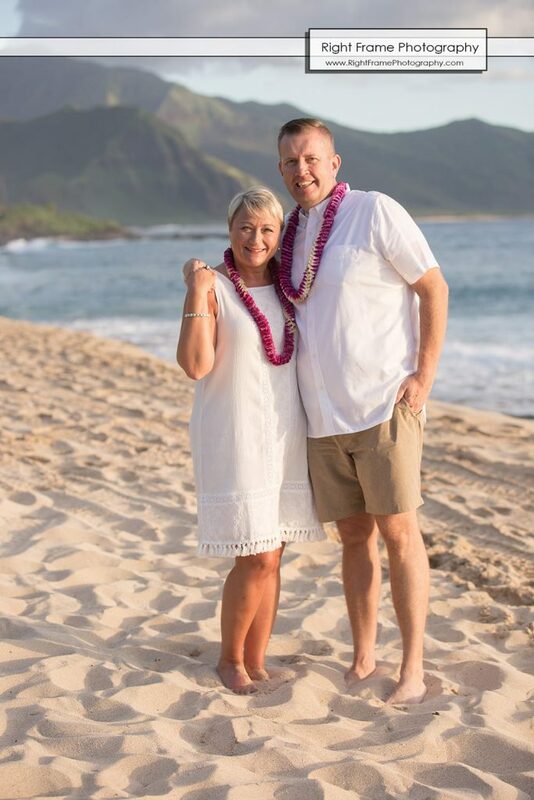 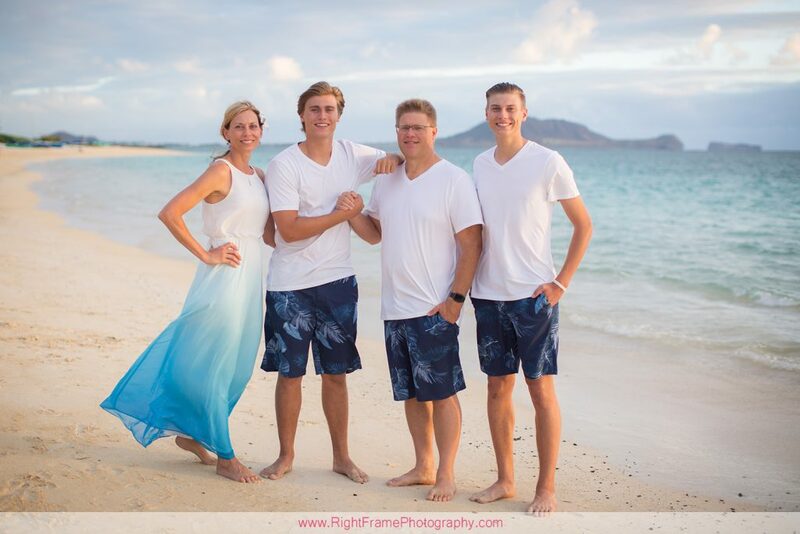 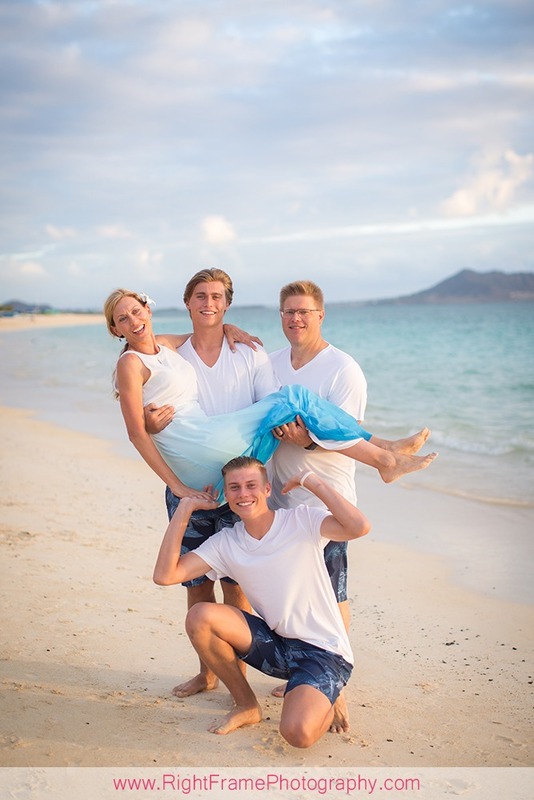 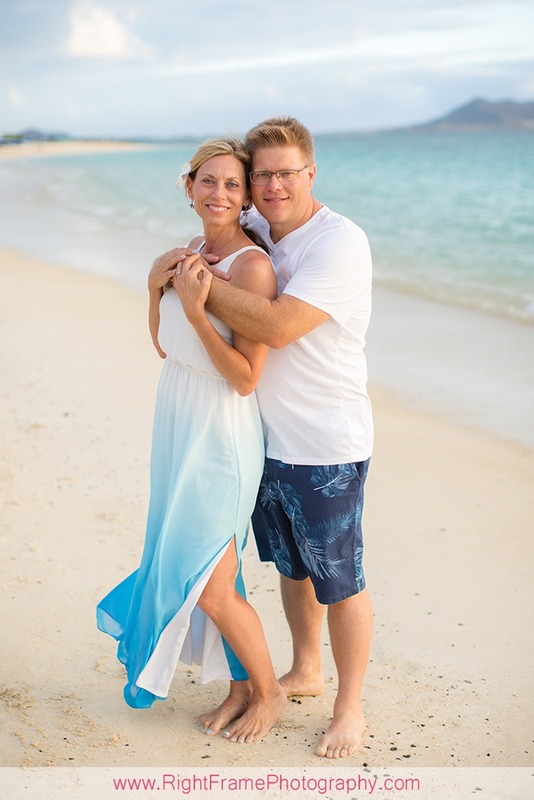 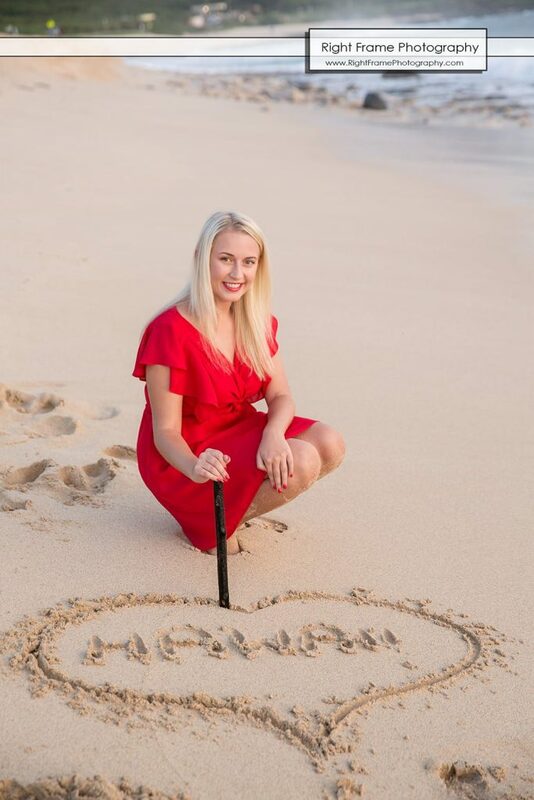 “I must share this with all other families out there about how great Ania and Radek were in taking extremely good care of us before, during and after our visit to Hawaii, and giving us this great gift of memory. 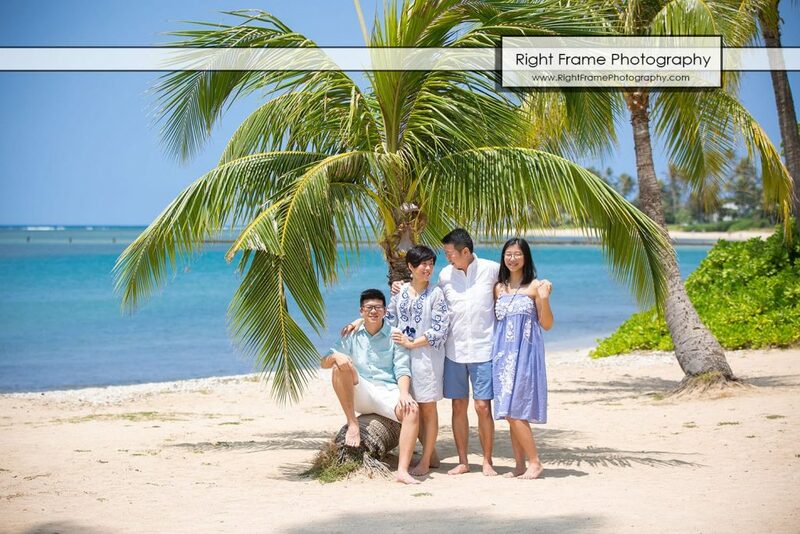 We traveled far from Hong Kong and was hoping to do a gorgeous family portrait to remember a page in life right before our elder daughter goes to university. 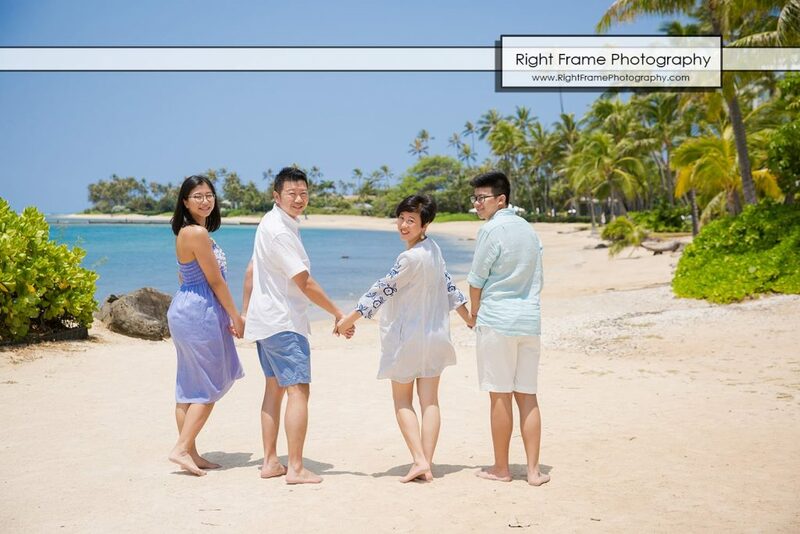 We’ve had many other family portrait experiences locally in Hong Kong and overseas in Sydney, Grand Canyon & Vancouver…. 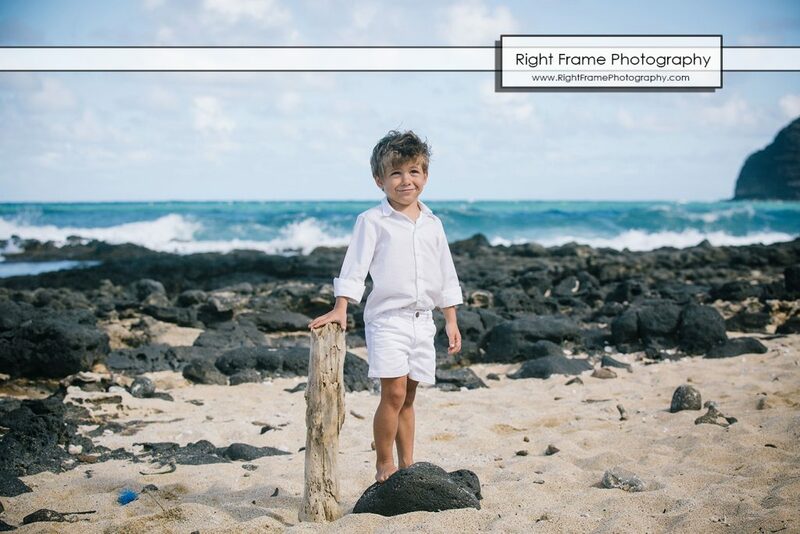 inside studios, outdoor in the woods and on the rocks since our children were babies. 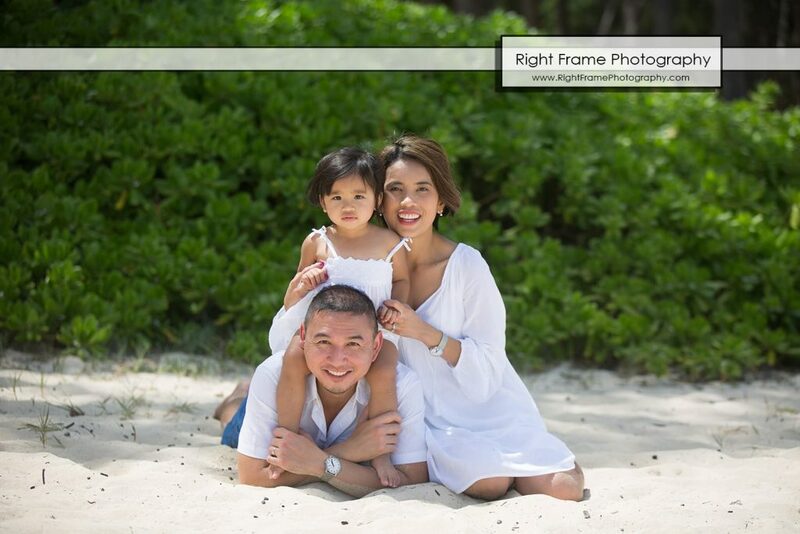 We read many reviews and searched the best family portrait photographer online. 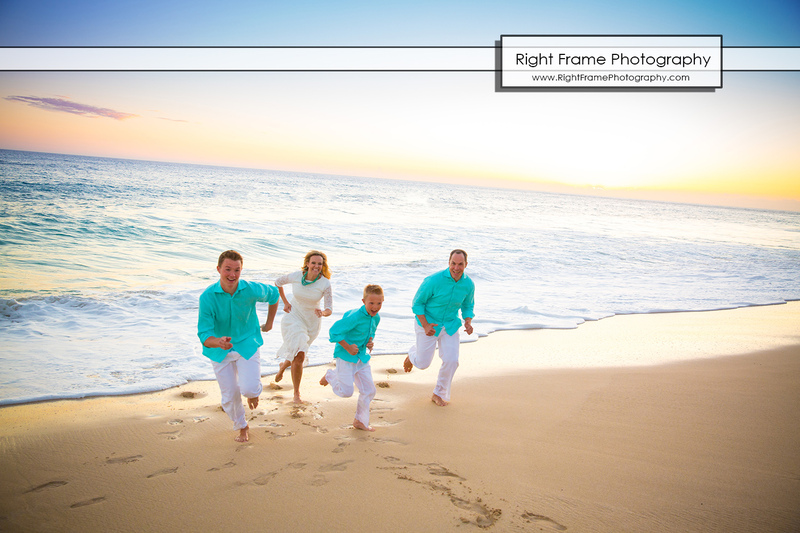 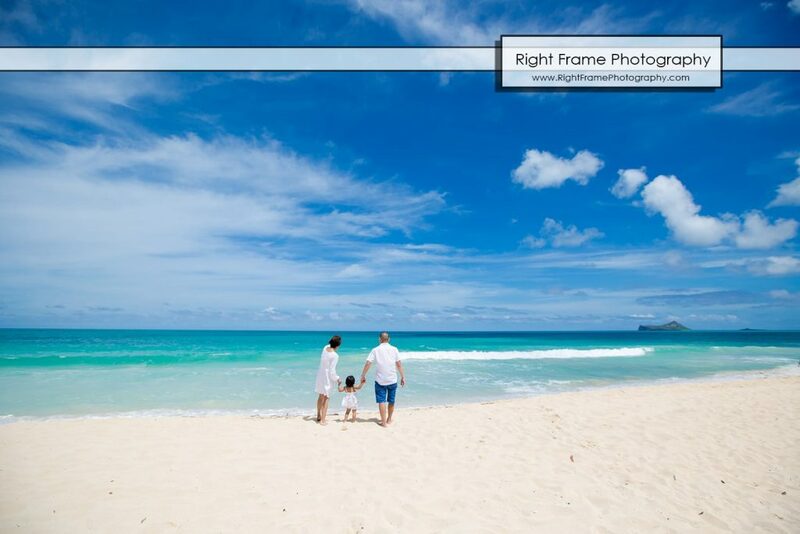 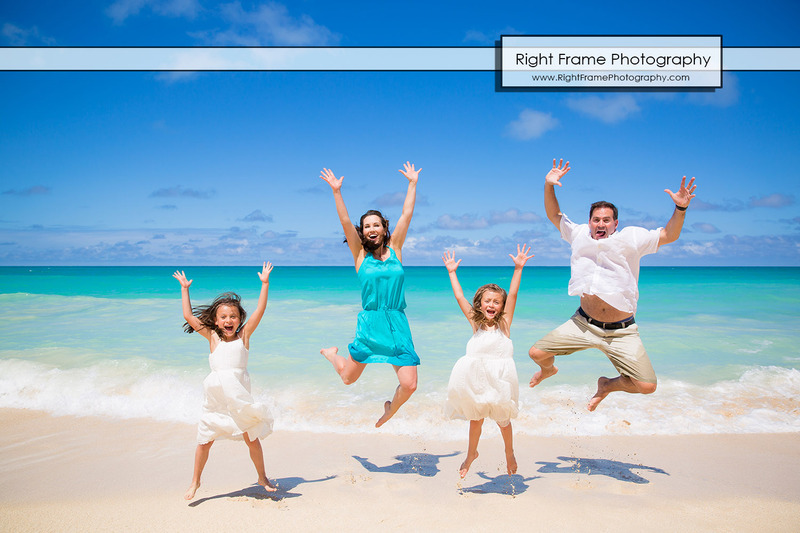 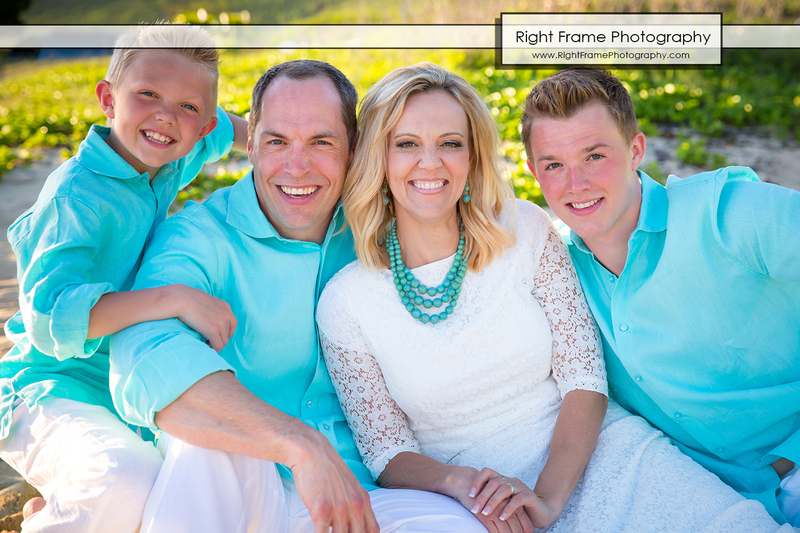 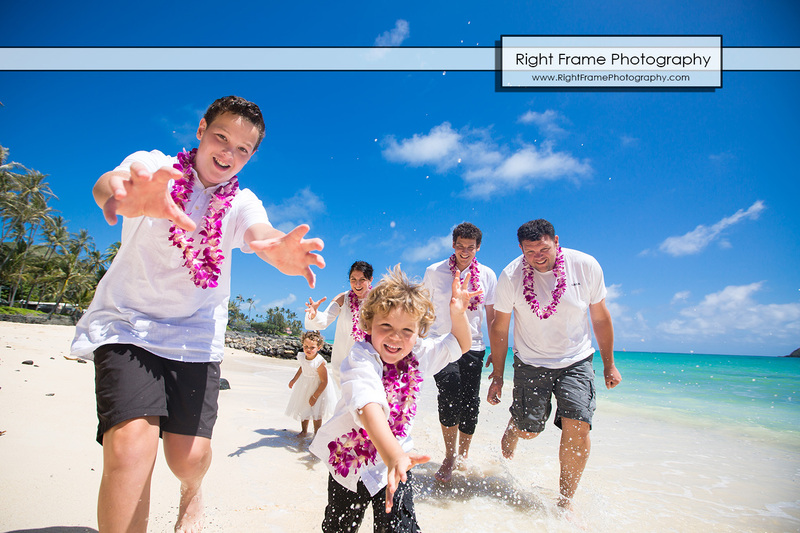 With reference from fellow families, and by viewing the online gallery, we picked Right Frame Photography. 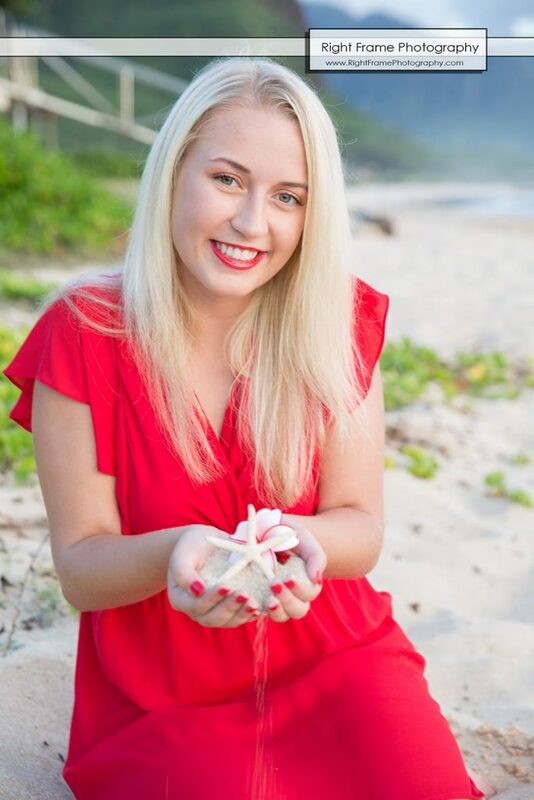 Ania made communication so easy for us prior to our visit, advising us on locations & effects, giving us many tips to travel even to introduce us to Turo. 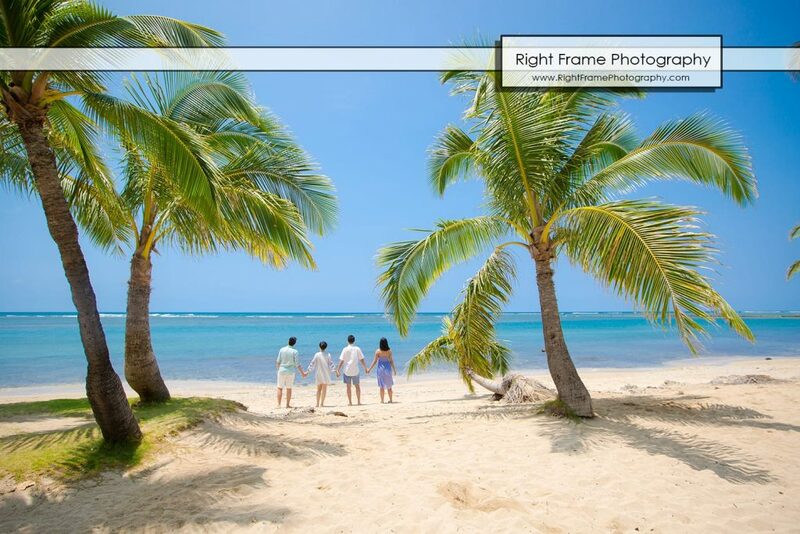 Some of our friends in California & Chicago aren’t even familiar with this latest car rental app! 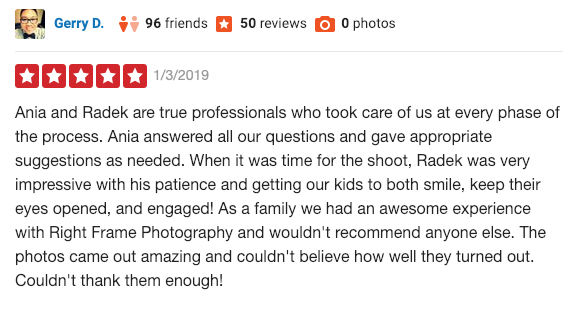 She made everything super easy for us and didn’t mind to take the time to explain. 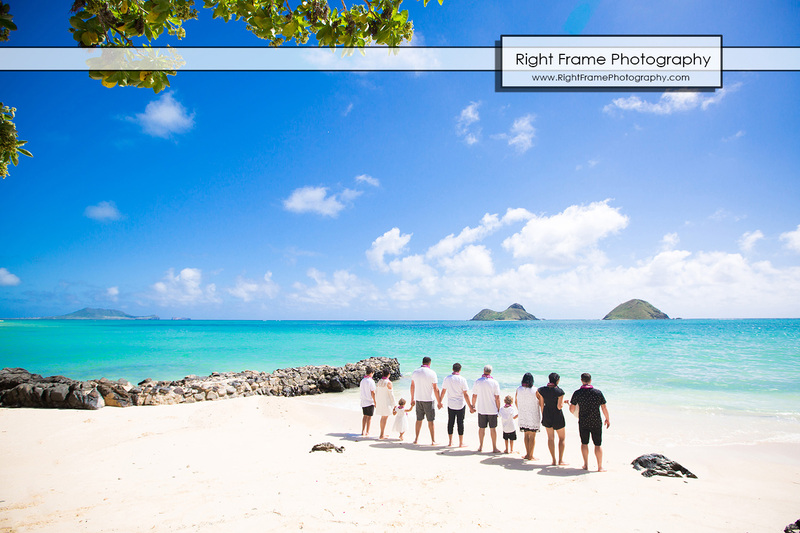 On the day of the shoot, we miscalculated time and arrived too early. 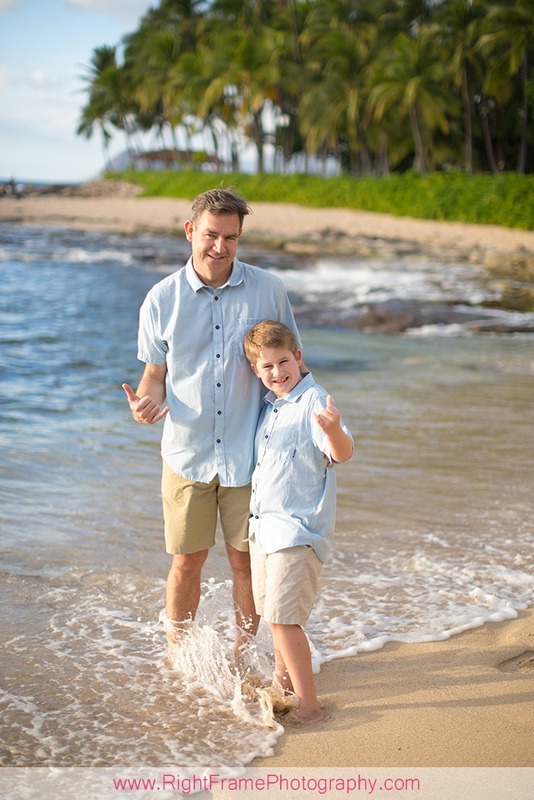 While we thought we would just sit in the car and wait, Ania reached out to advise us to go see the dolphins at a nearby spot while Radek was on his way. 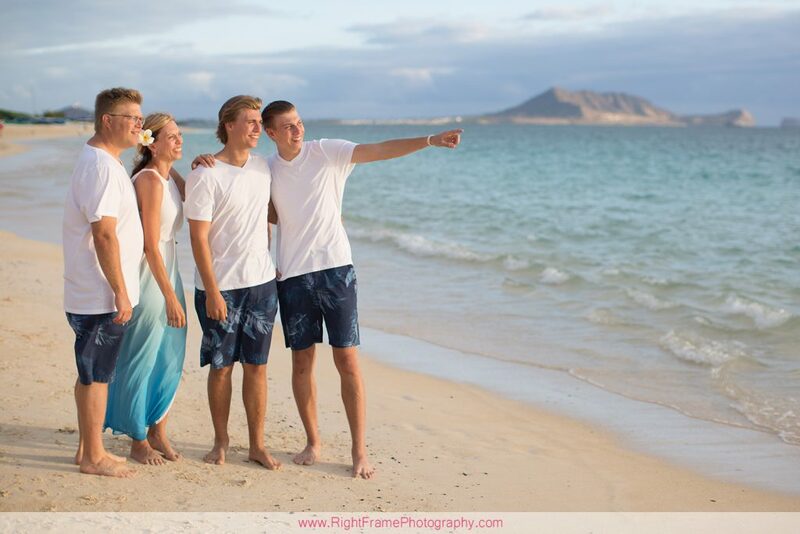 Ania made sure we walked on the right side of the road to not miss the dolphins and way back to not miss Radek. 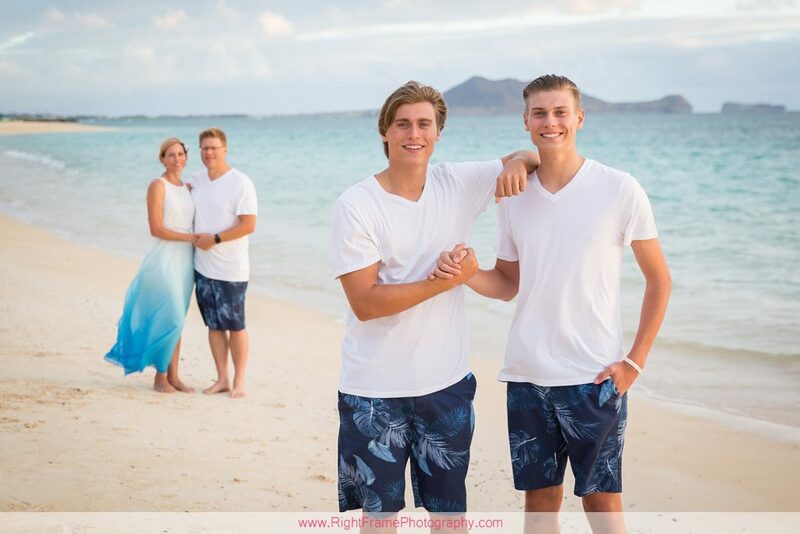 What a special short moment that we didn’t anticipate. 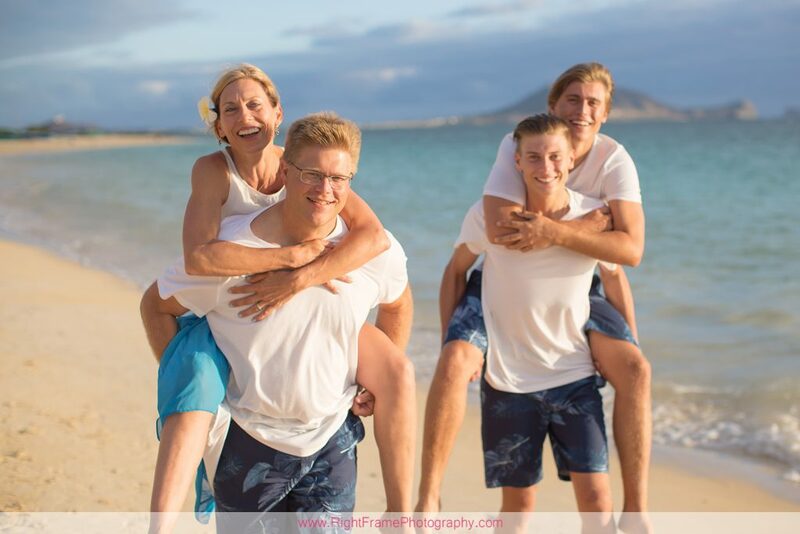 It was a bonus of fun which must have helped open our hearts and kept us smiling for the photo session followed right after. 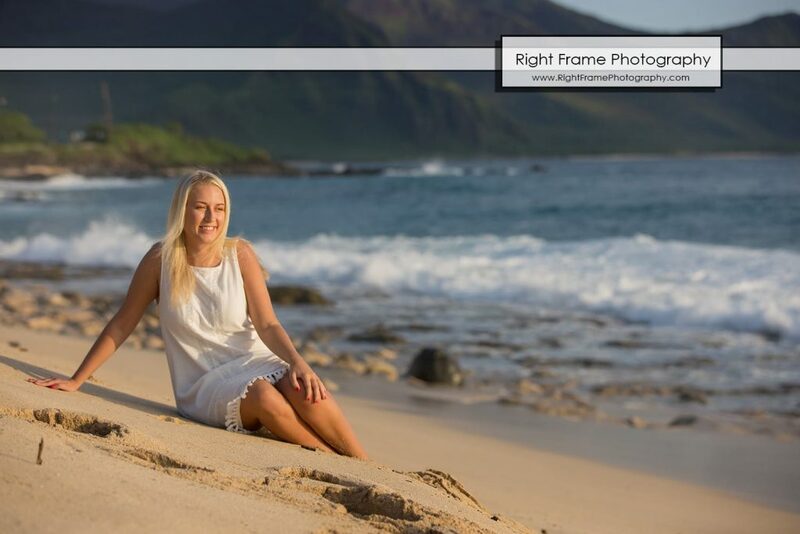 Radek is a such a talented photographer. 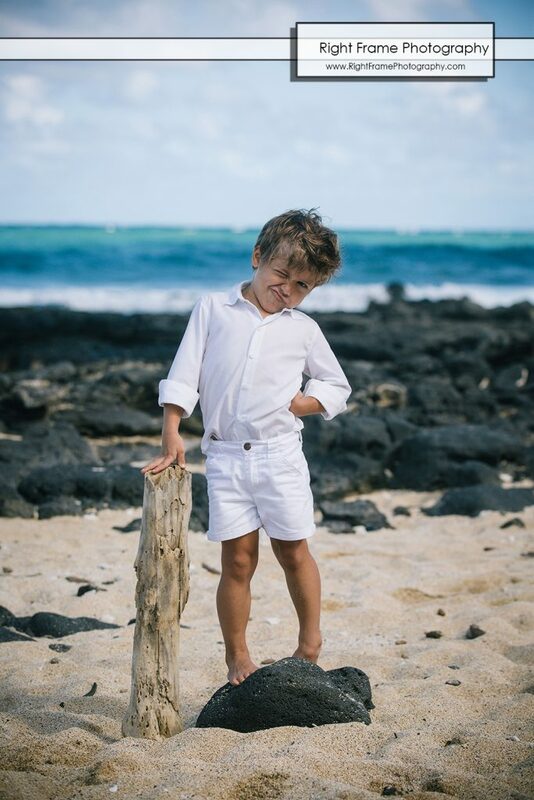 We just followed his instructions to different spots and posed as he would teach us. 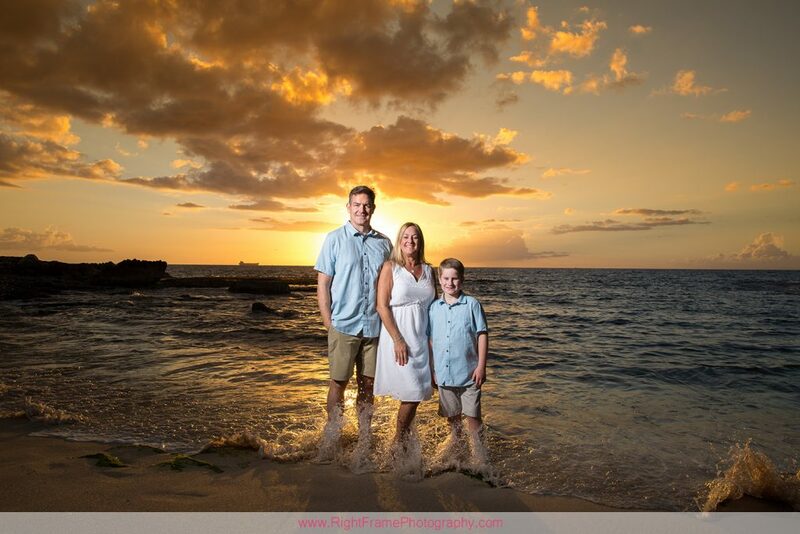 We had absolute trust in his judgement and directions and the portrait turned out to be stunning. 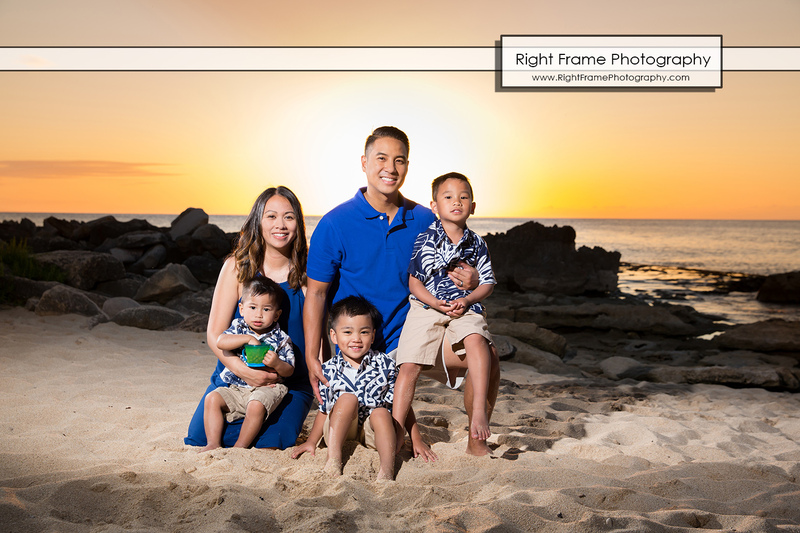 No one believes it was just a mere hour of work after they looked at our portraits. 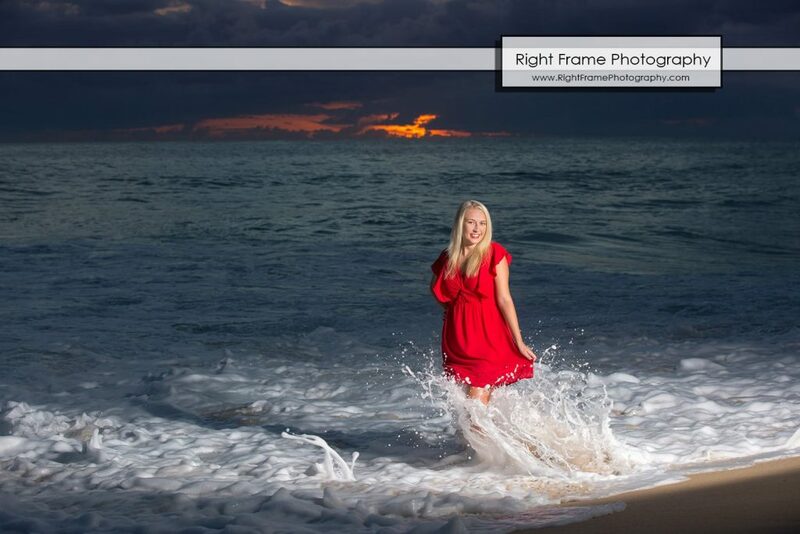 Radek is so familiar with the location, knowing his angles, the light, the shadow and even the winds! 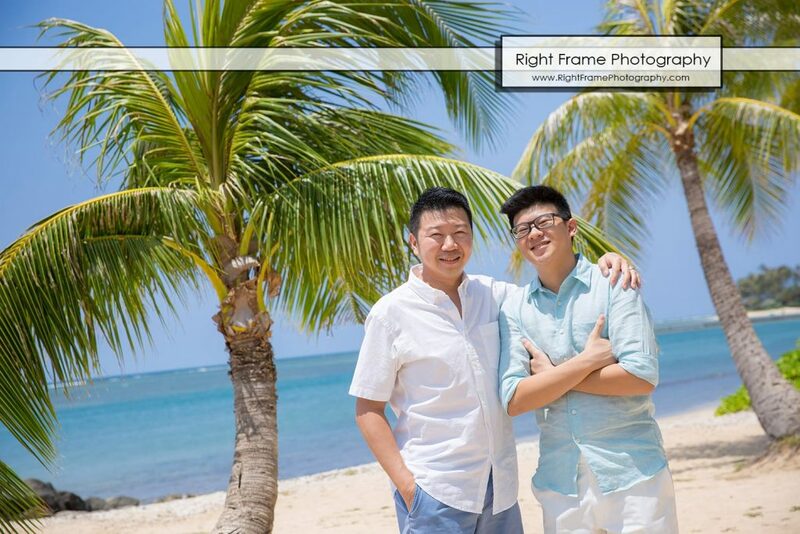 It was an absolute breeze for us even under the scorching sun. 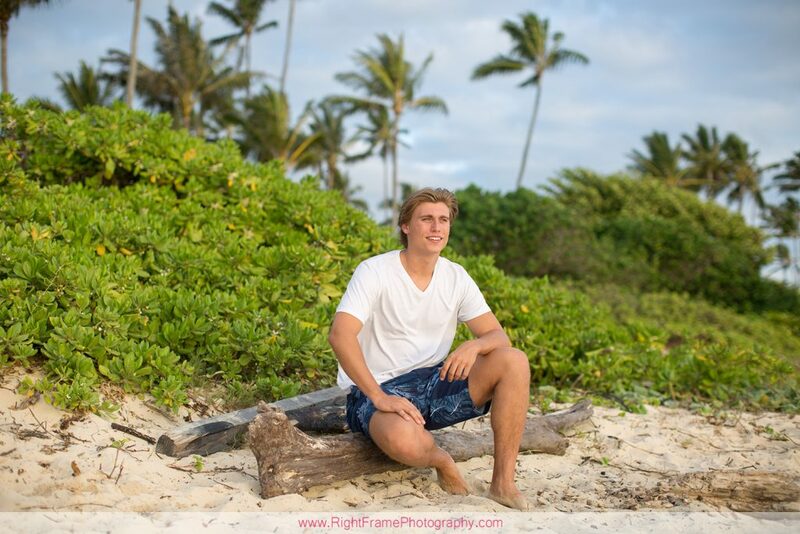 Radek is an extremely gentle and friendly guy. 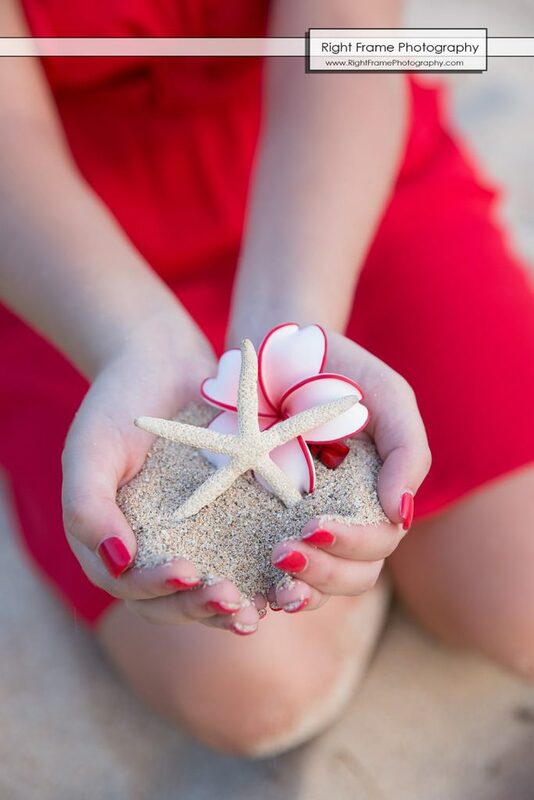 He made us feel so relaxed so we could be our most natural selves. 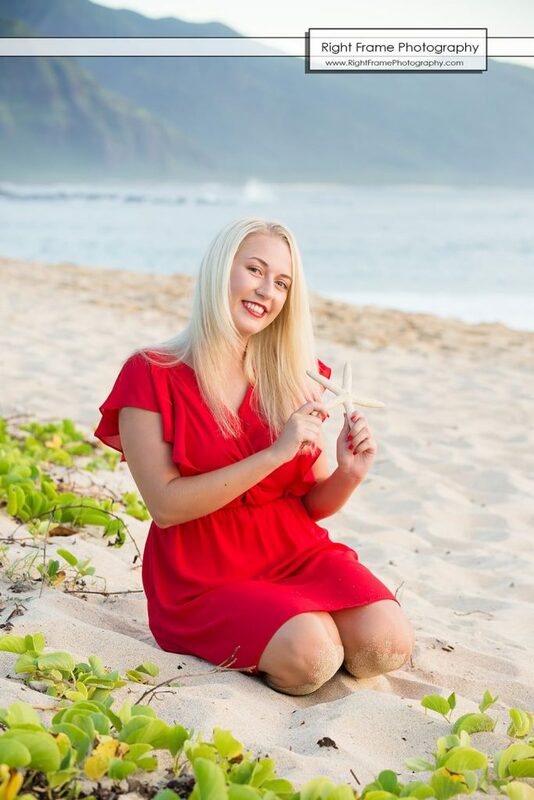 Radek had a portable mobile credit card payment device and we could just close the payment so conveniently in a few minutes when the shooting was complete. 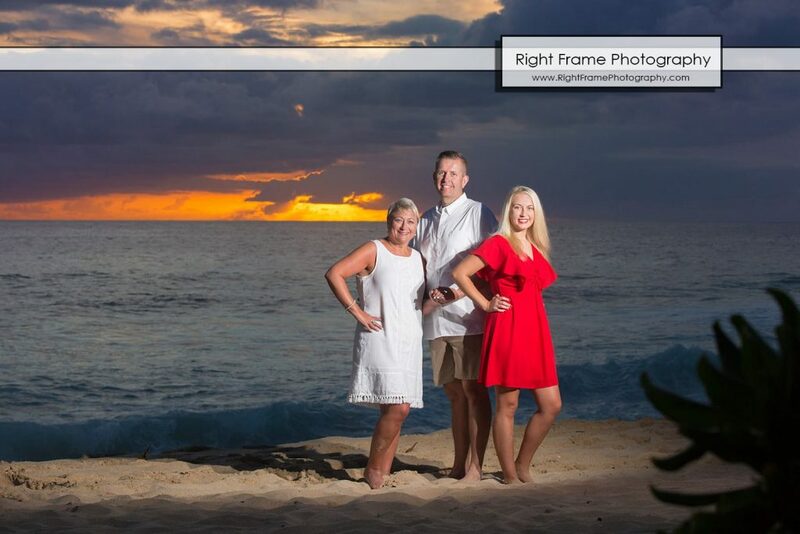 Radek is so professional. 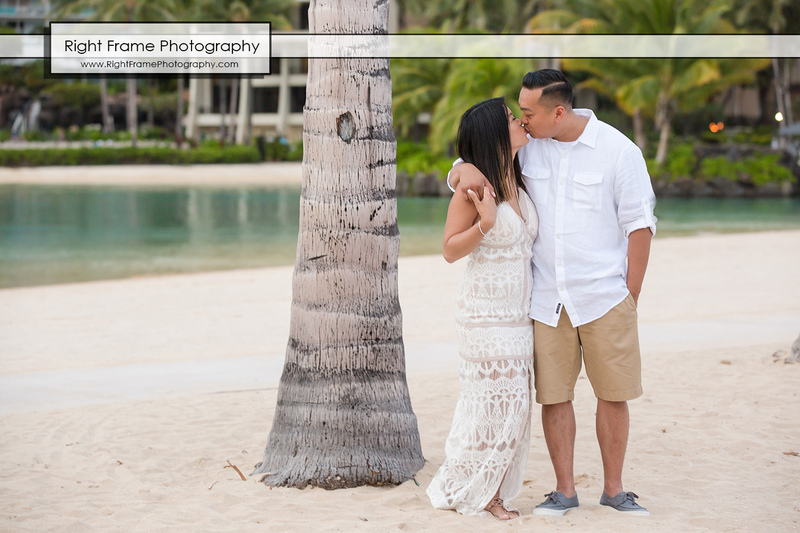 Everything went extremely smoothly. 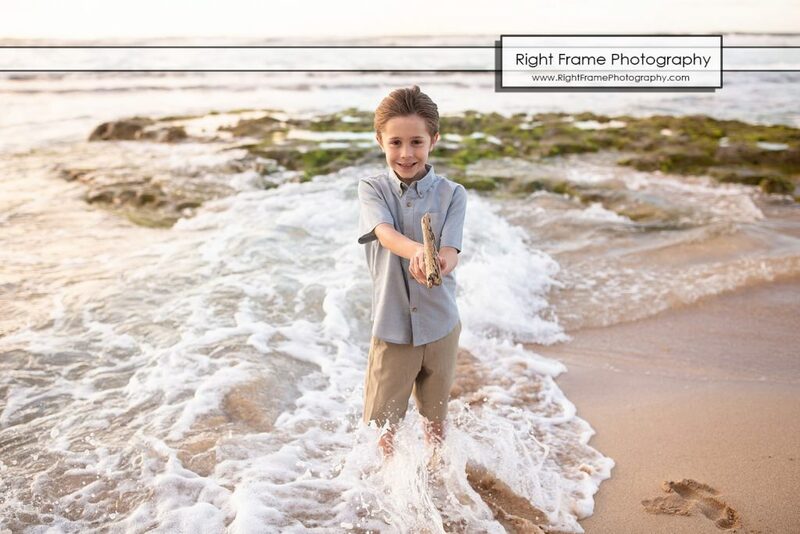 He cared enough to advise us where to grab a bite before he headed off to another shoot. 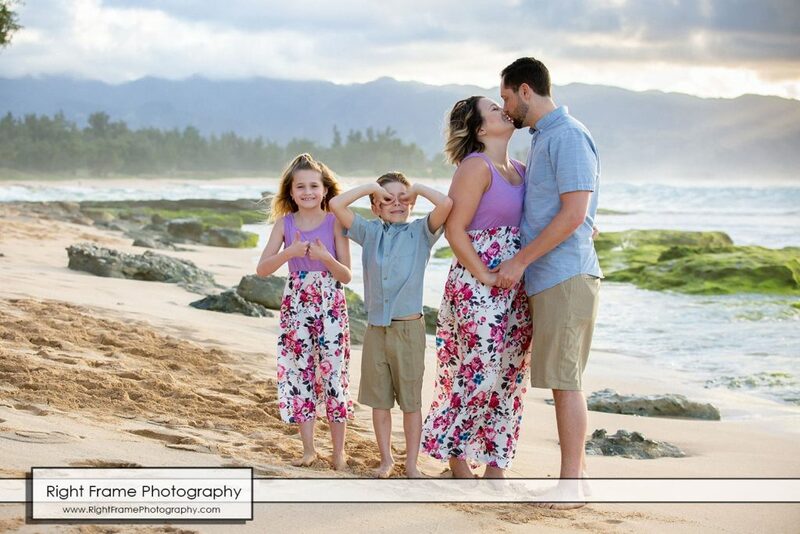 He took good care of us and remembering we were not familiar with the neighborhood. 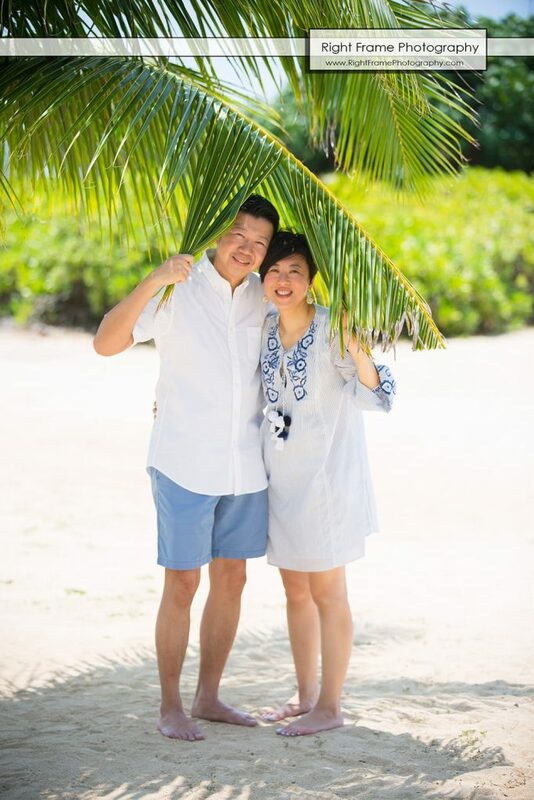 Just 2 weeks after we arrived home, we got the online pictures as expected. 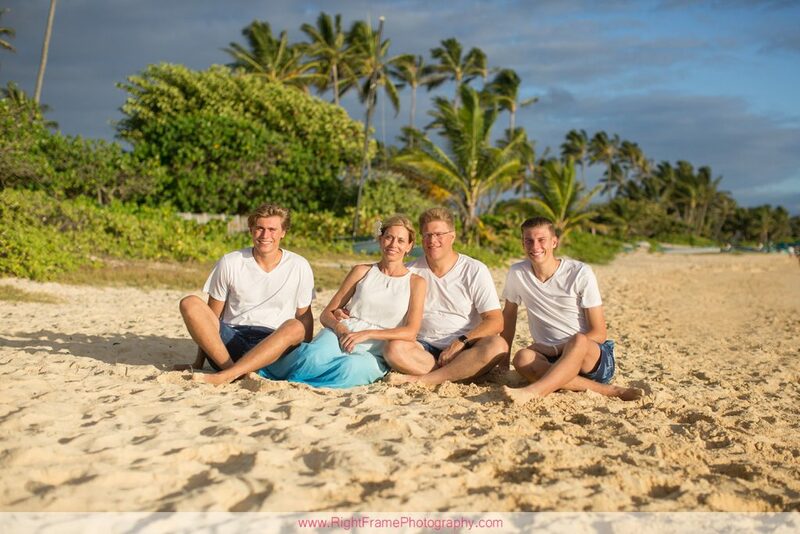 Radek sent us the pictures as promised despite it was his peak season. 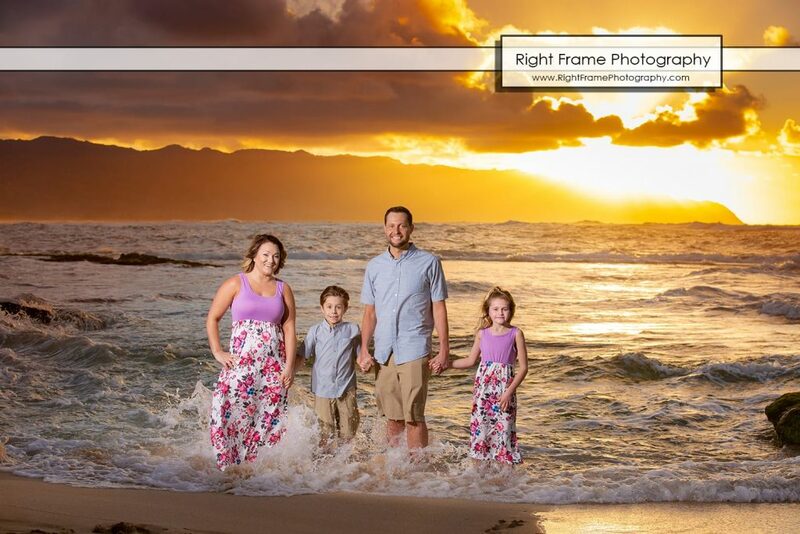 They were professionally touched up and done! 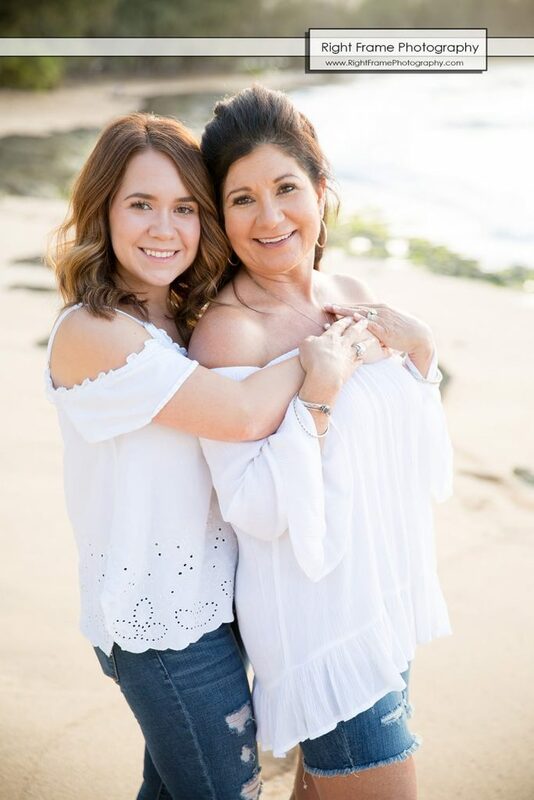 Many of our family and friends at home looked at our downloaded online catalog (which is a photo gallery icon on our iphones – so tech savvy!!) 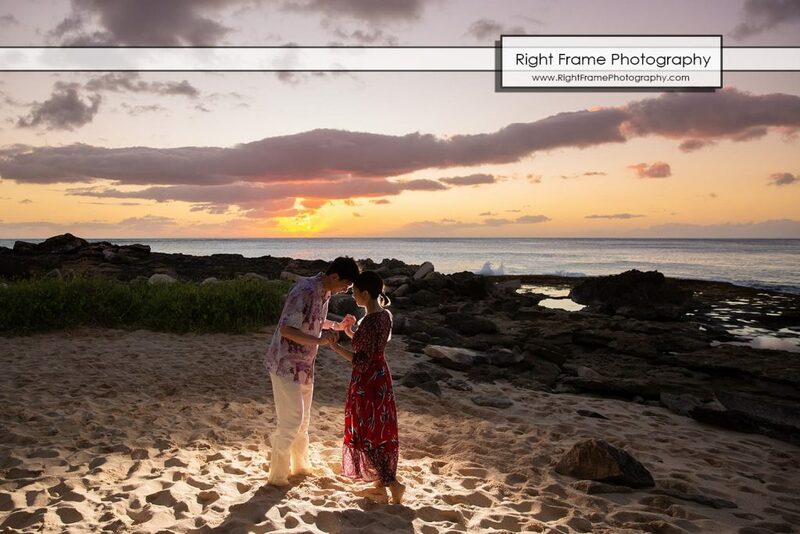 and were wowed! 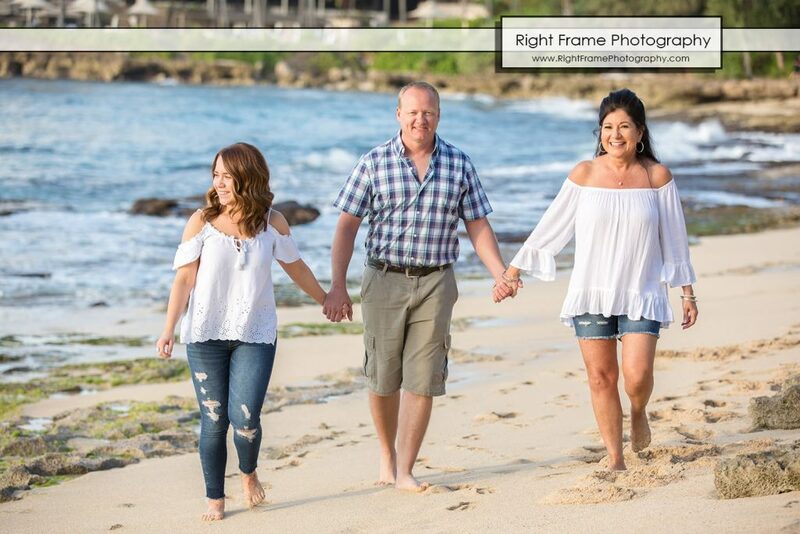 We are blessed to have that moment captured as a family with our elder daughter still being our baby before she turns to be a young adult. 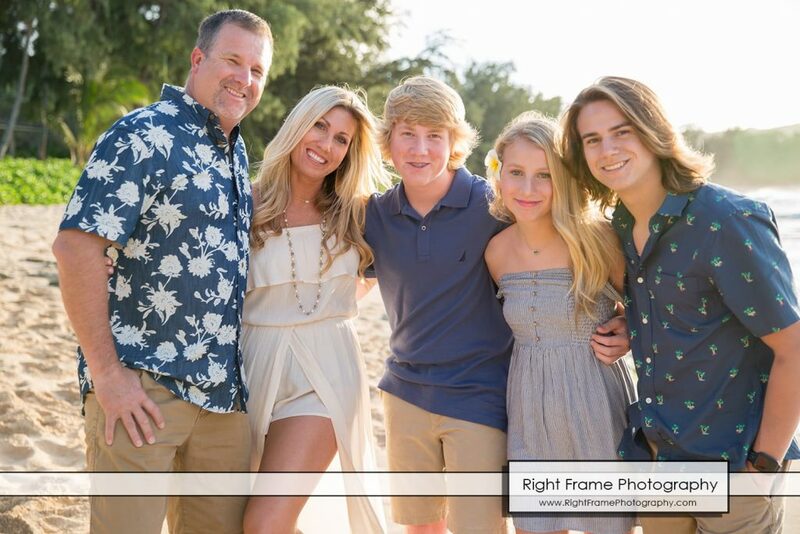 This will always be a very special family portrait out of the many we have. 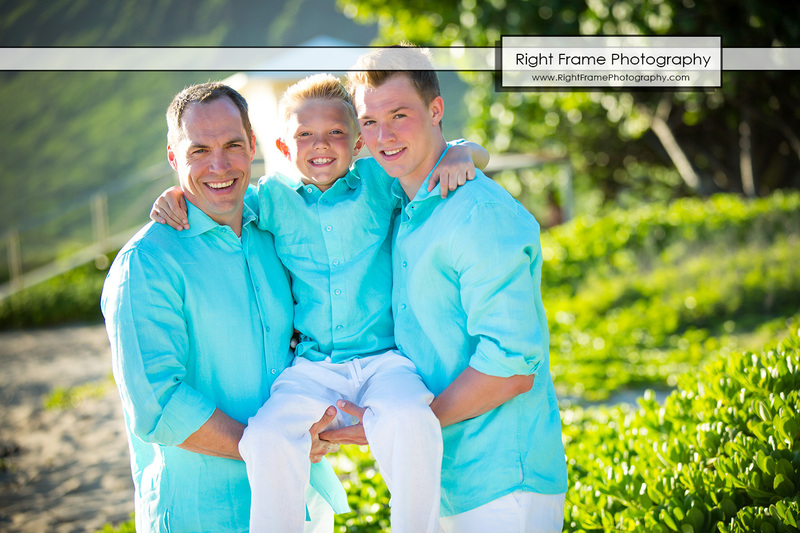 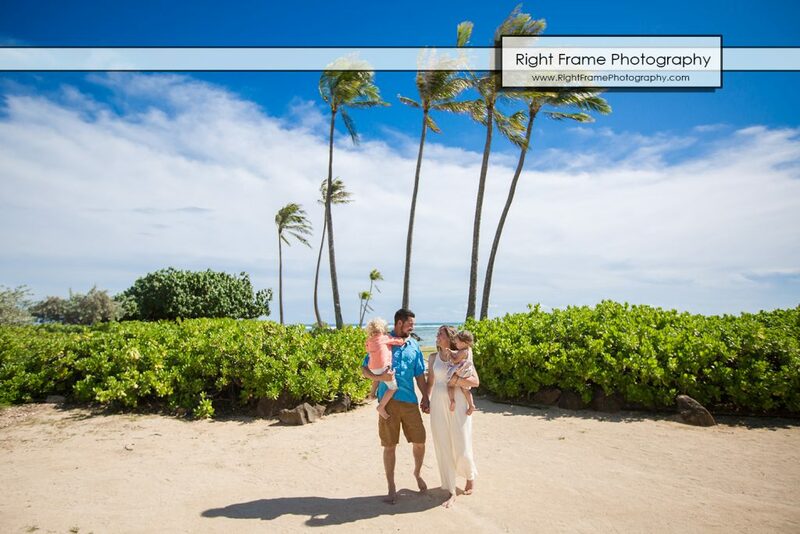 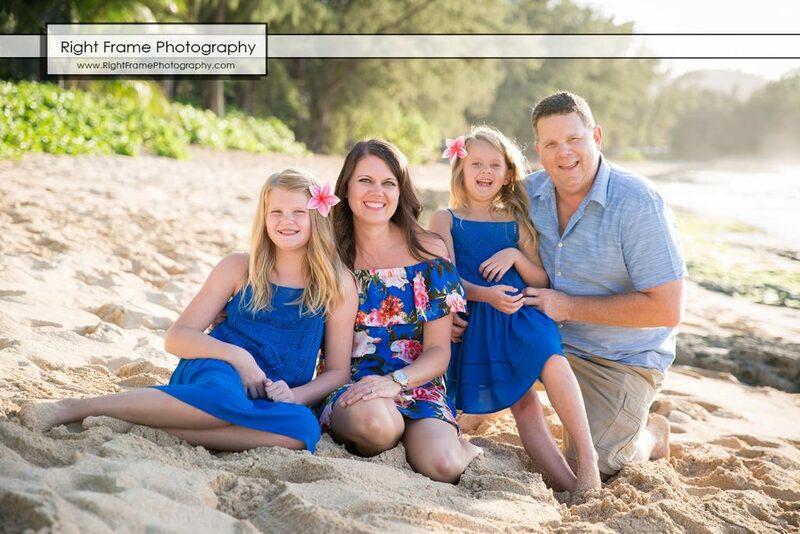 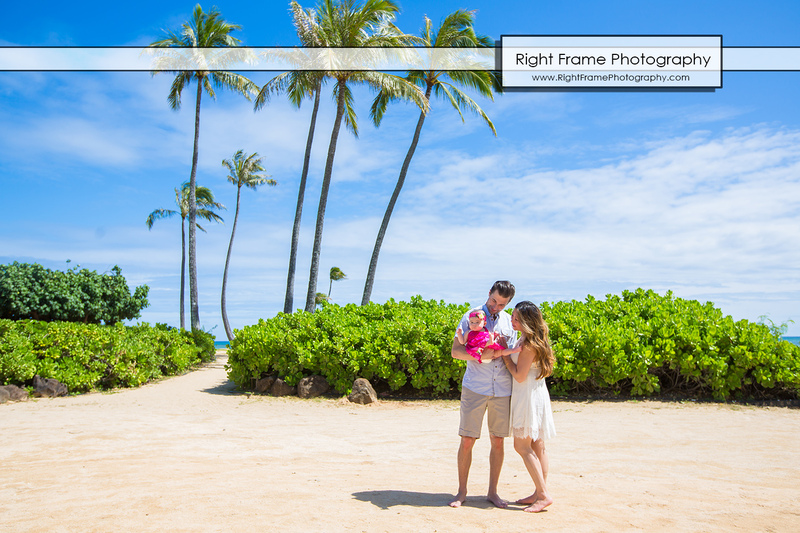 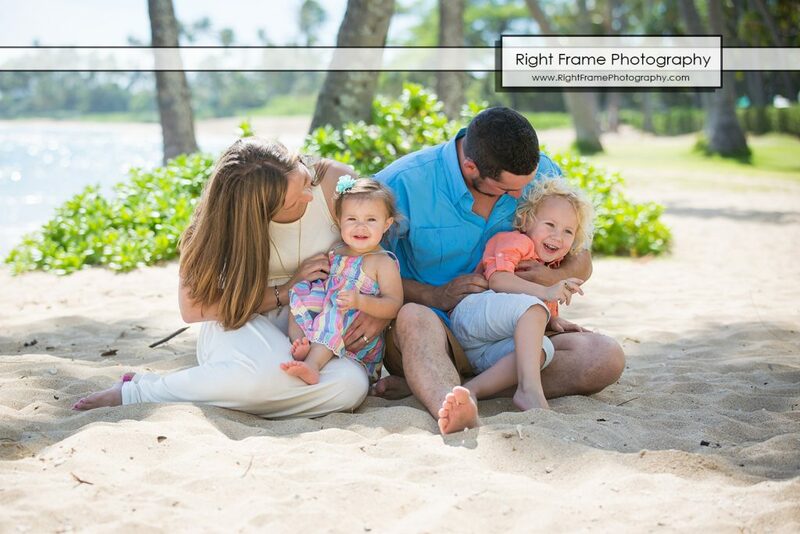 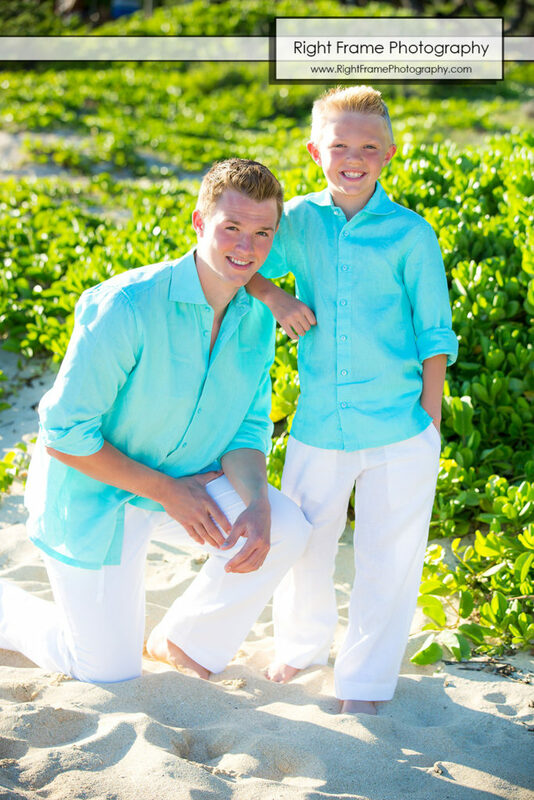 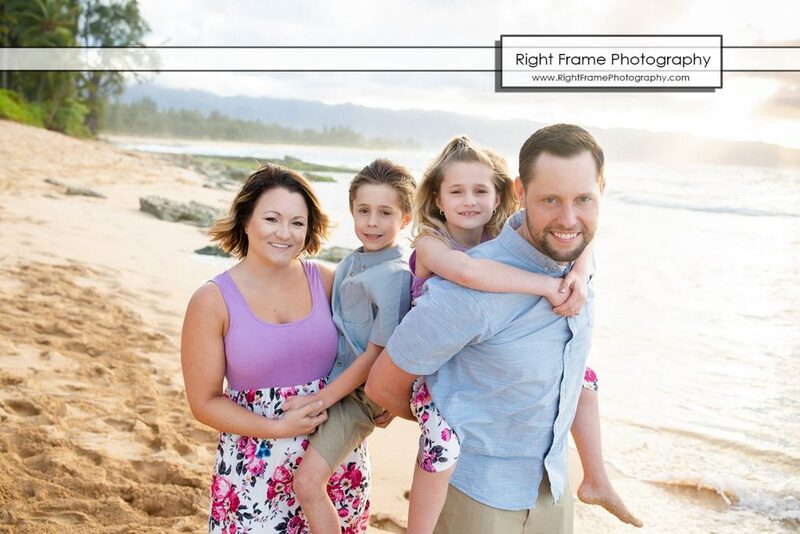 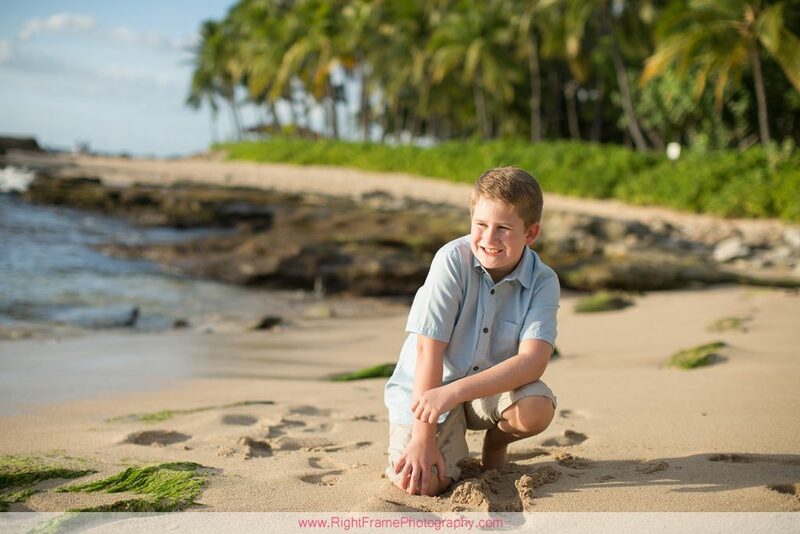 Kinsey’s Family Portraits was shoot at Waialae Beach Park (near Kahala Resort), Oahu Hawaii. 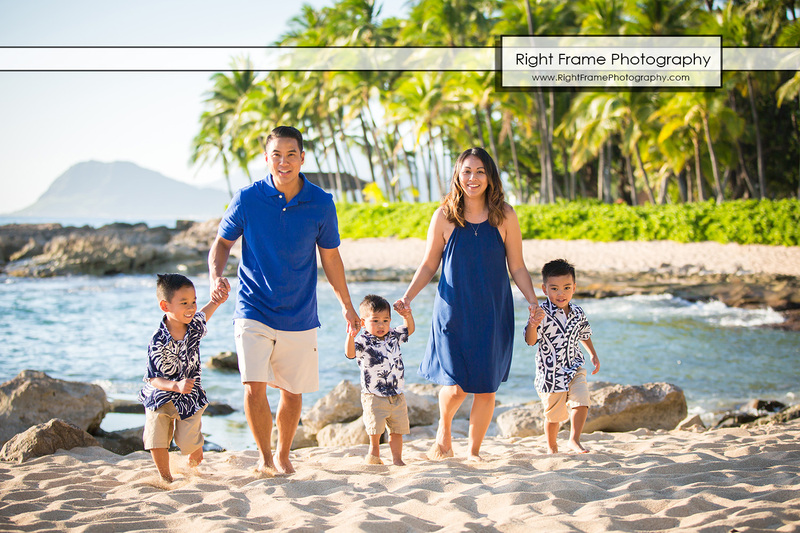 Melissa’s Family Portraits was shoot at Secret Beach (near Four Seasons Hotel and Aulani Disney Resort, Oahu), Oahu Hawaii. 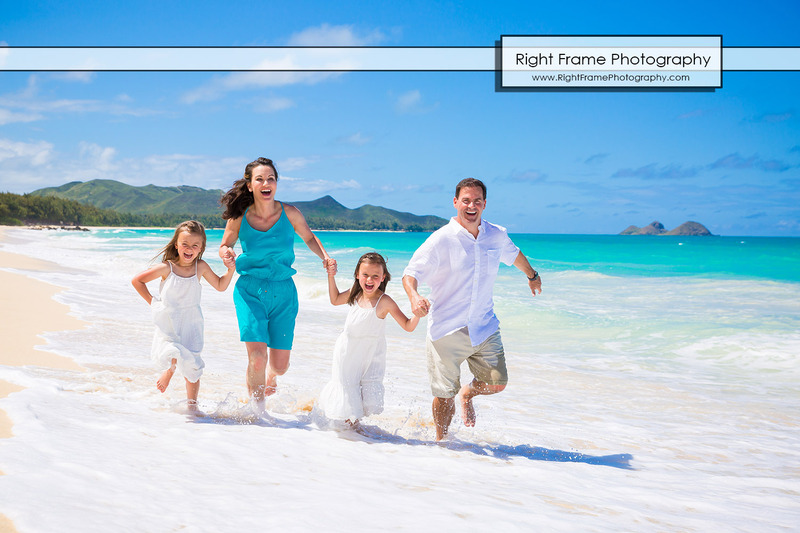 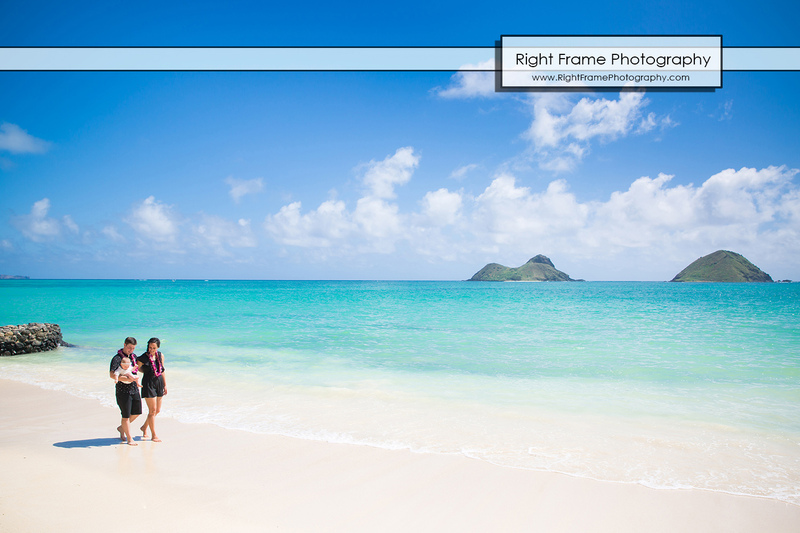 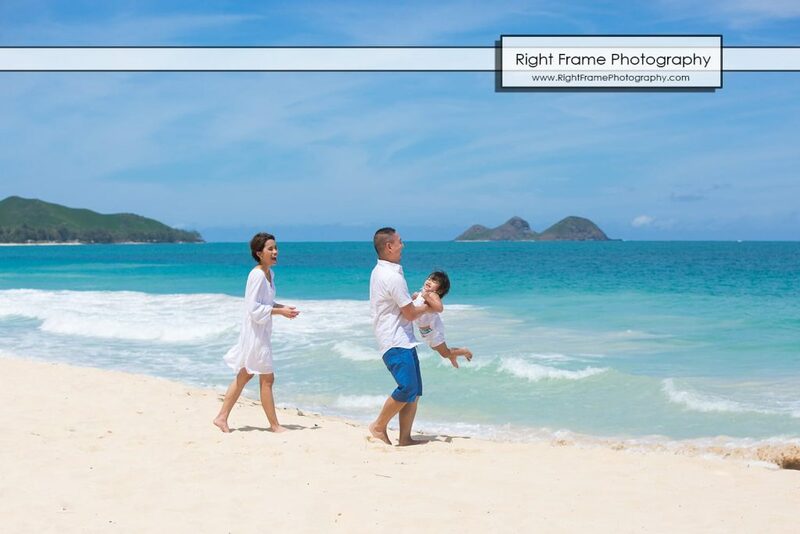 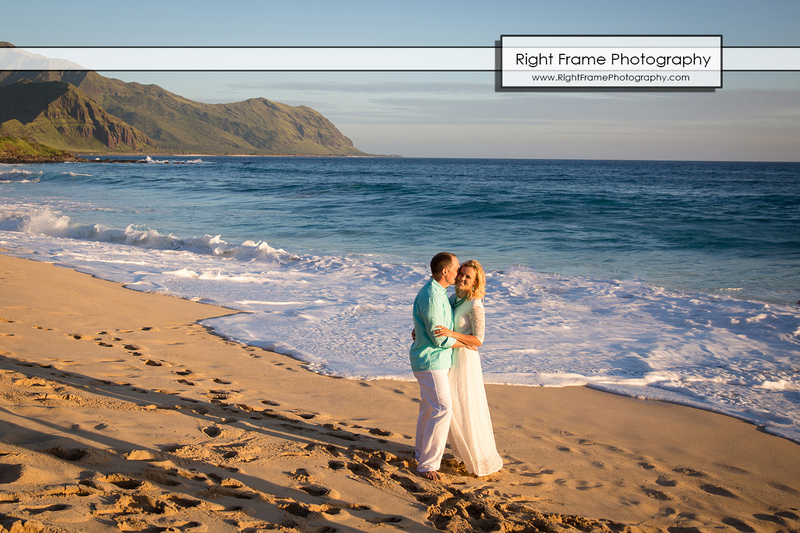 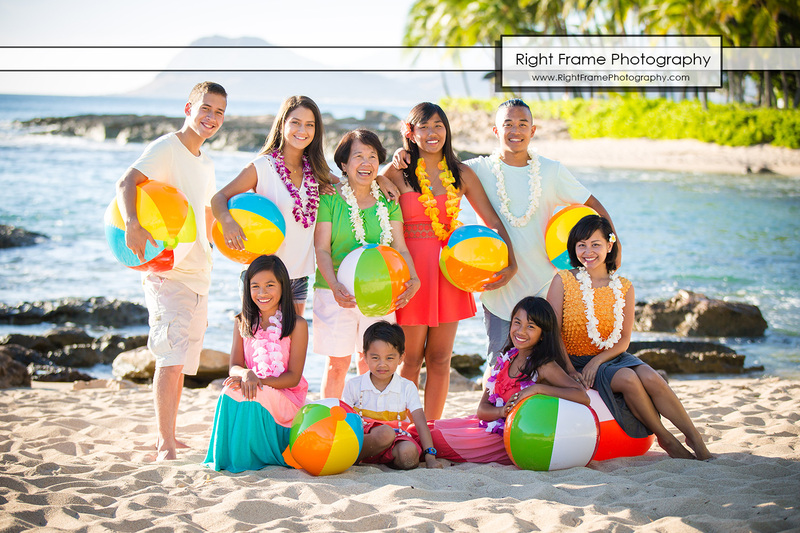 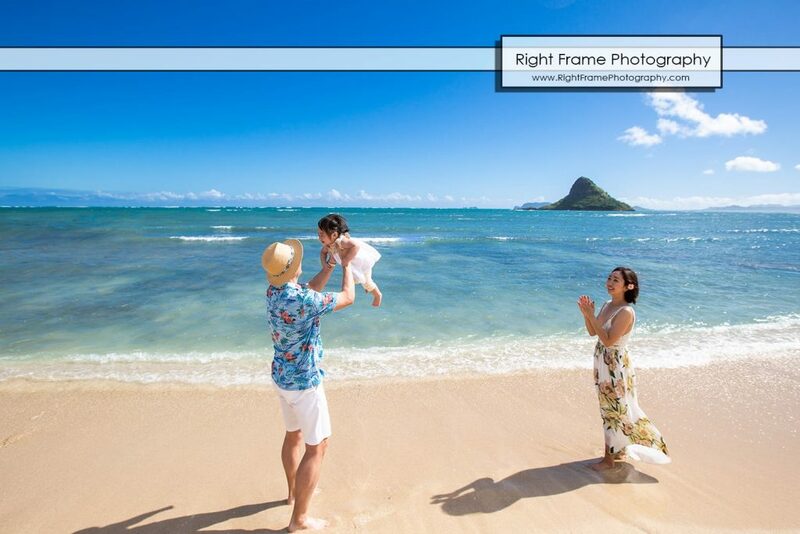 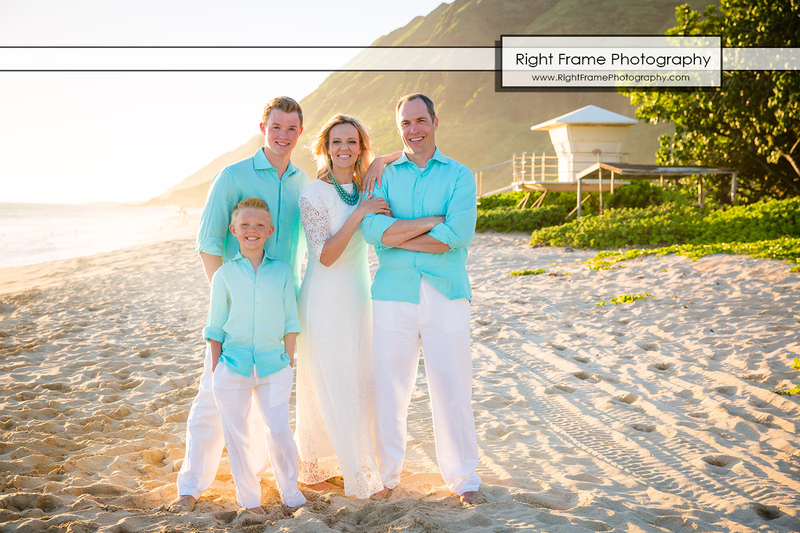 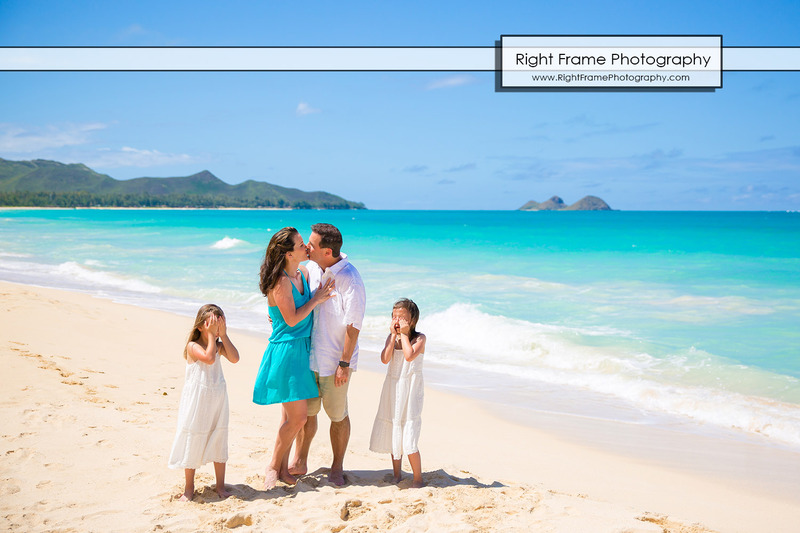 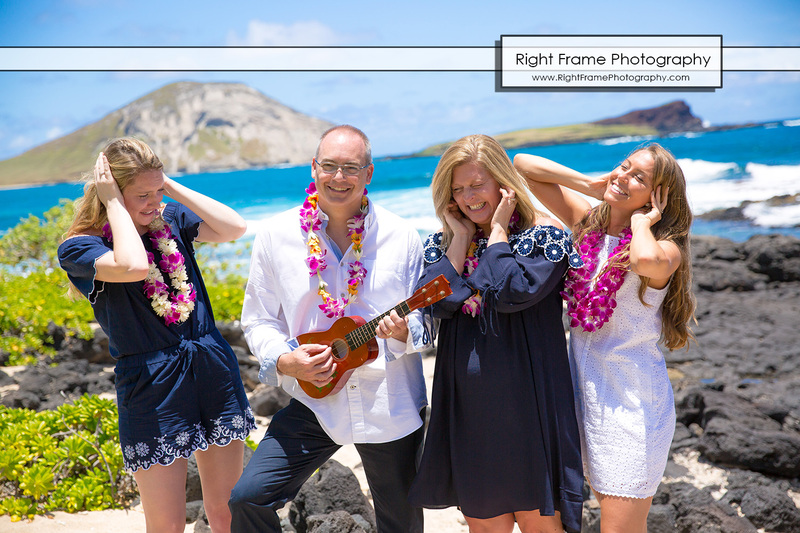 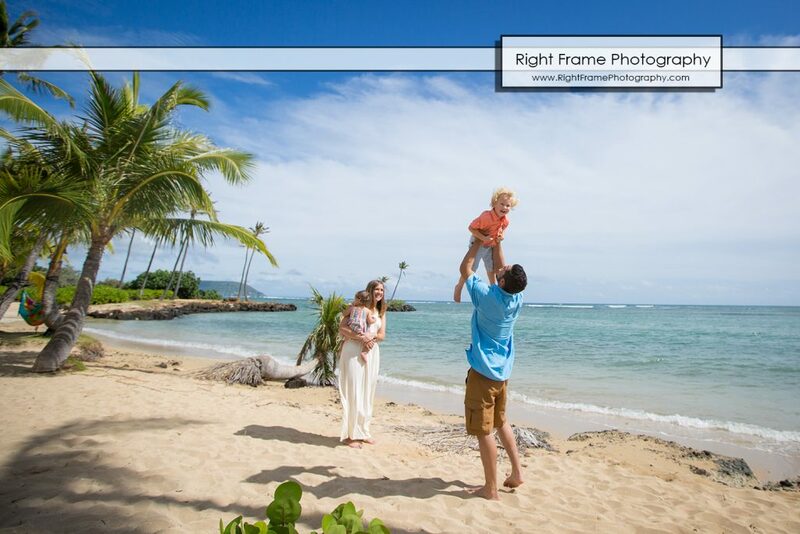 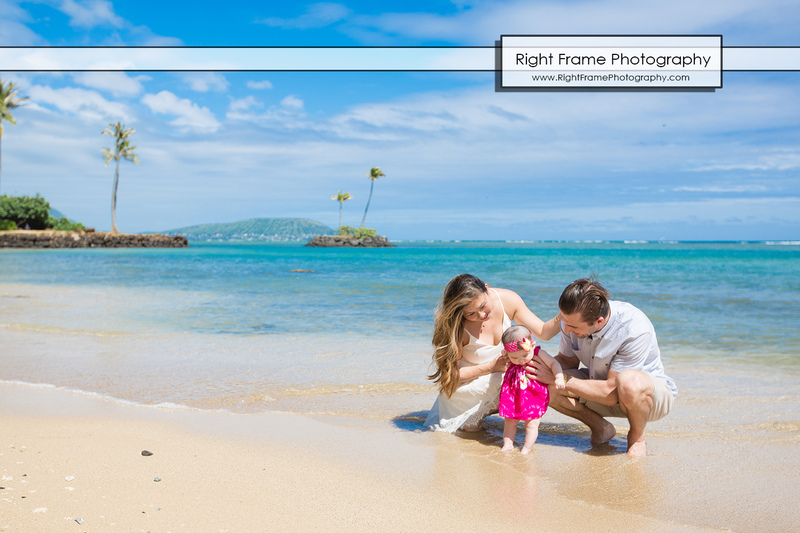 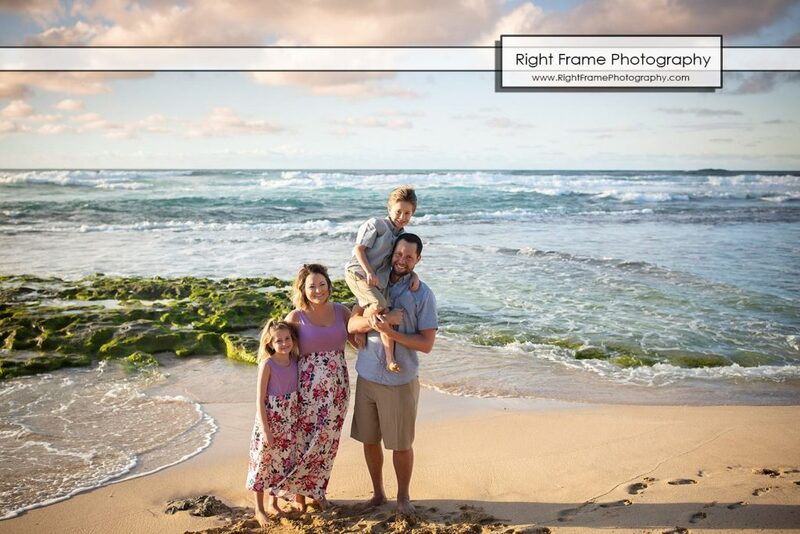 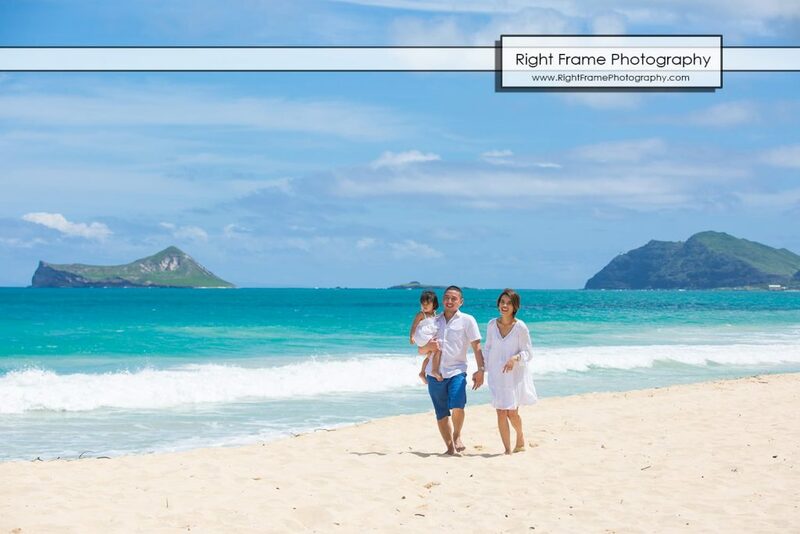 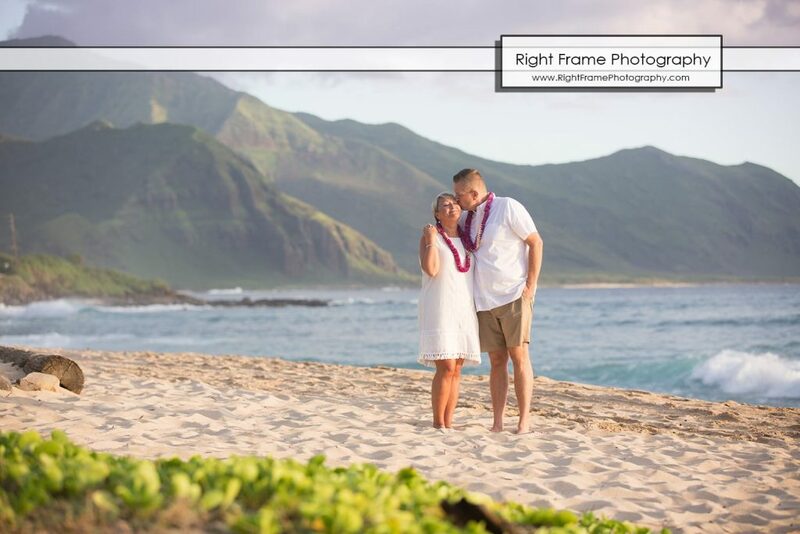 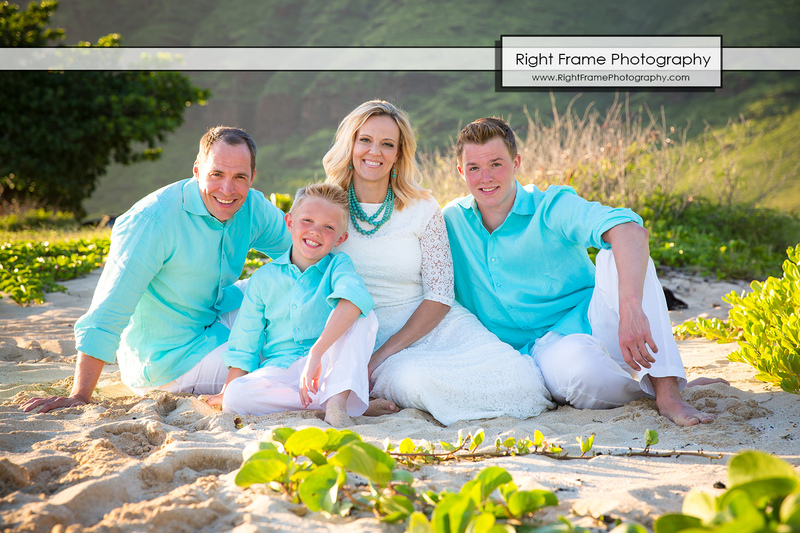 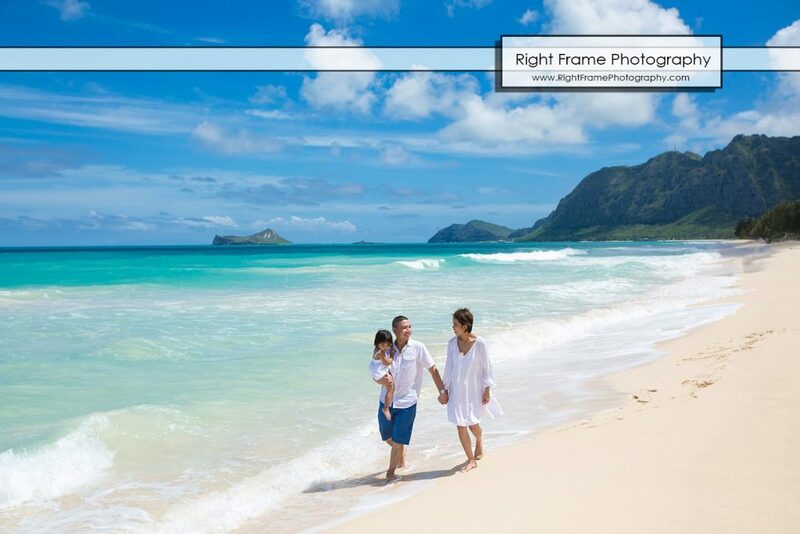 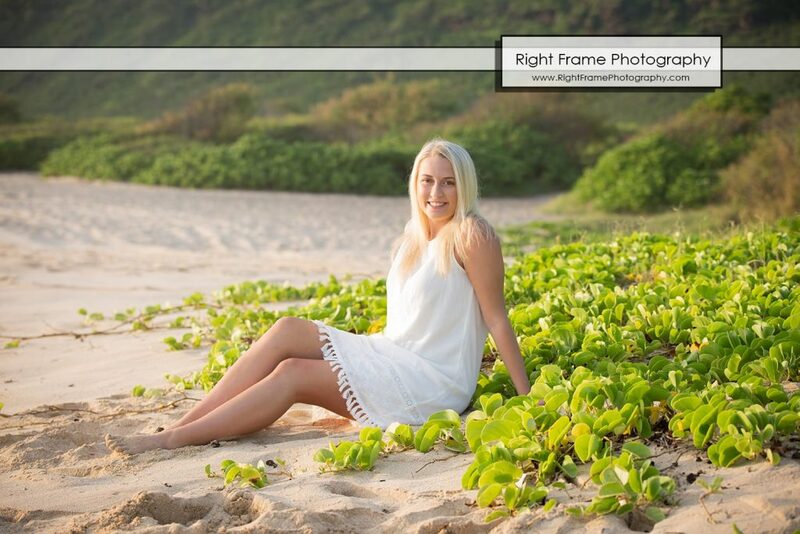 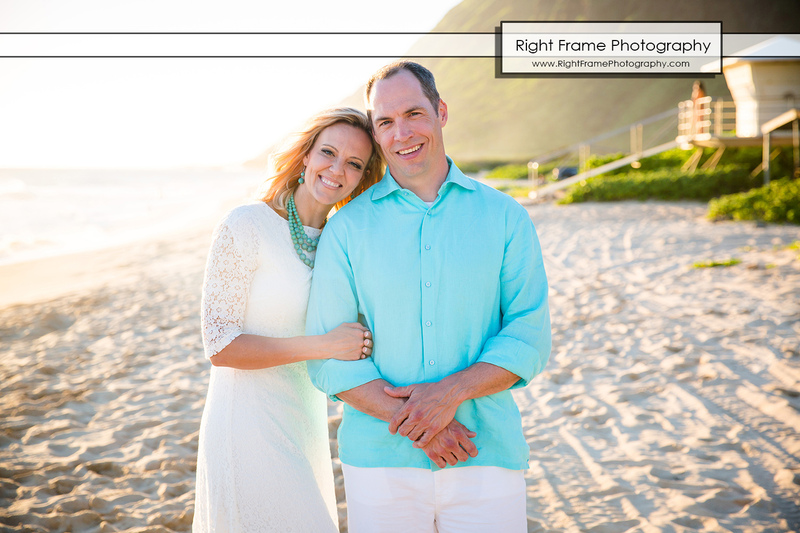 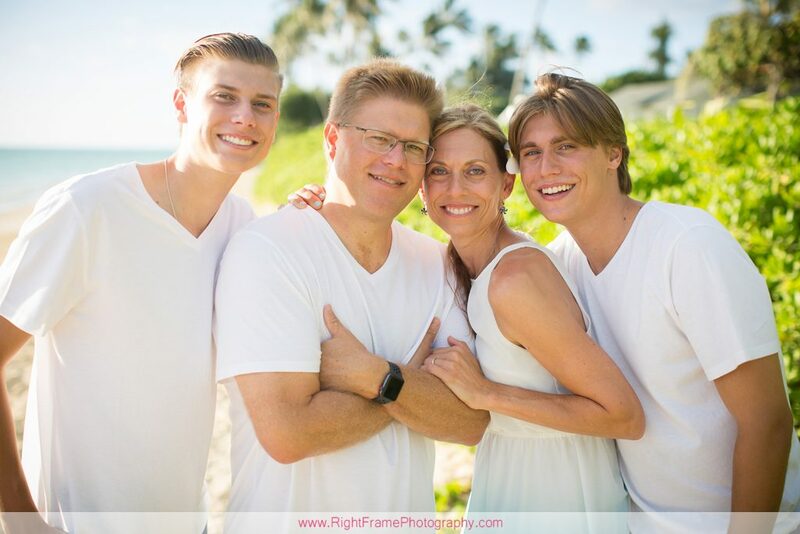 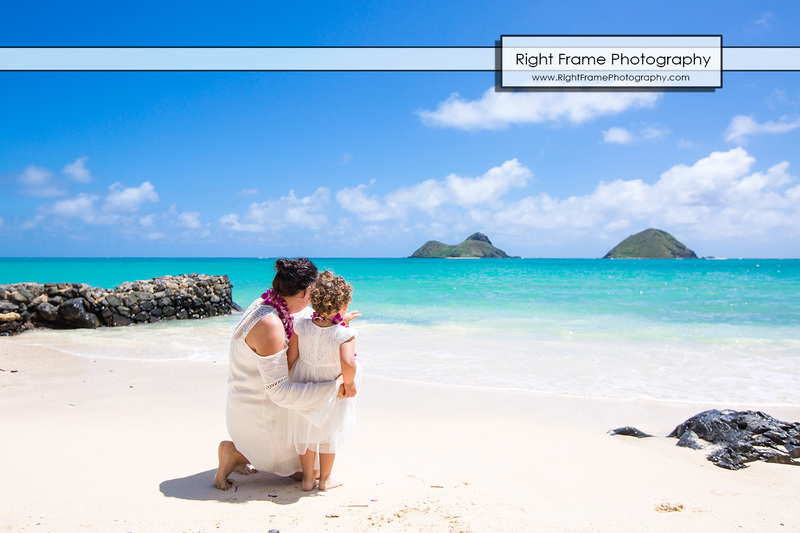 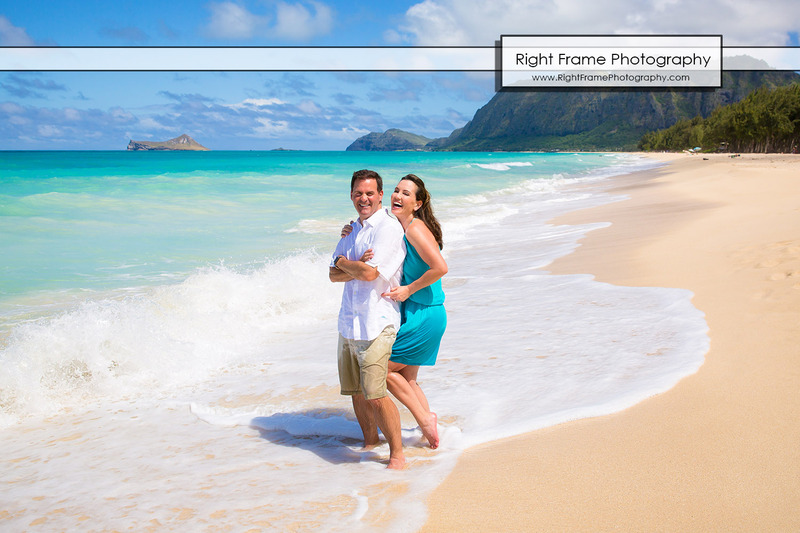 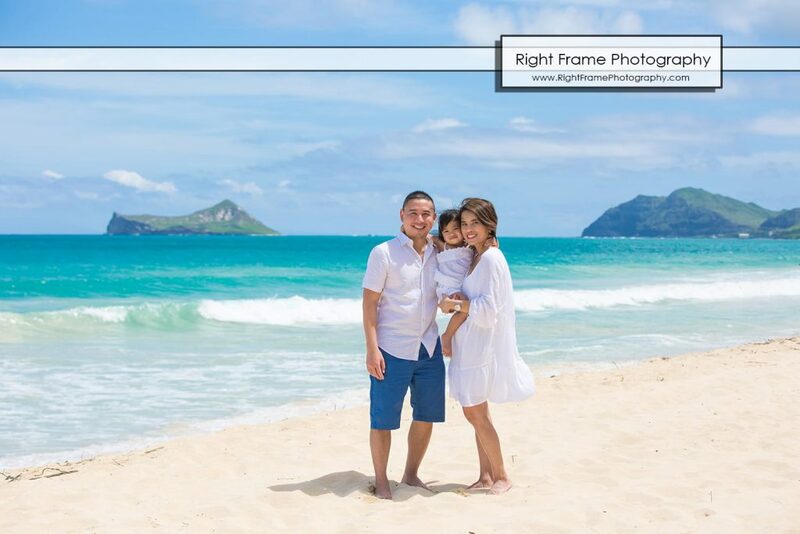 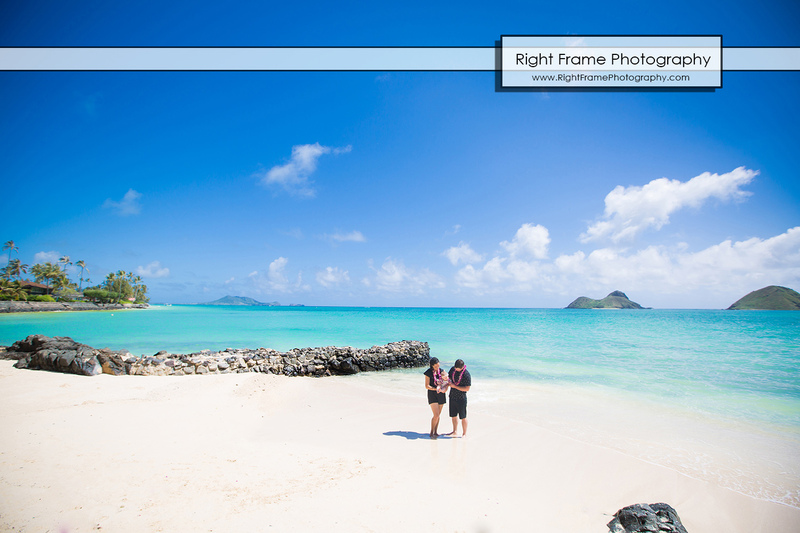 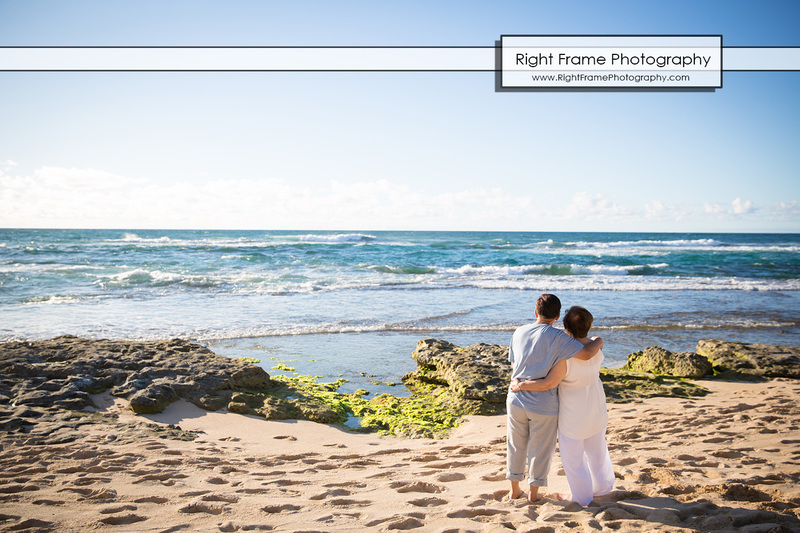 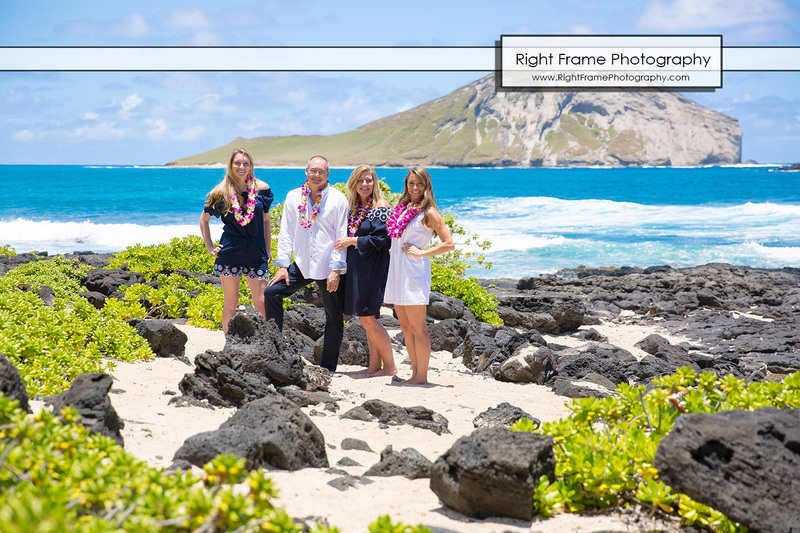 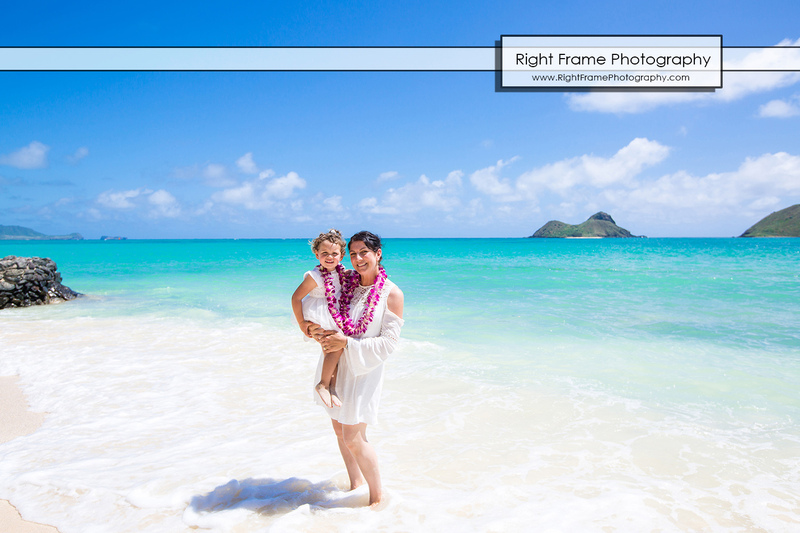 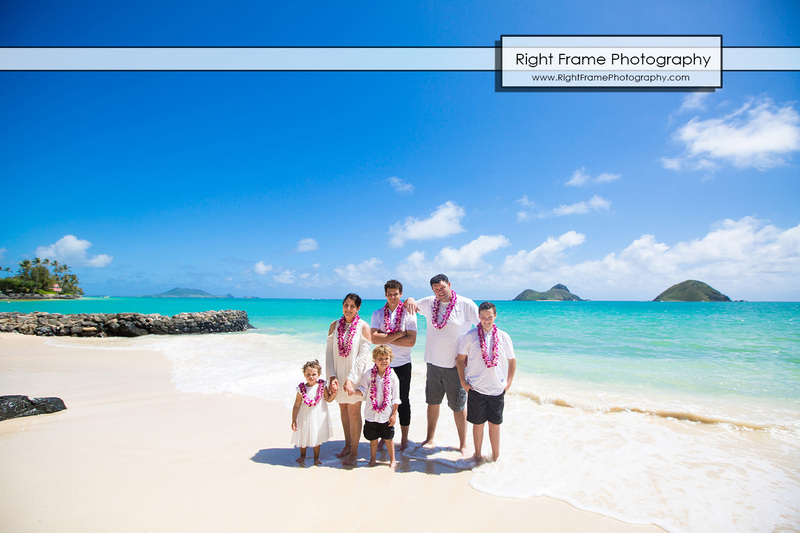 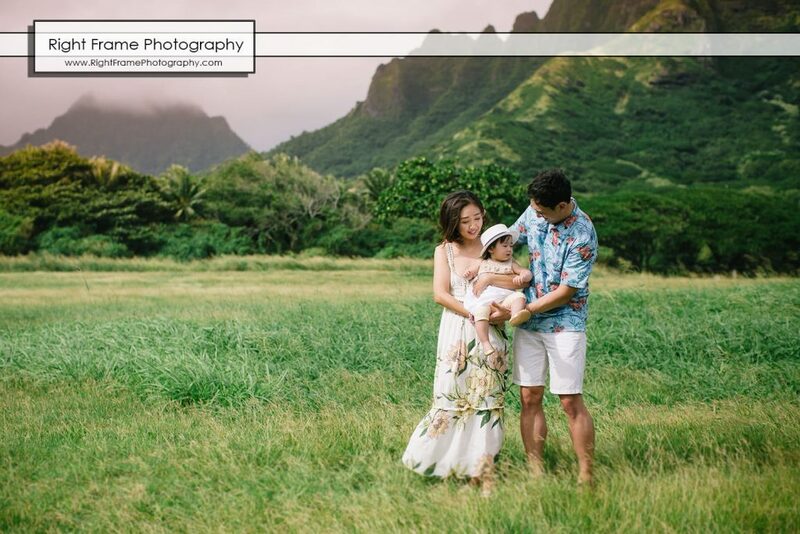 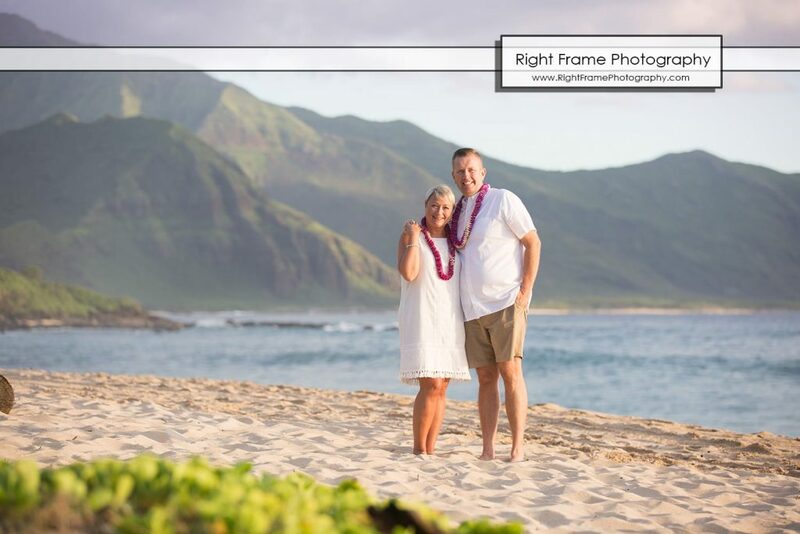 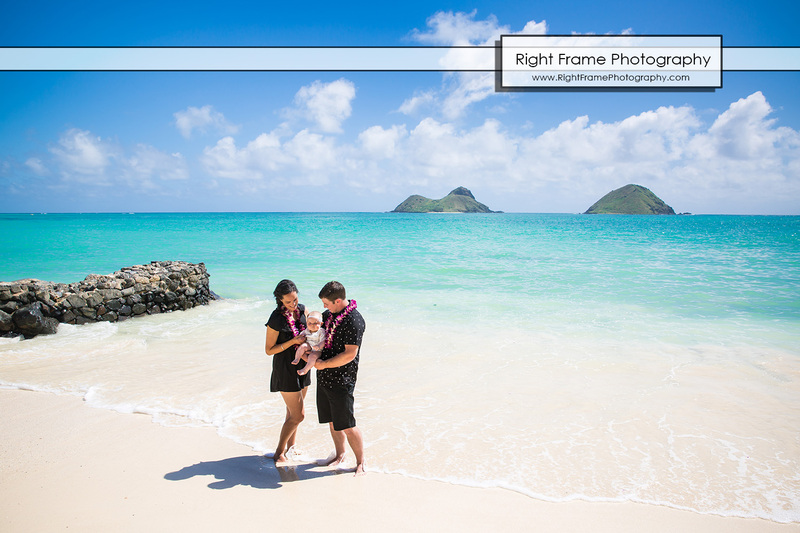 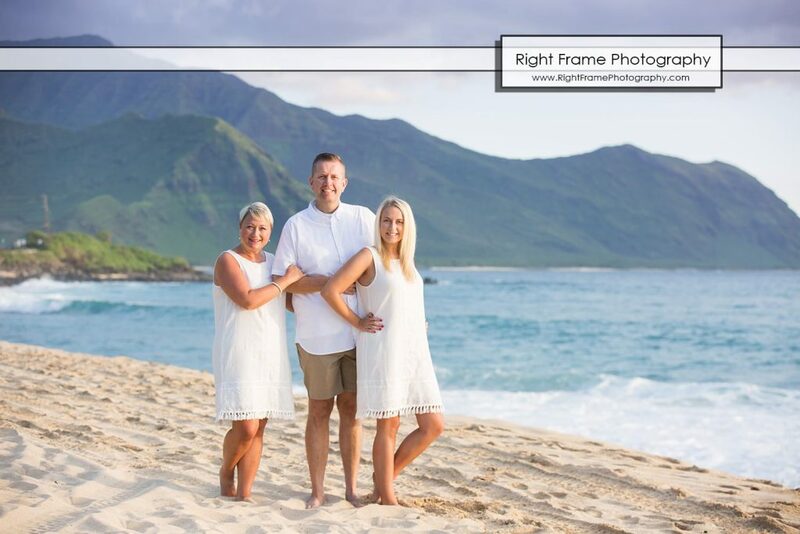 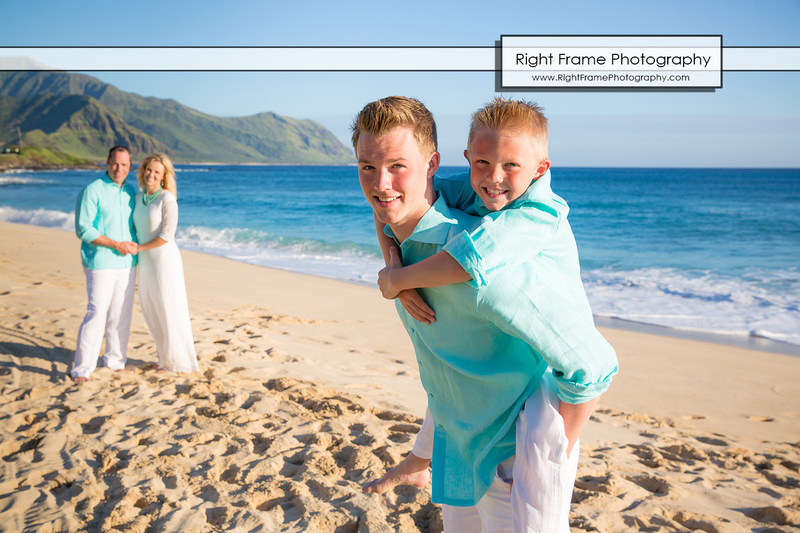 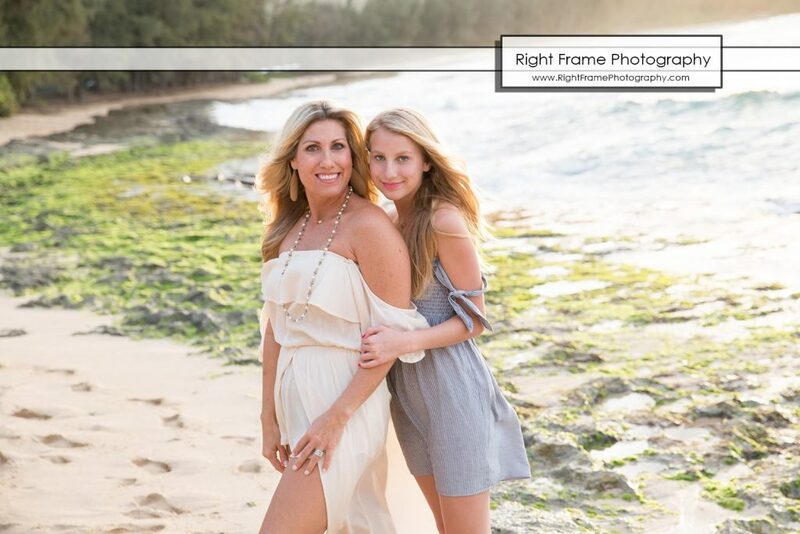 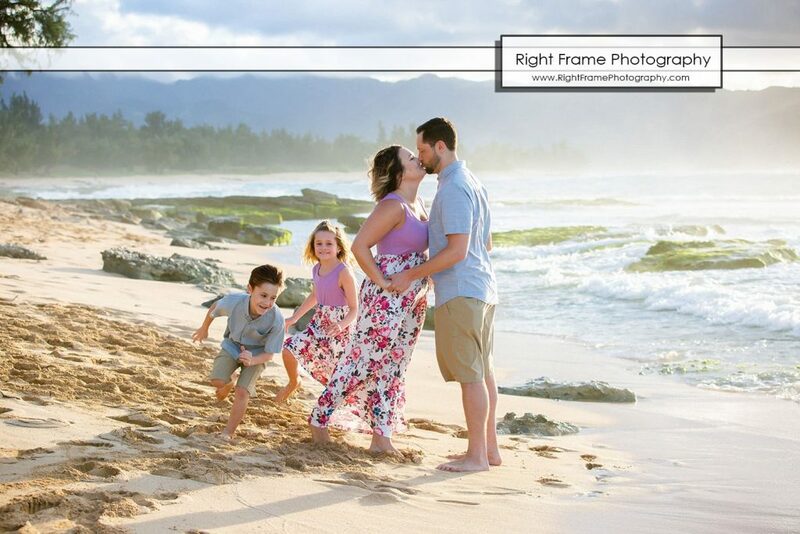 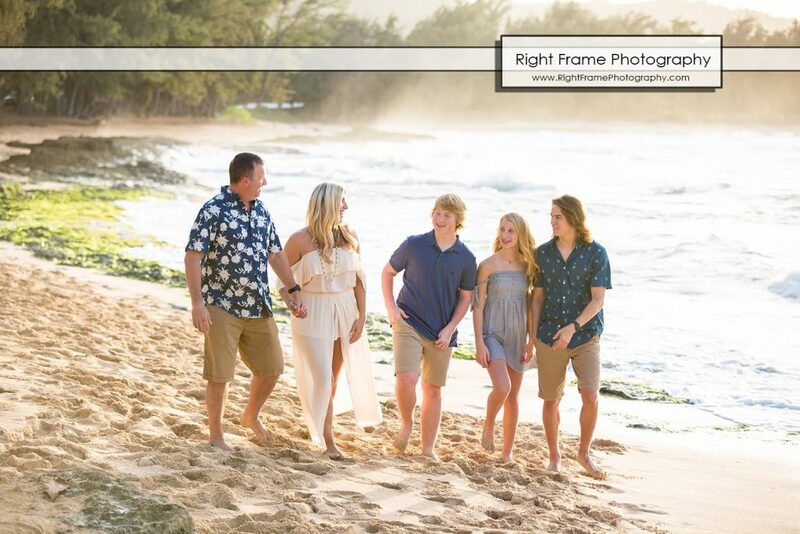 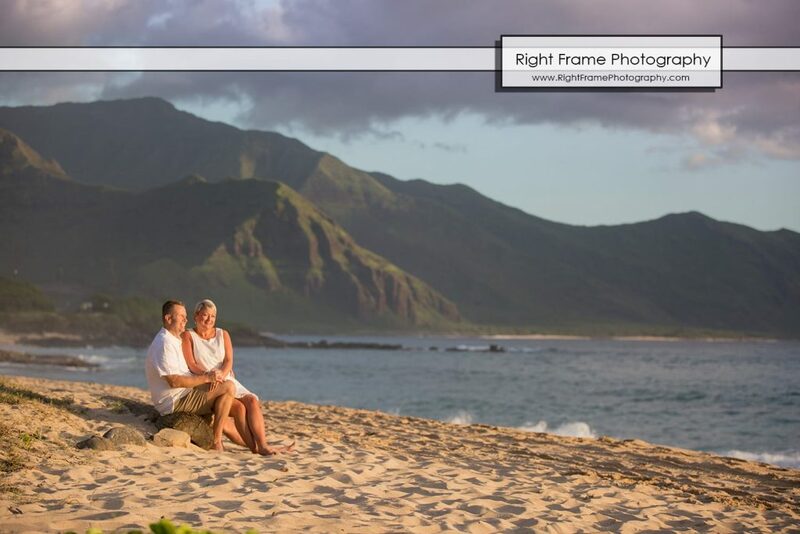 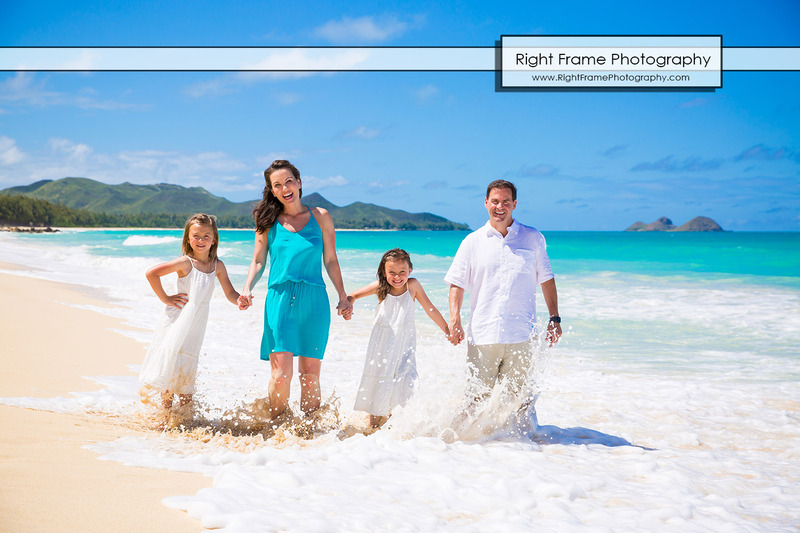 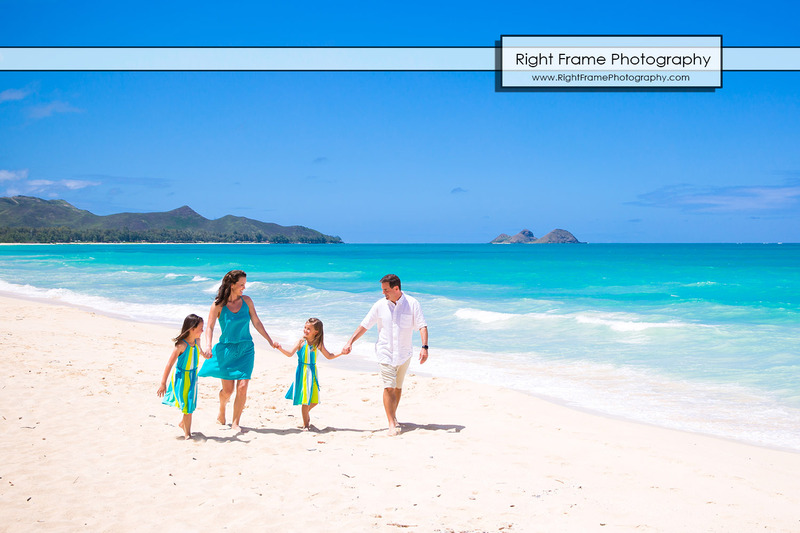 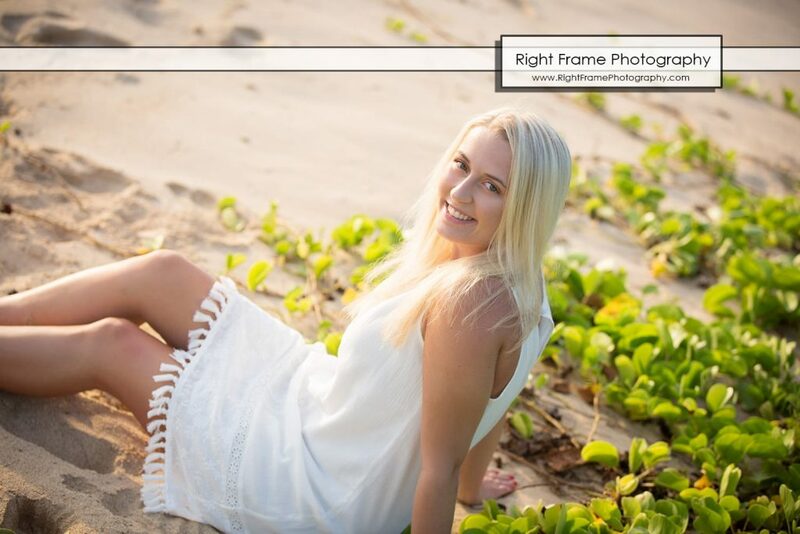 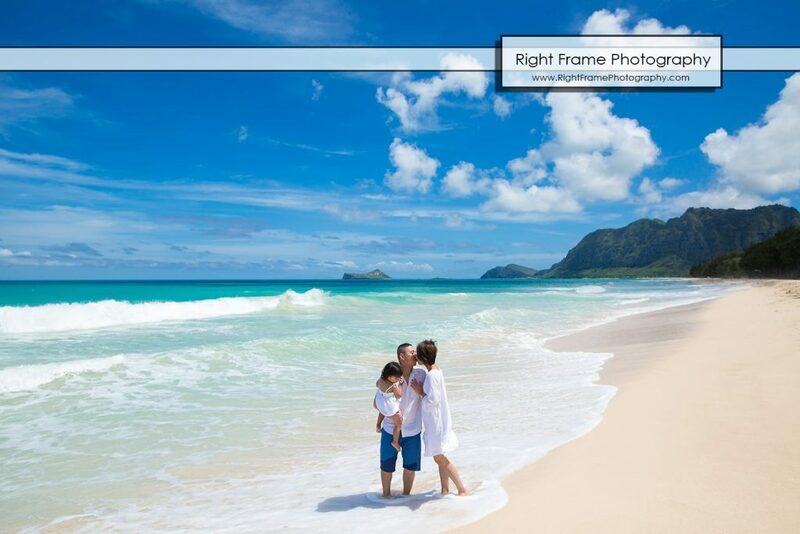 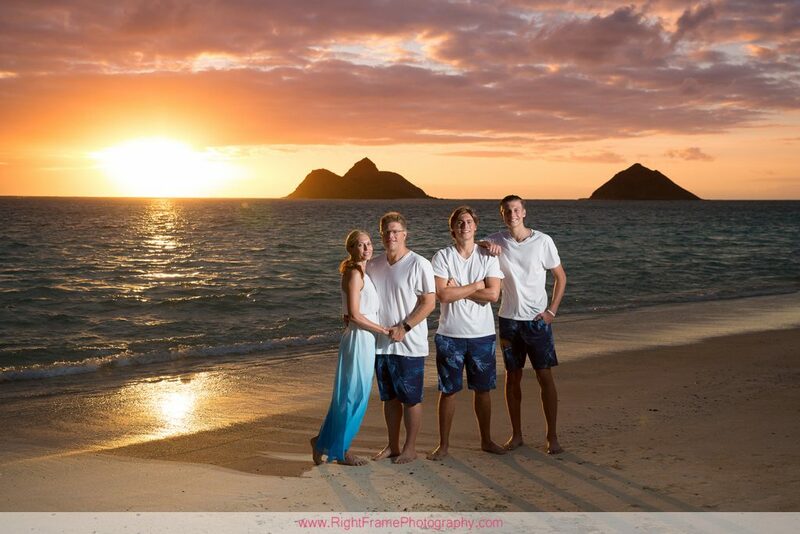 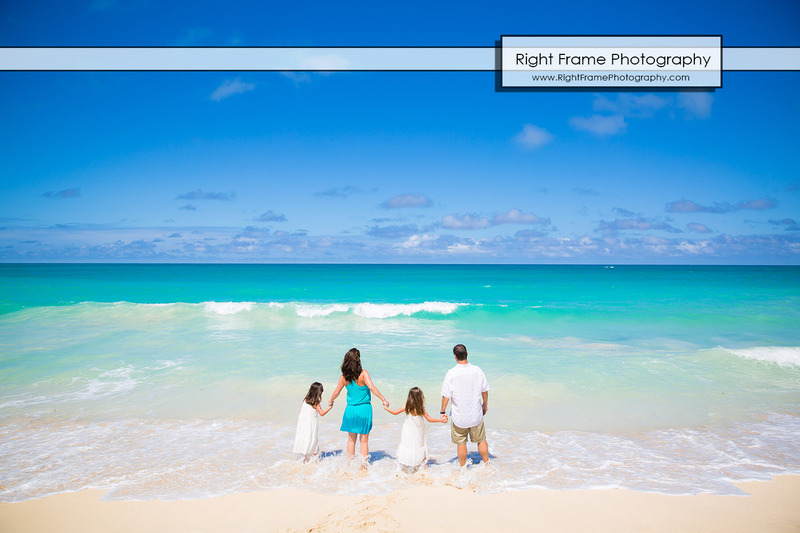 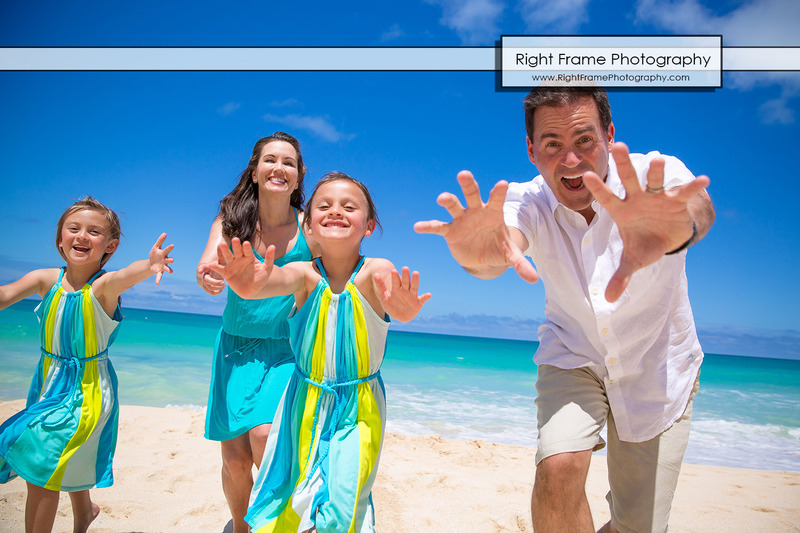 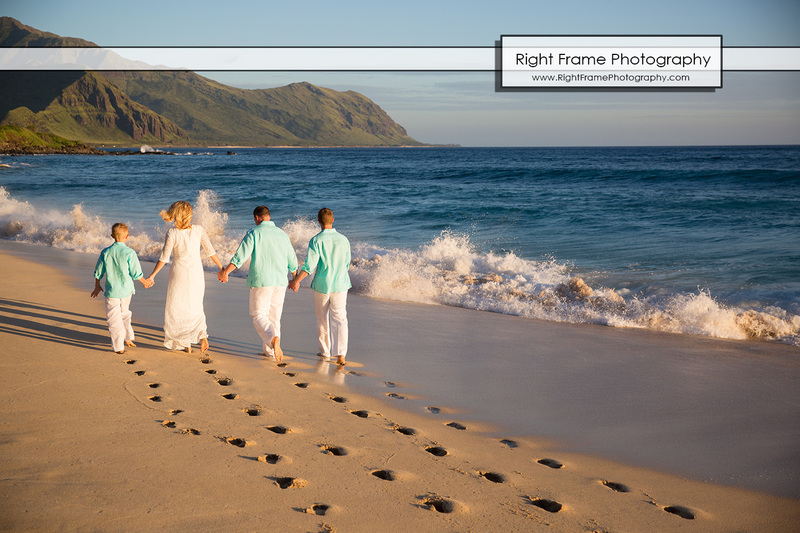 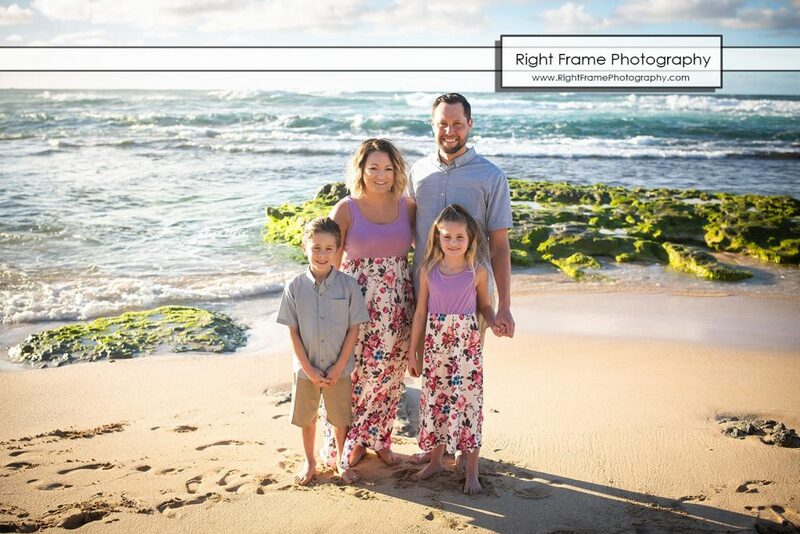 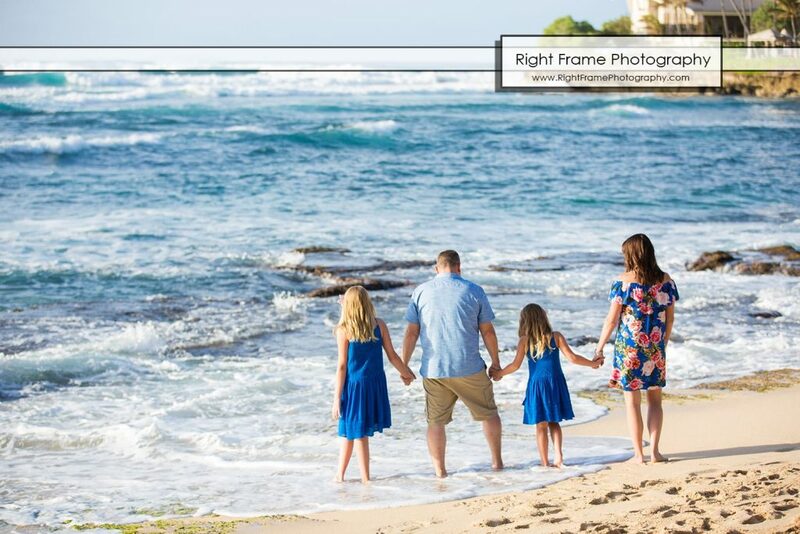 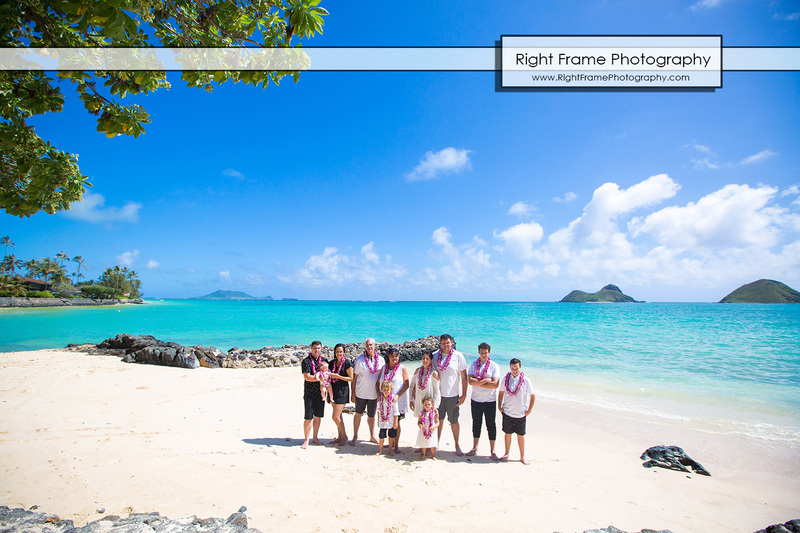 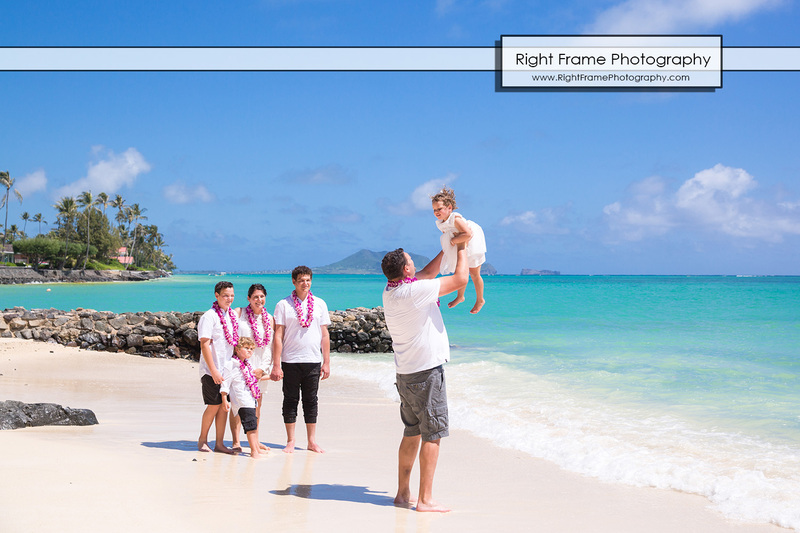 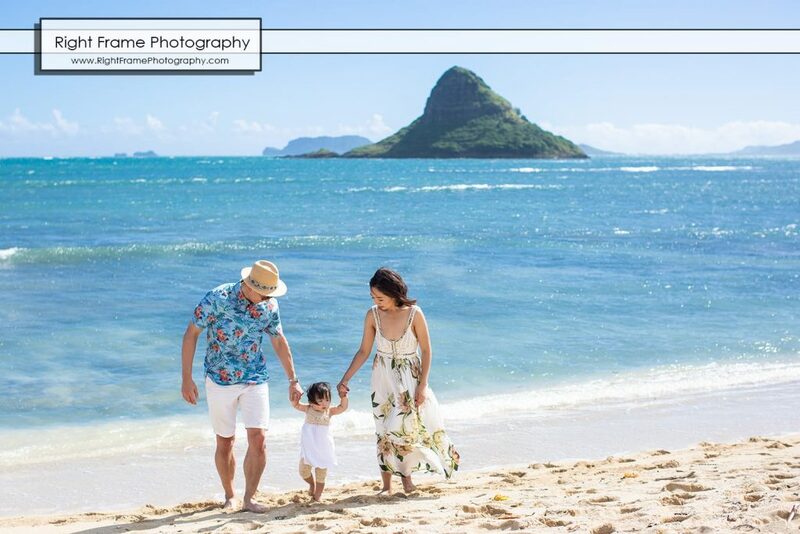 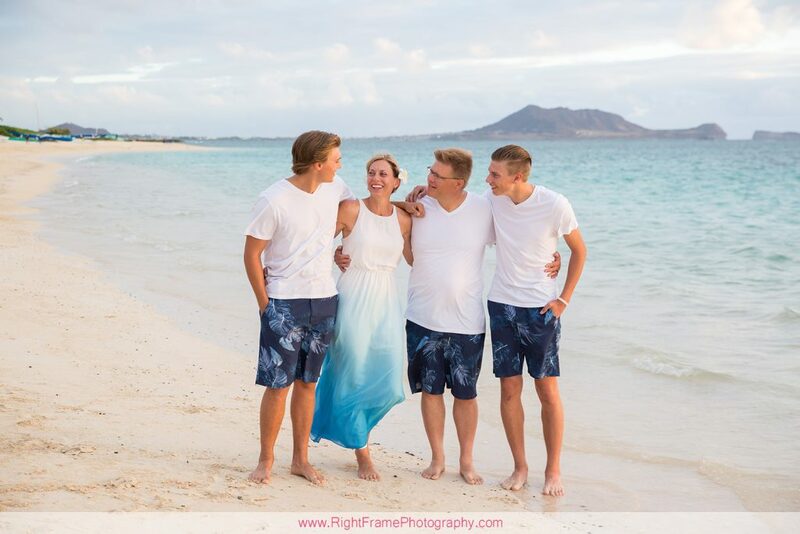 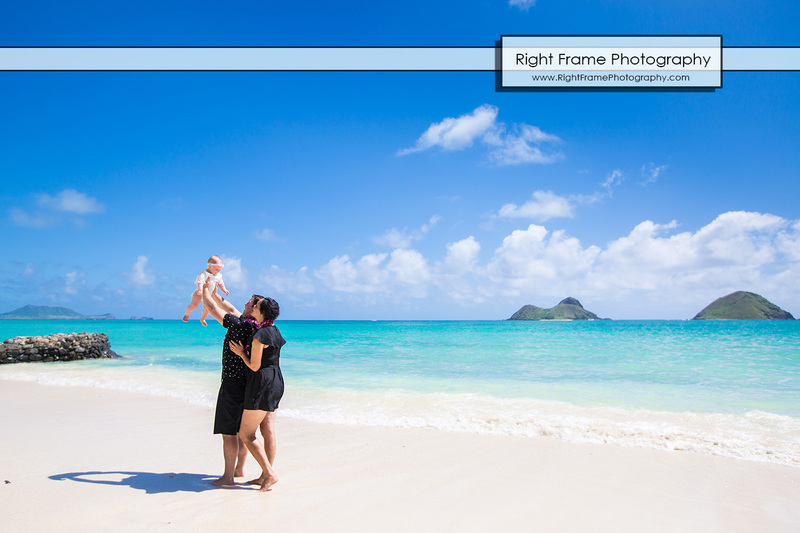 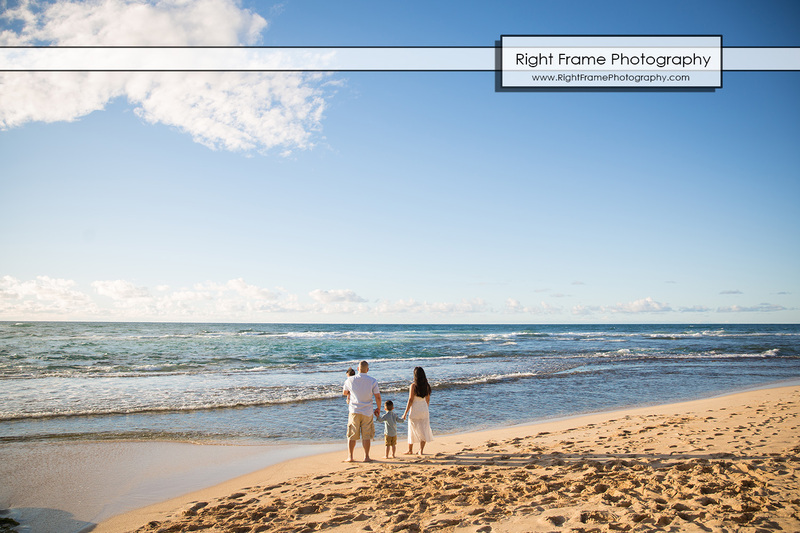 Rachael’s Family Portraits was shoot at Makapu’u Beach, Oahu Hawaii. 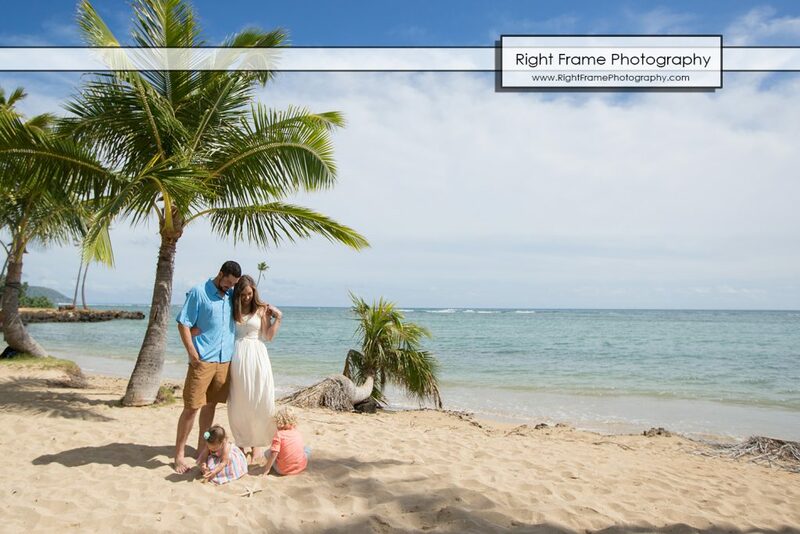 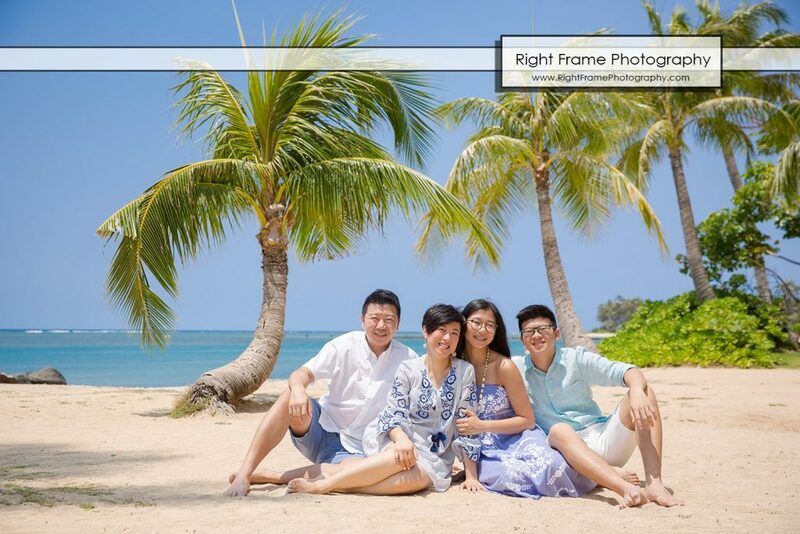 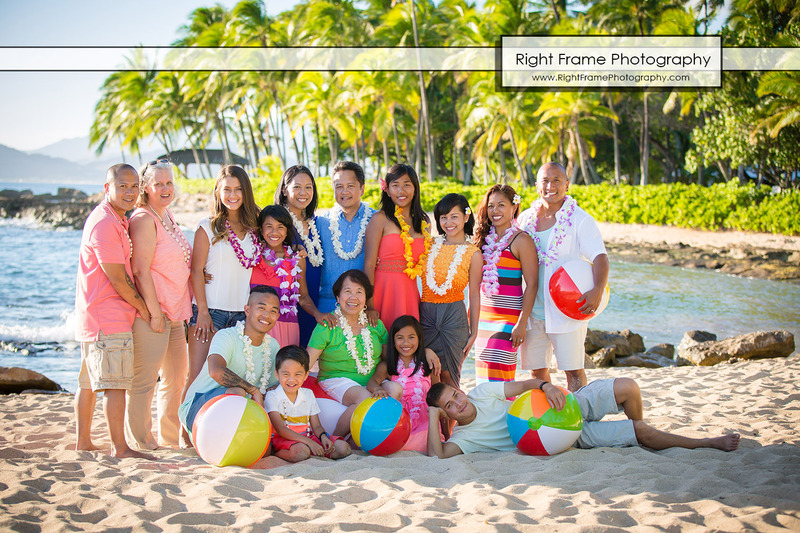 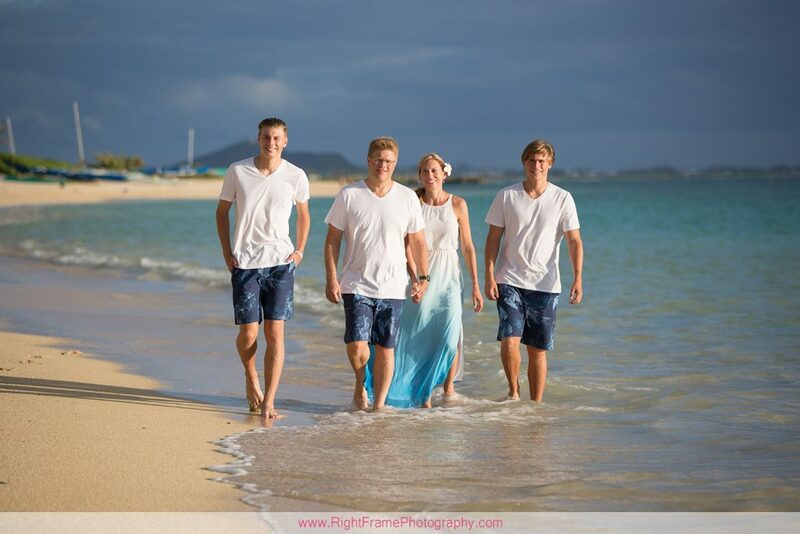 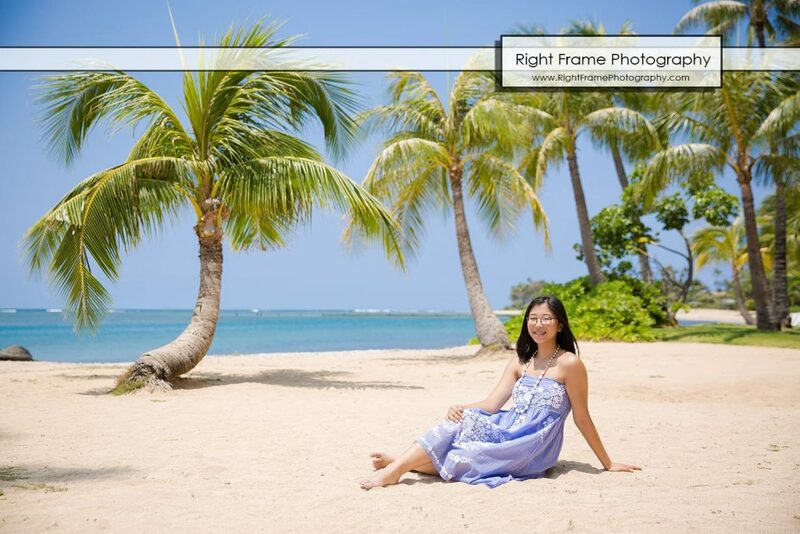 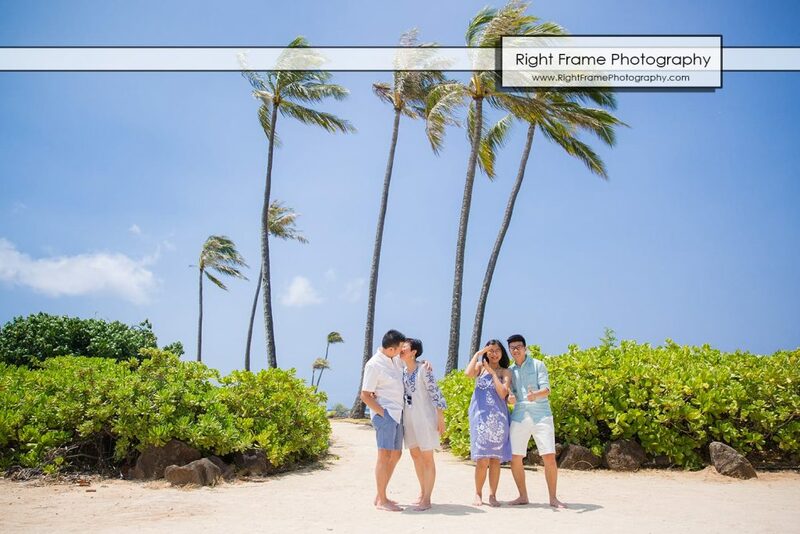 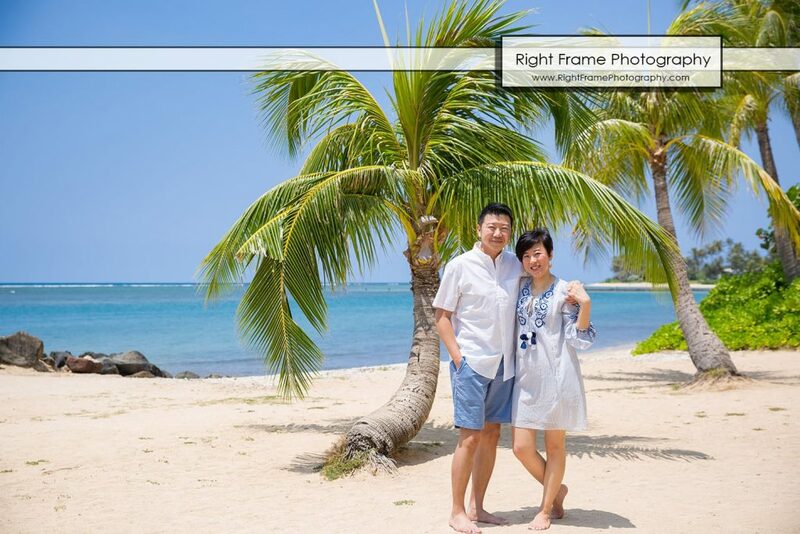 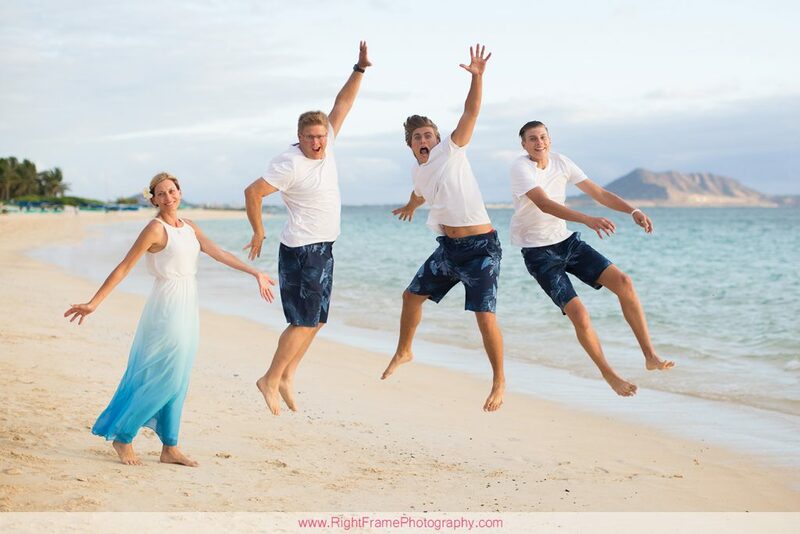 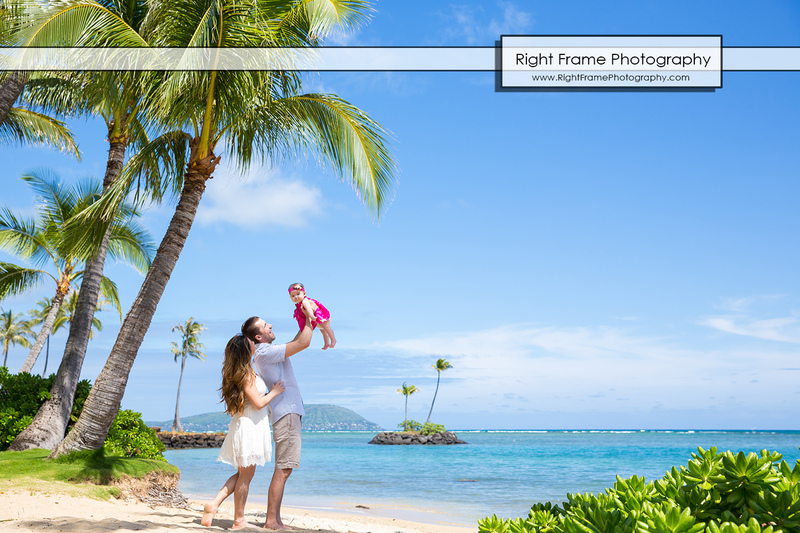 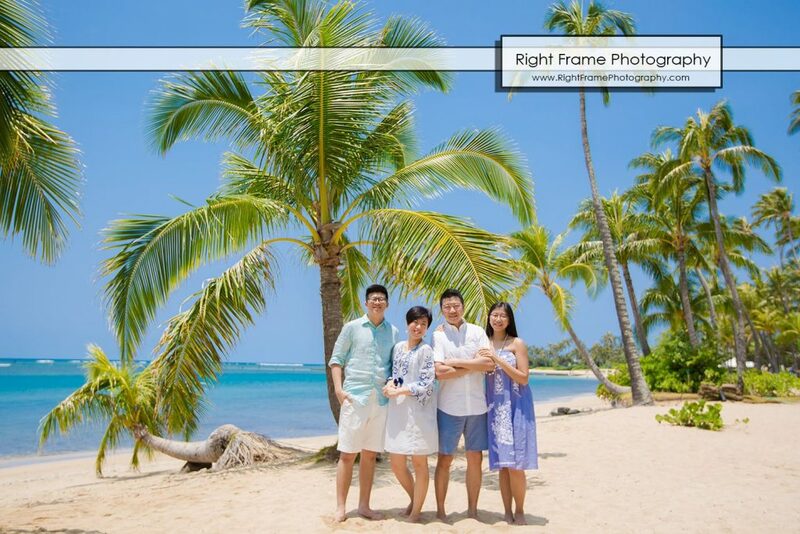 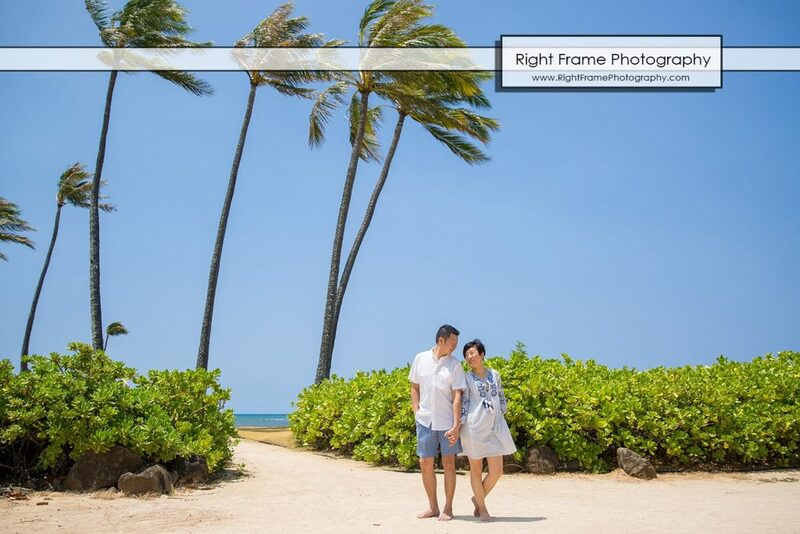 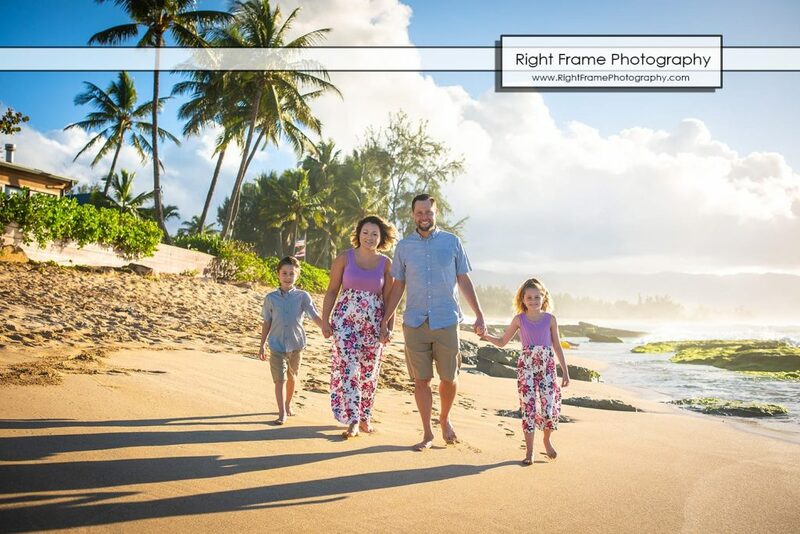 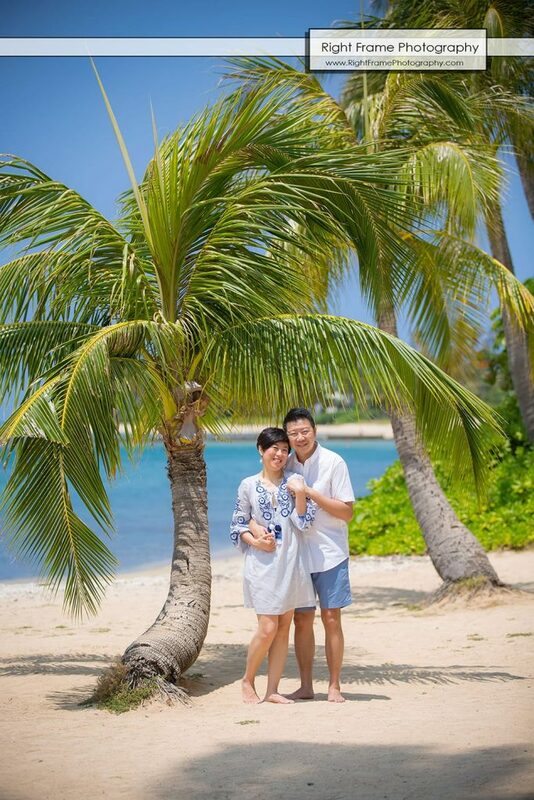 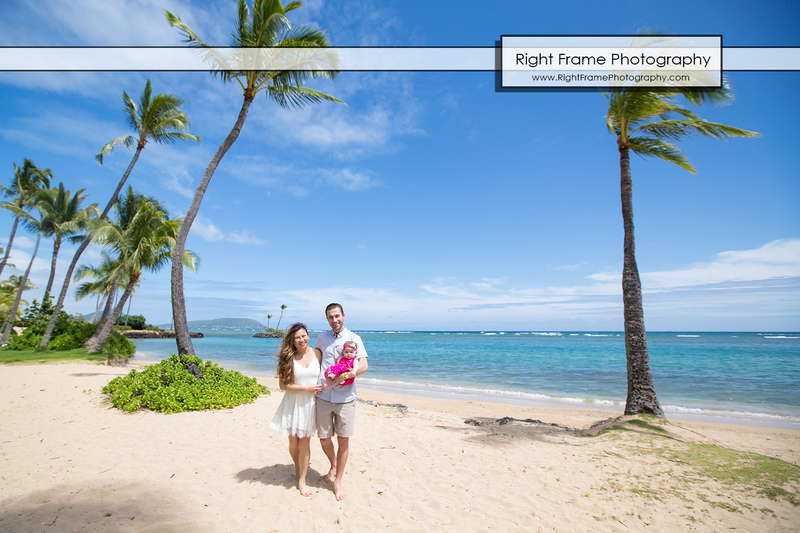 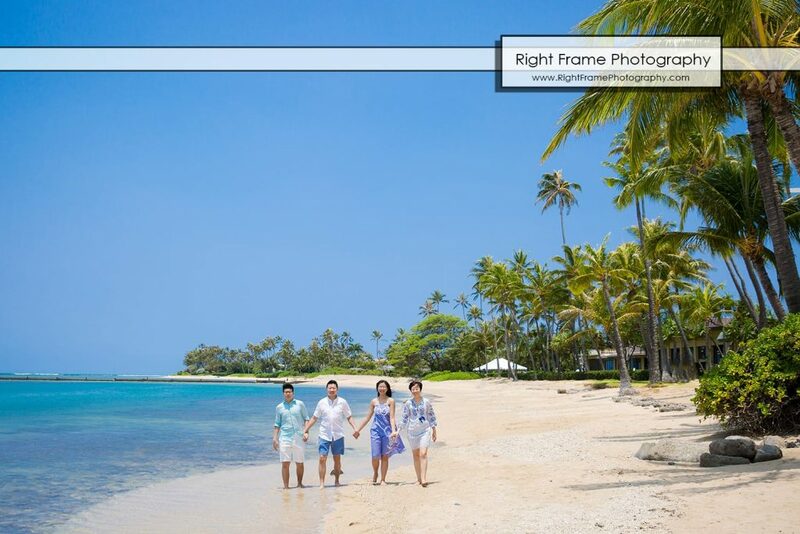 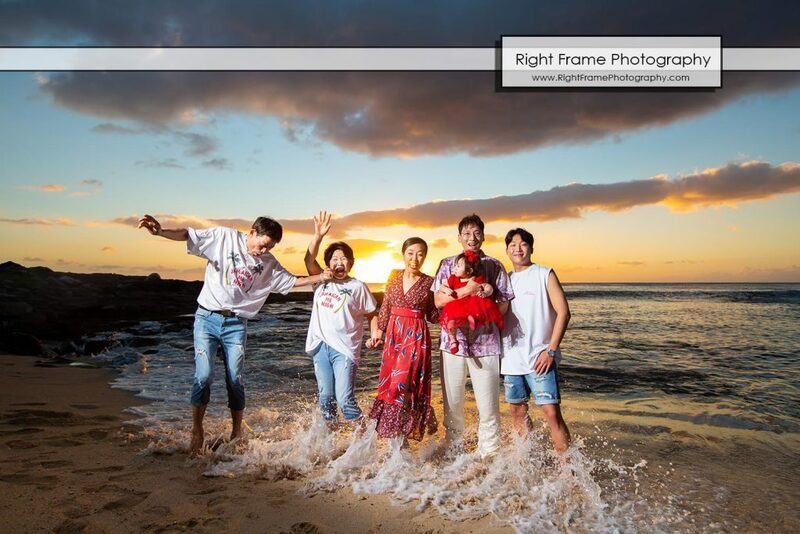 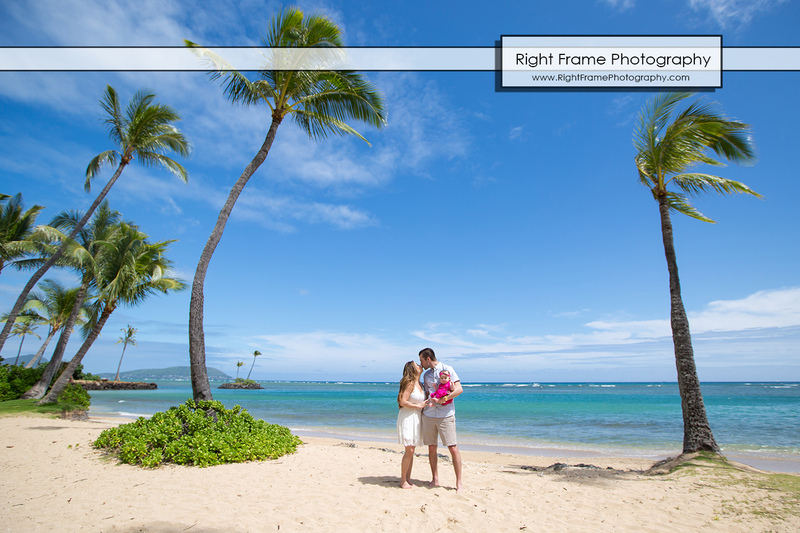 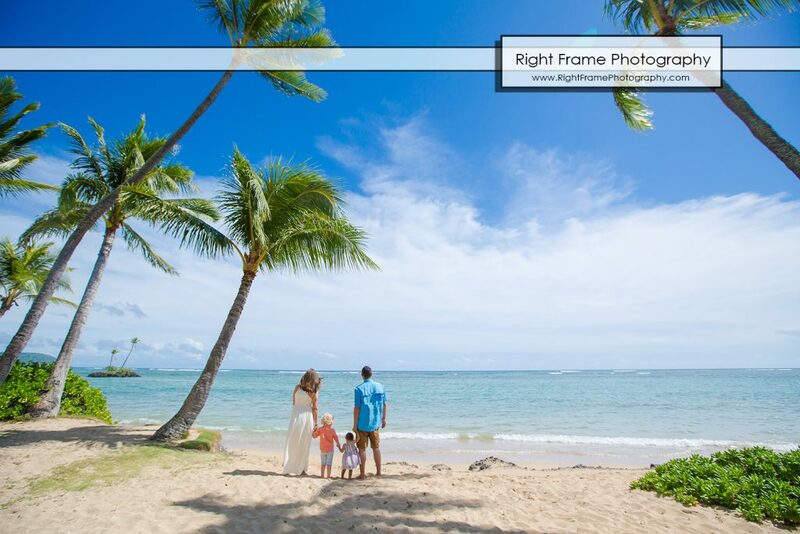 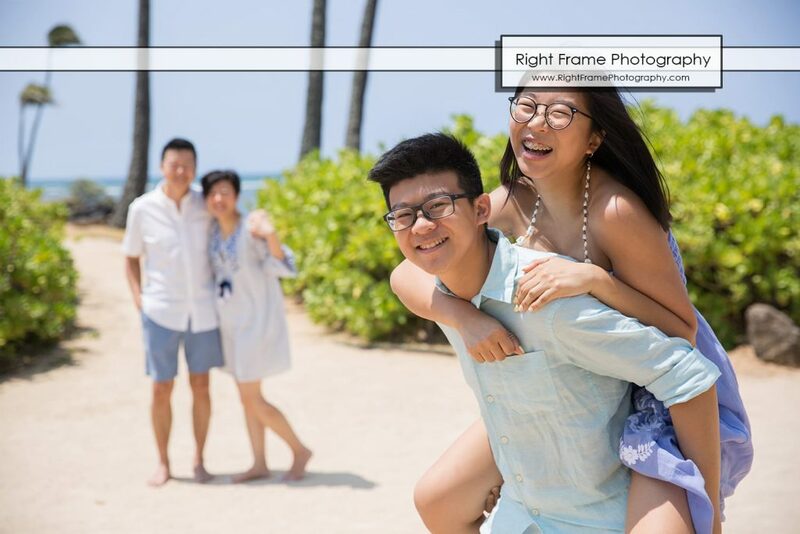 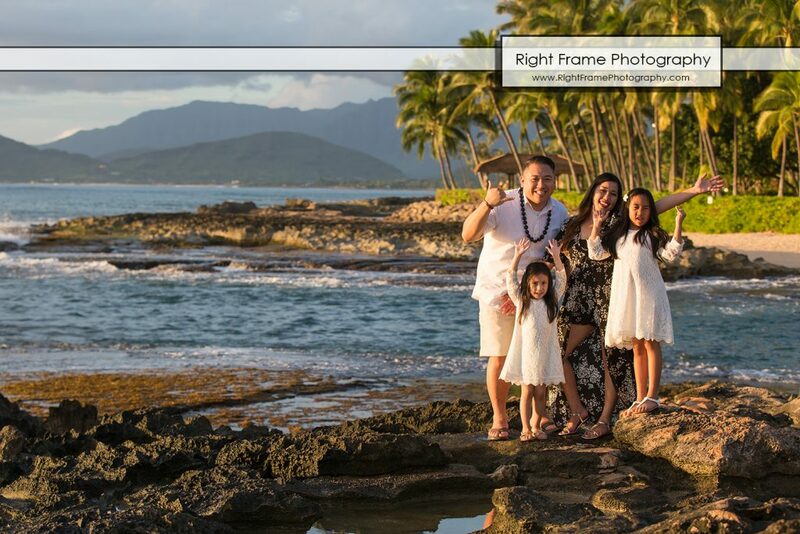 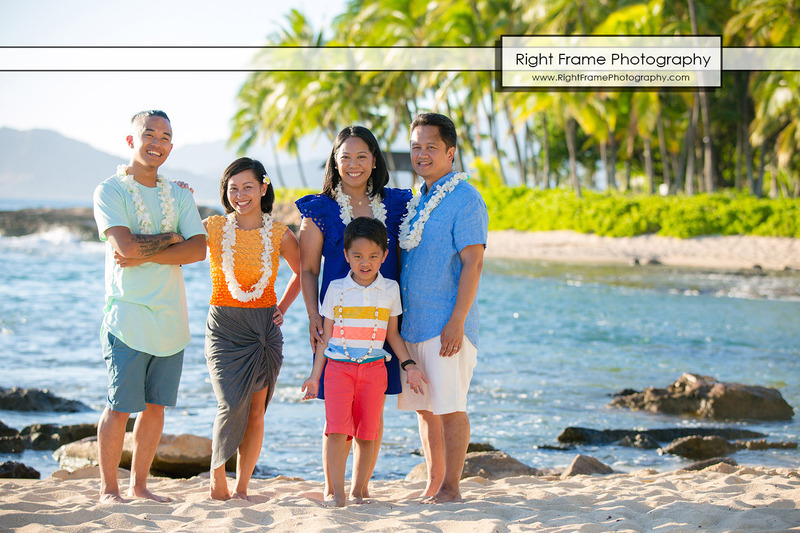 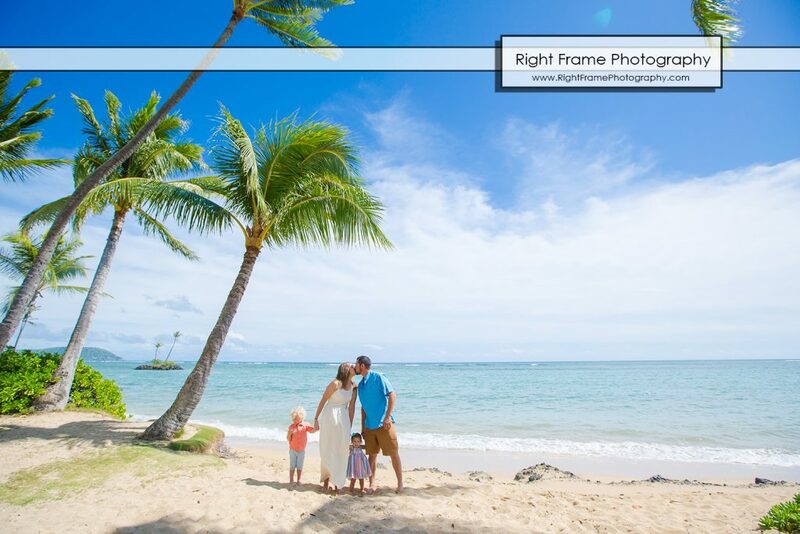 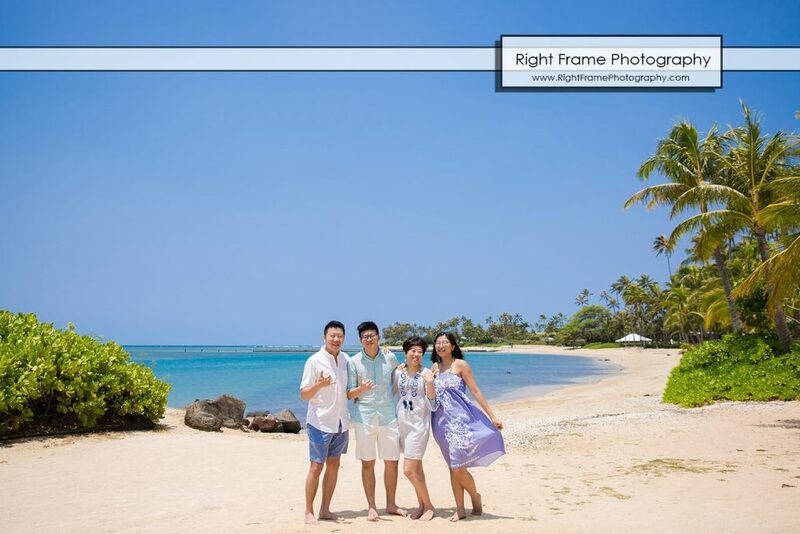 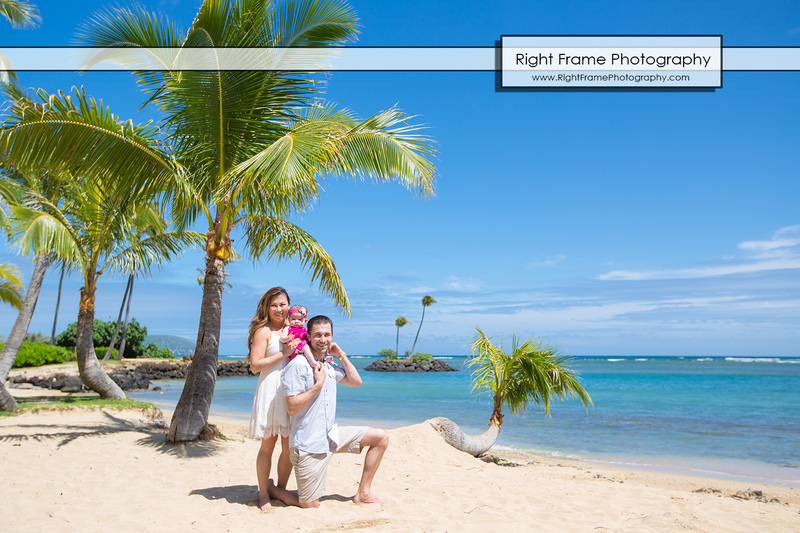 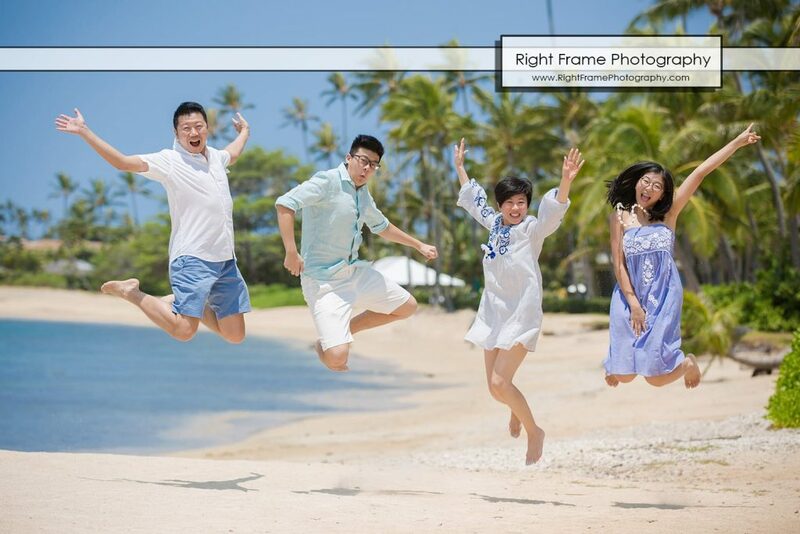 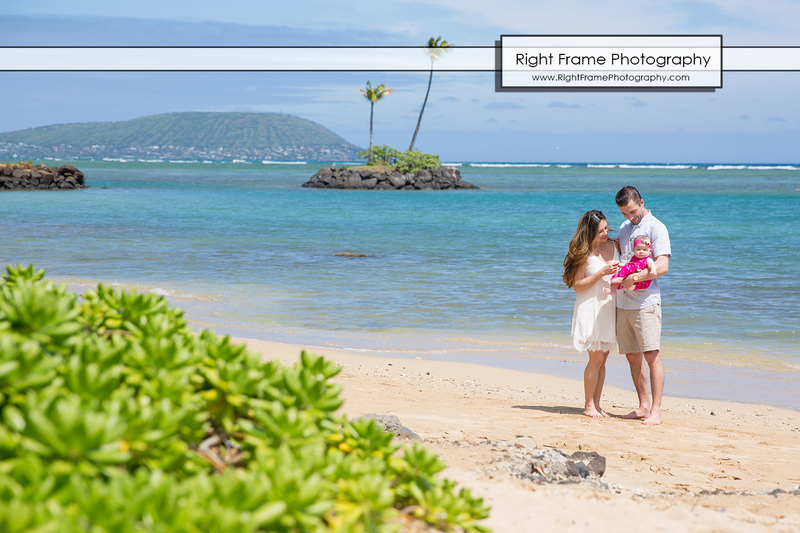 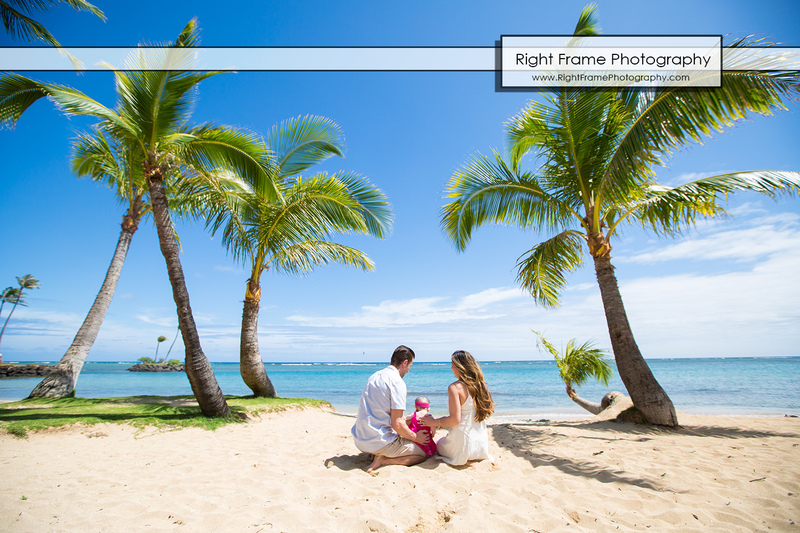 Christine’s Family Portraits at Kahala Beach, (near The Kahala Hotel & Resort), Oahu Hawaii. 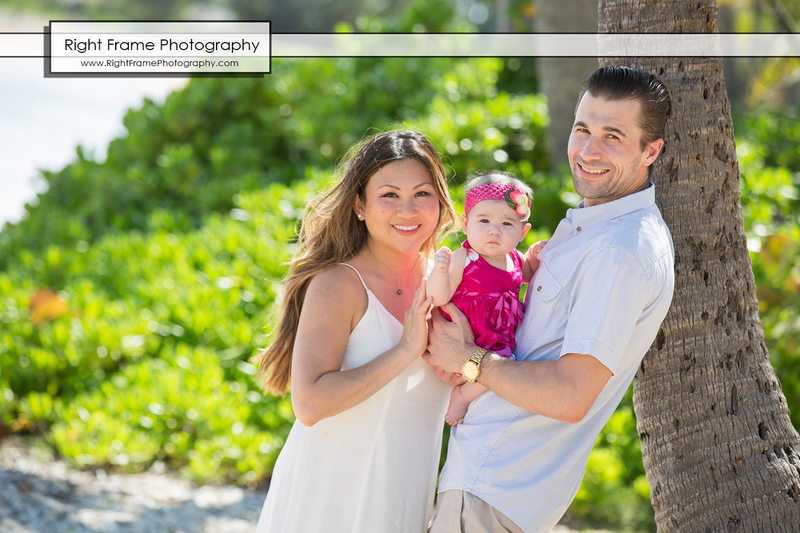 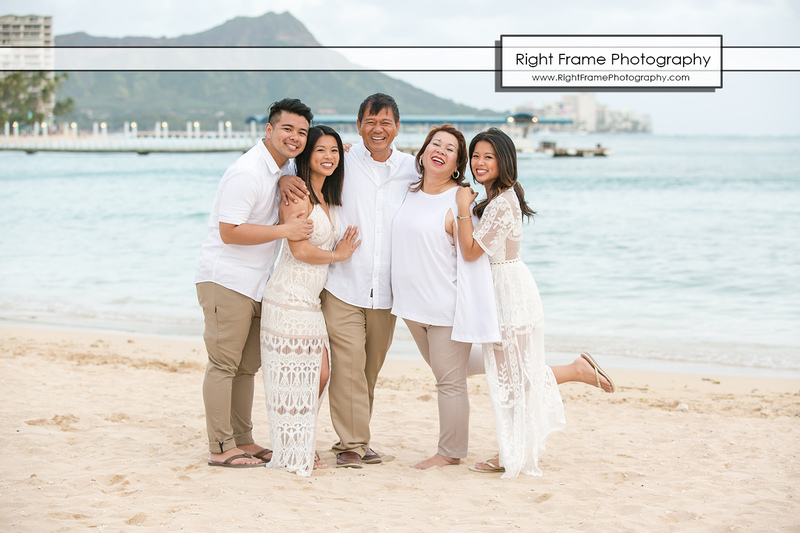 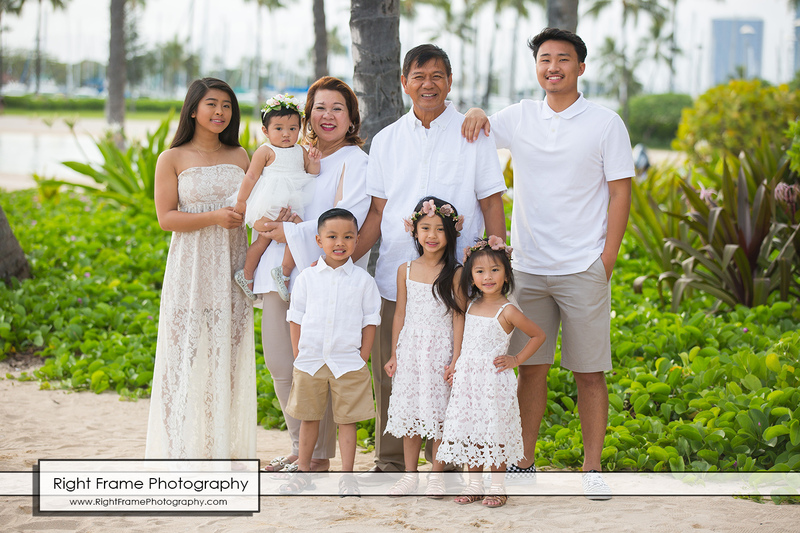 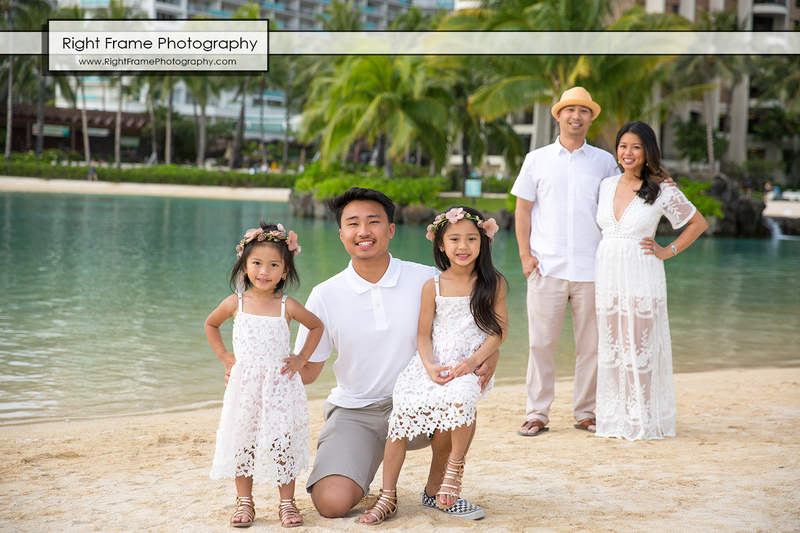 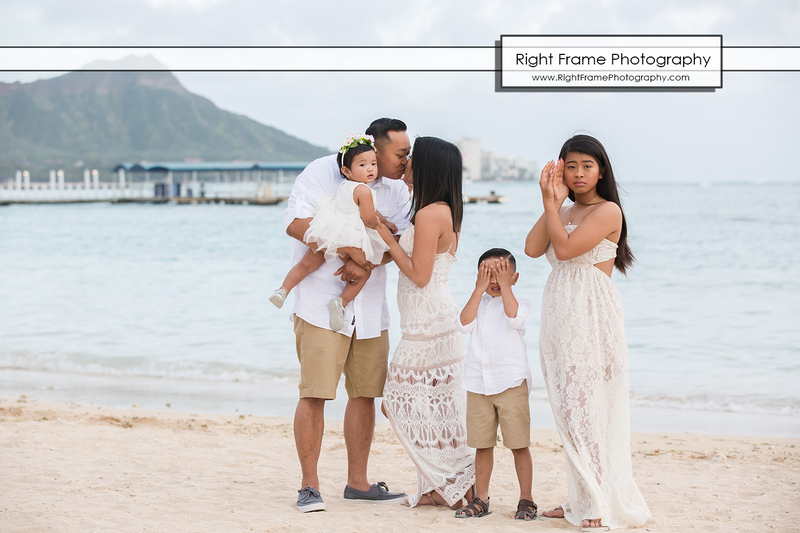 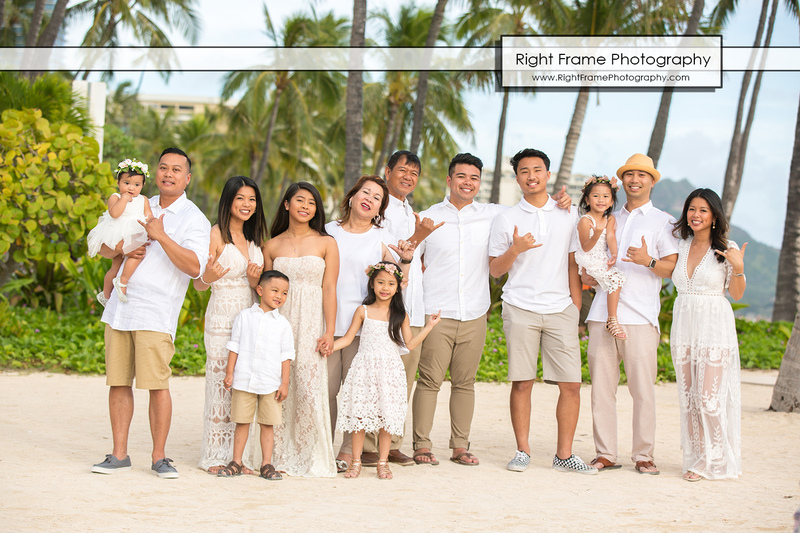 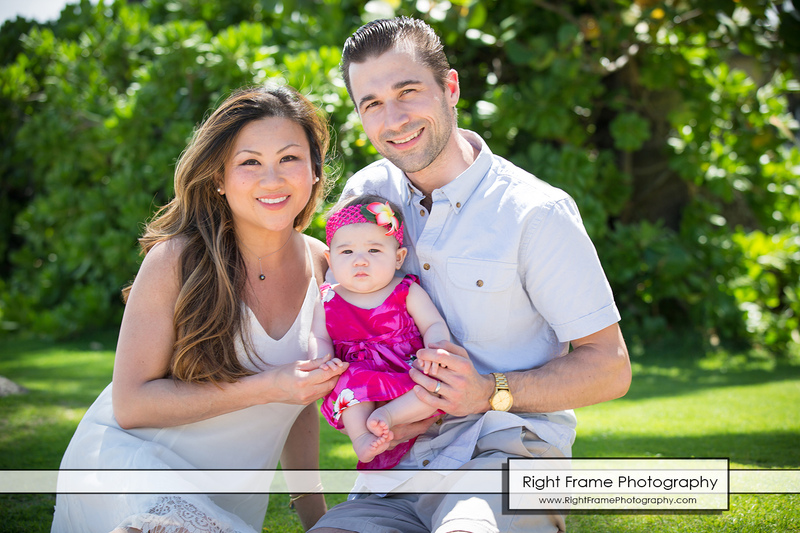 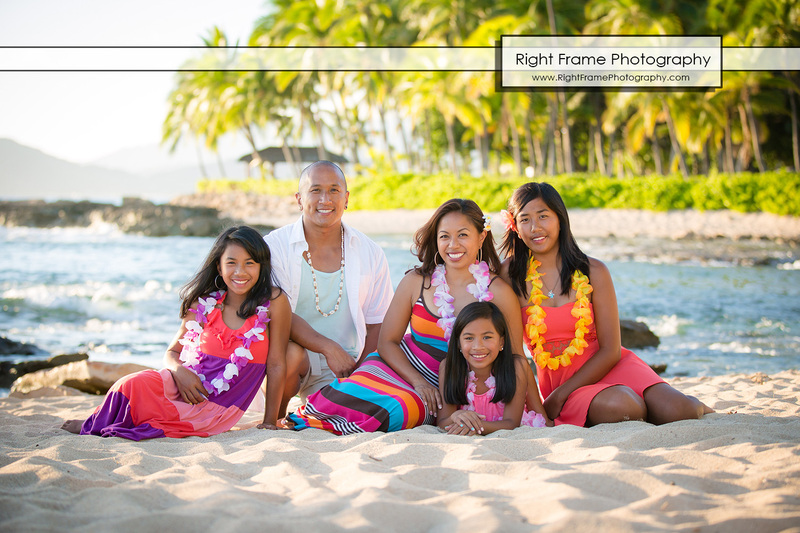 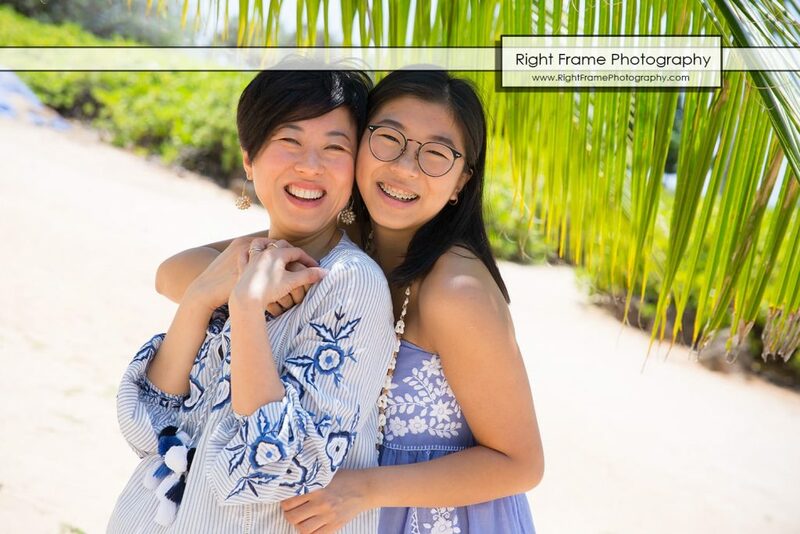 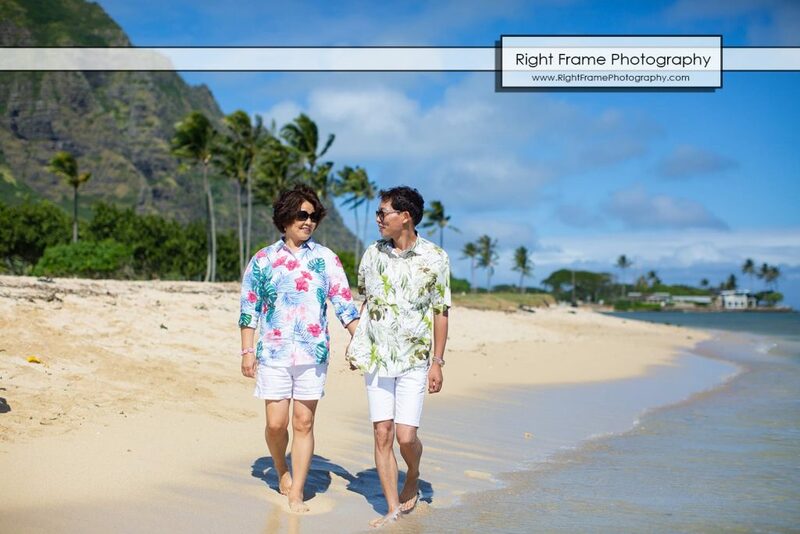 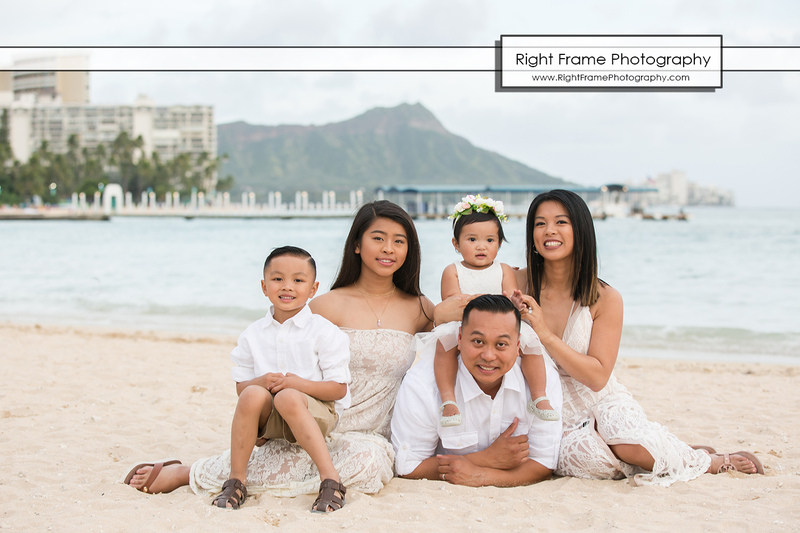 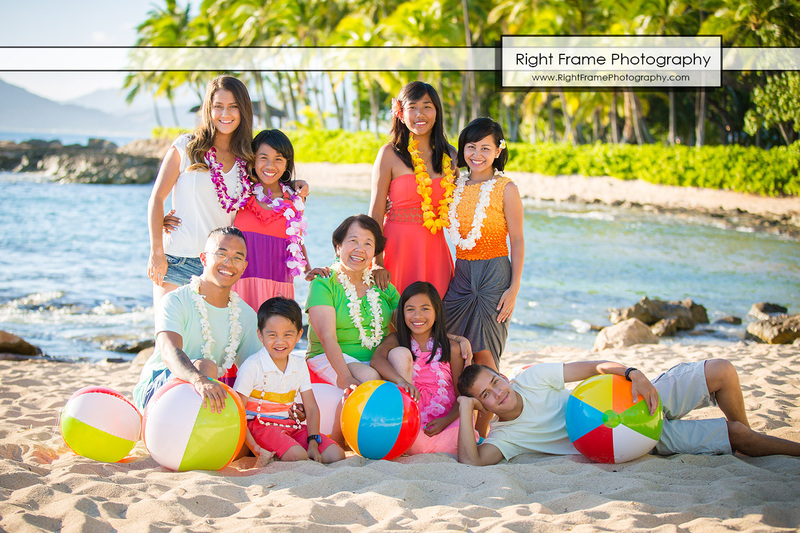 Christia’s Family Portraits was shoot at Waikiki Beach, (near Ilikai Hotel), Oahu HI. 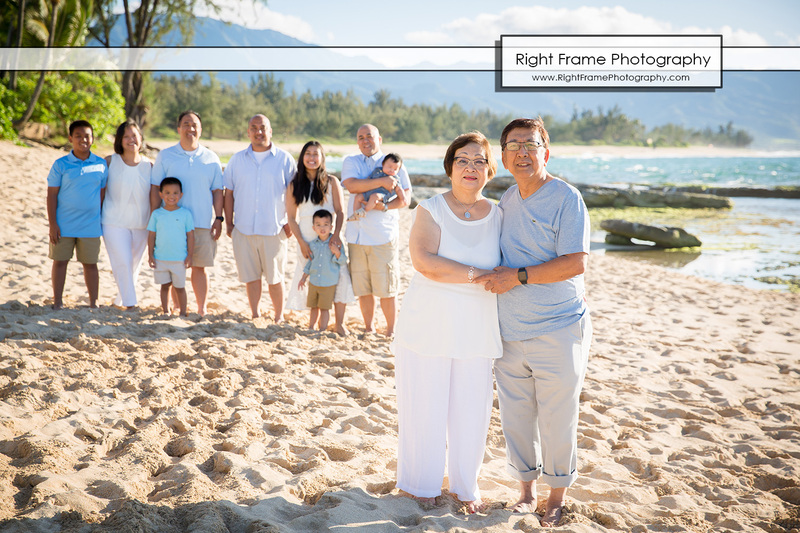 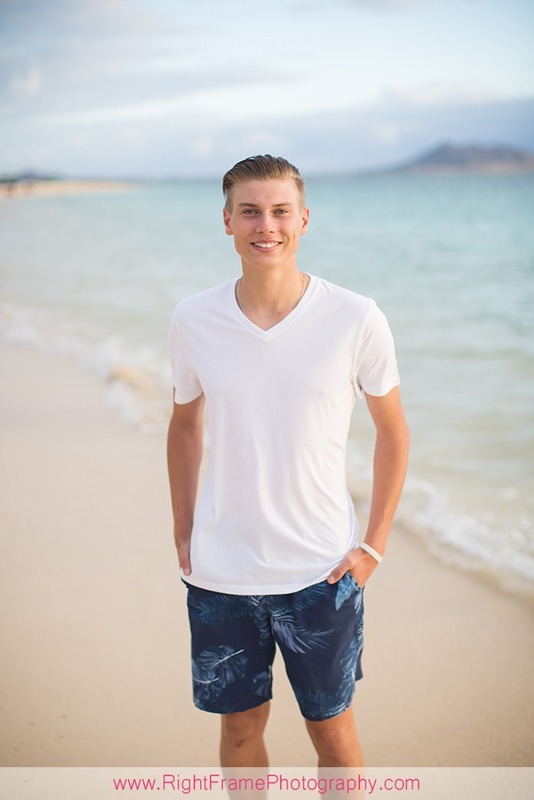 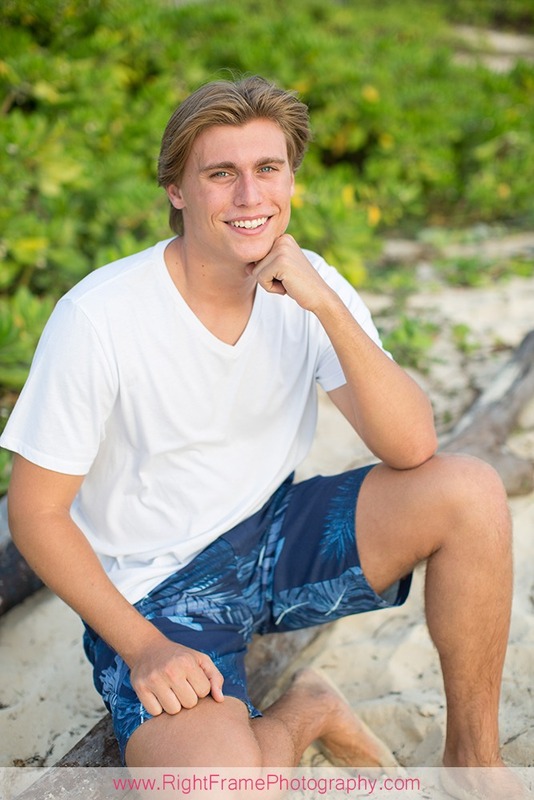 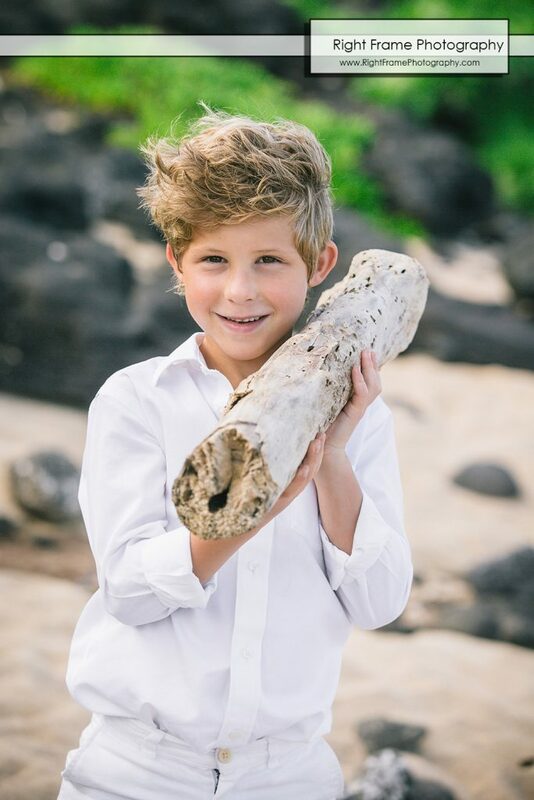 Robert’s Family Reunion Portraits was shoot at Papailoa Beach, (near Haleiwa Town, North Shore), Oahu HI. 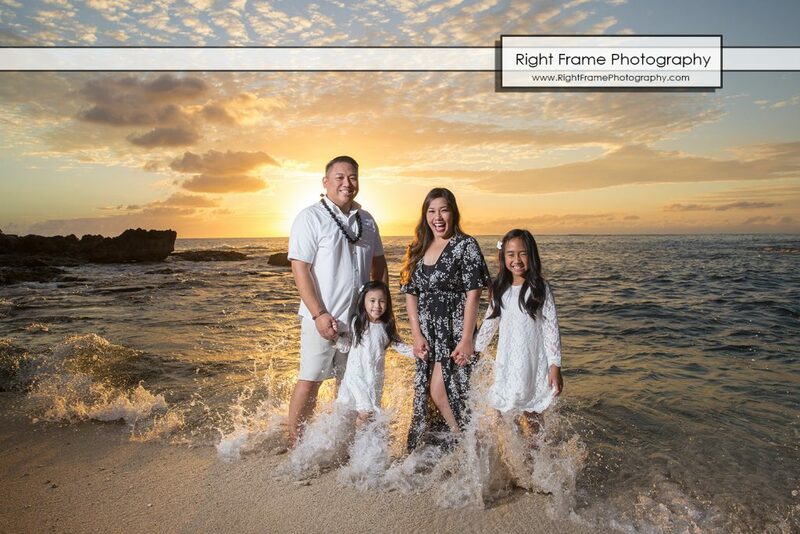 Erica’s Sunset Family Portraits at Secret Beach, right behind Four Seasons Resort Oahu, Oahu, Hawaii. 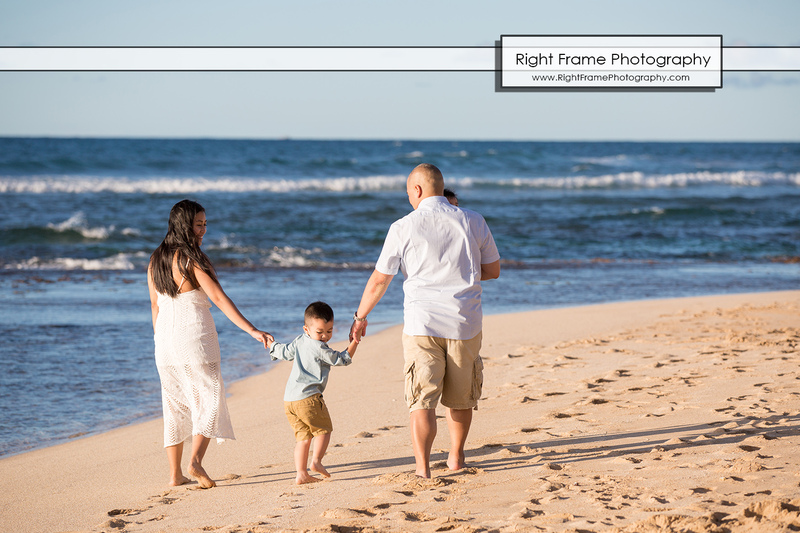 Wendy’s Family Sunset Beach Portraits at Yokohama Beach (Kaena Point), Oahu, Hawaii. 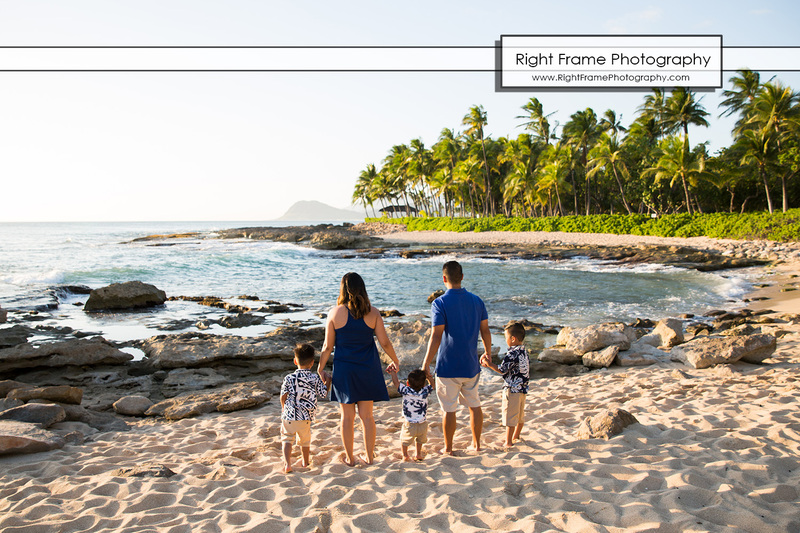 Monica’s Family Beach Portraits at Makapu’u Beach, Oahu, Hawaii. 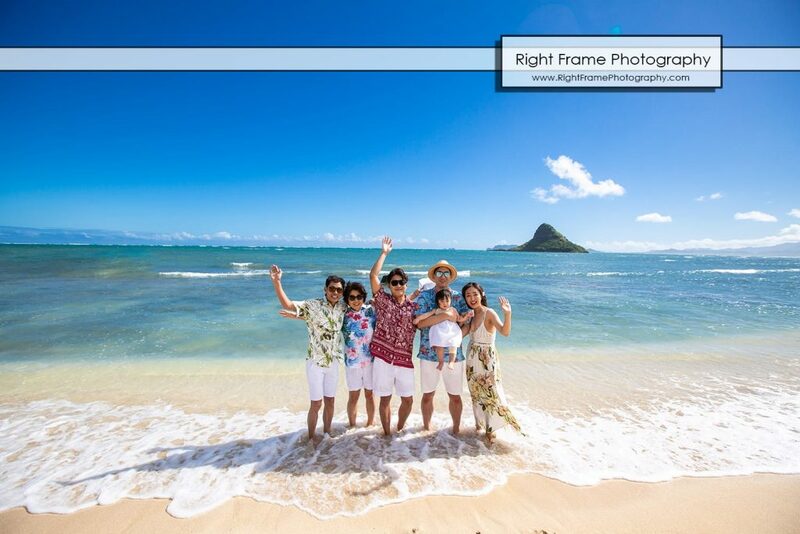 Karen’s Family Beach Portraits at Lanikai Beach, Oahu, Hawaii. 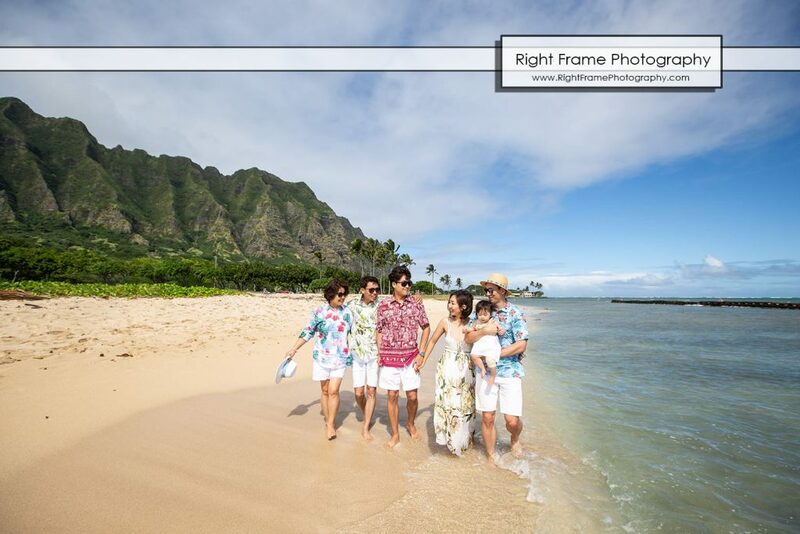 Karen’s Family Beach Portraits at Waimanalo Beach (Bellows Beach), Oahu, Hawaii.